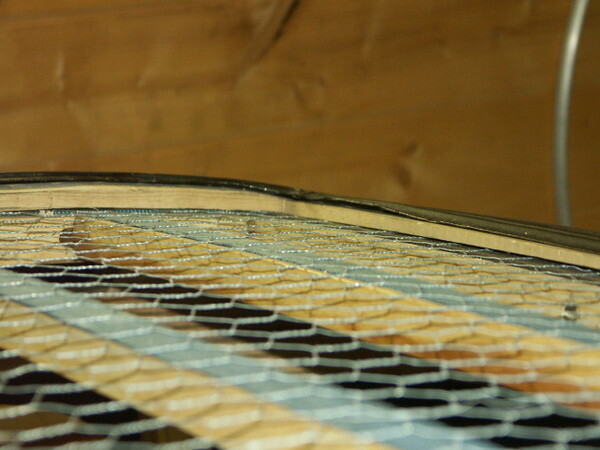 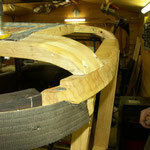 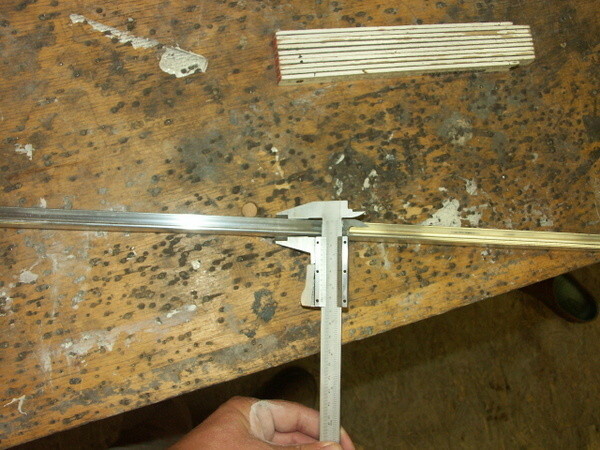 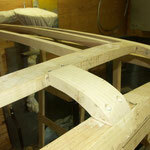 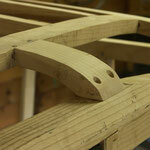 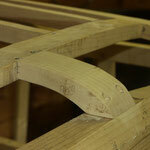 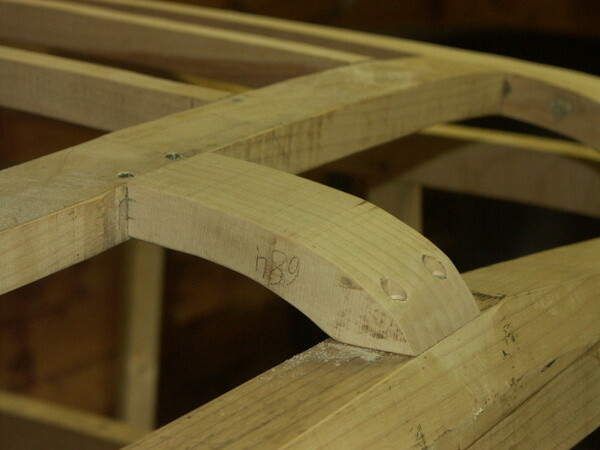 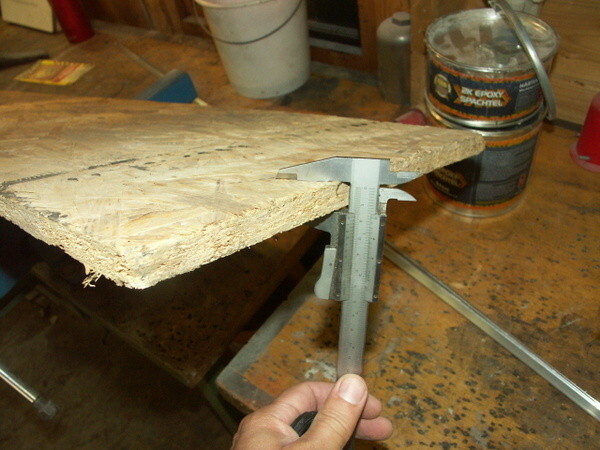 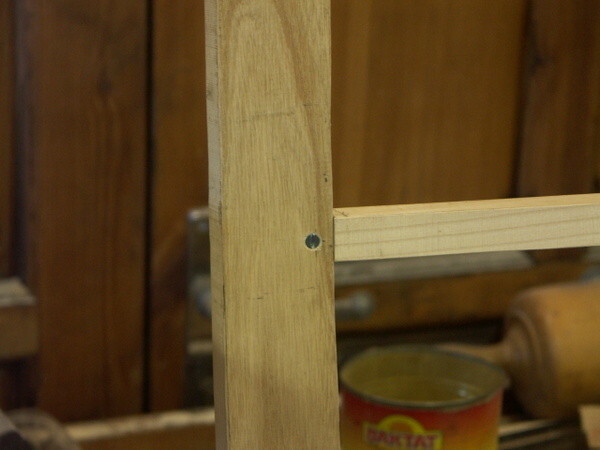 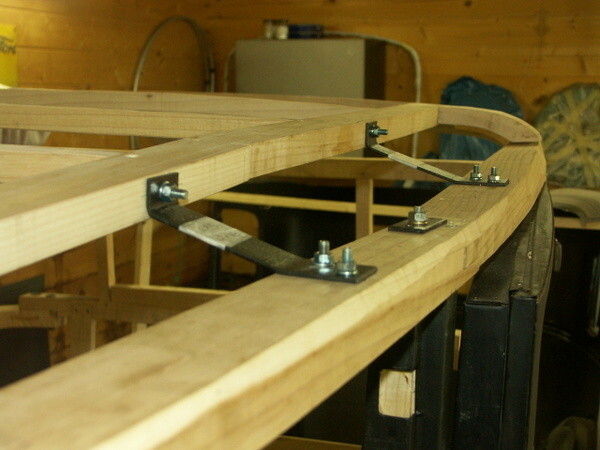 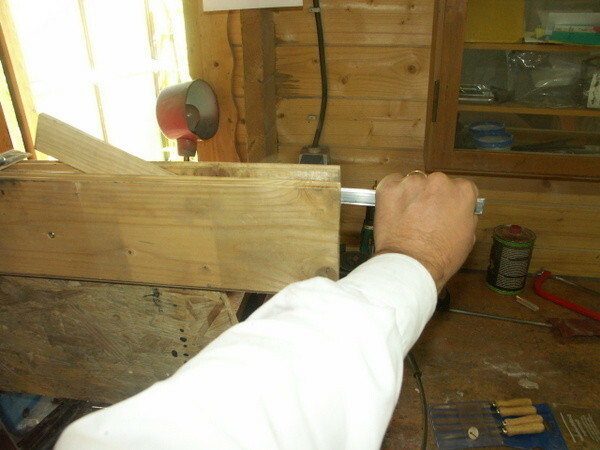 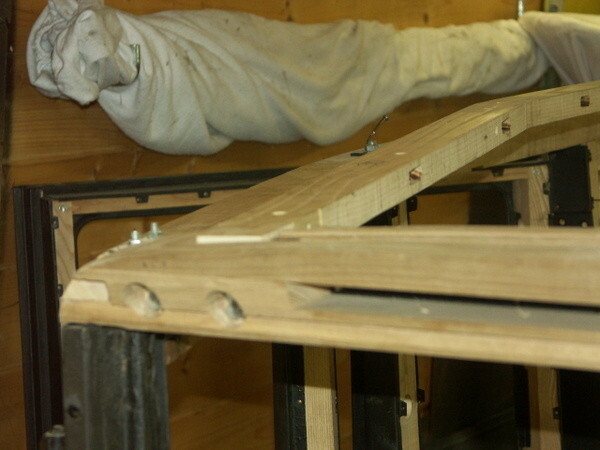 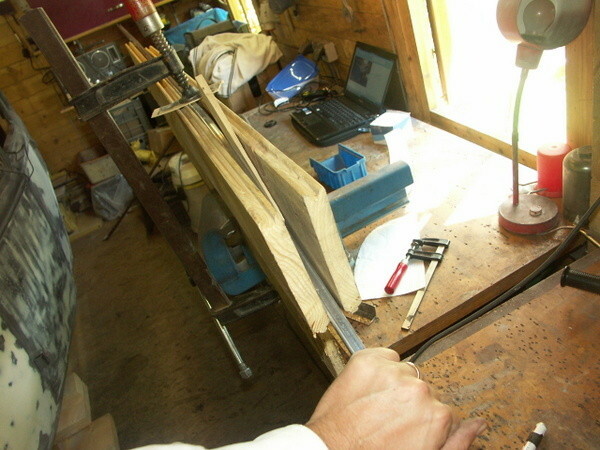 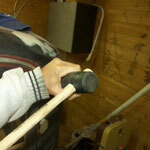 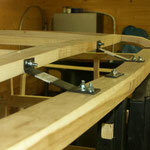 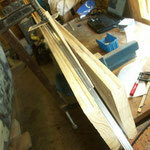 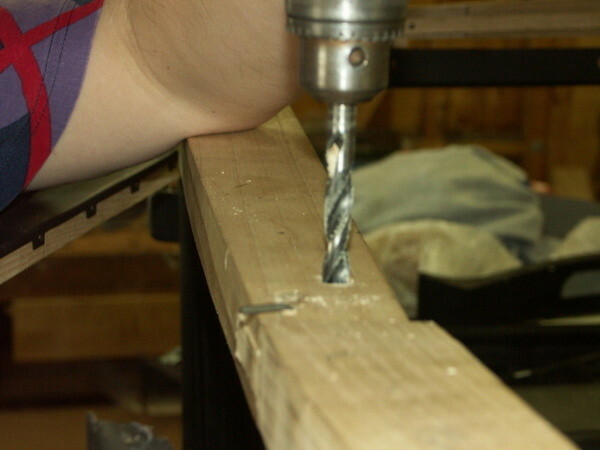 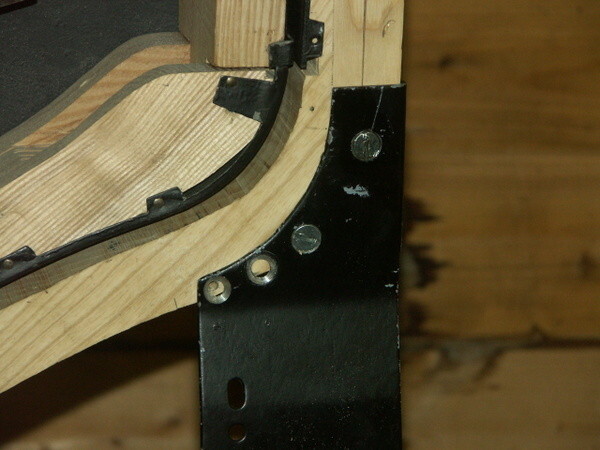 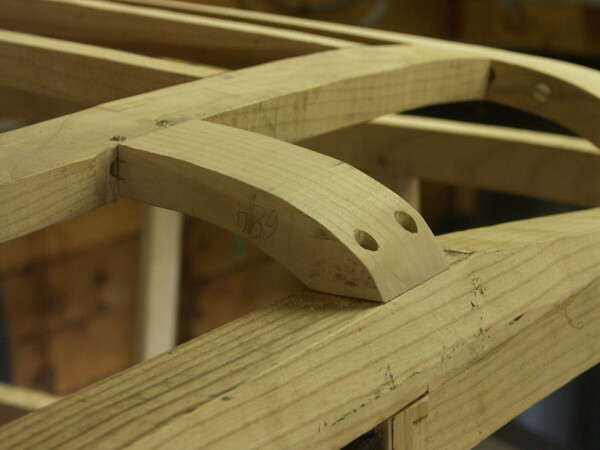 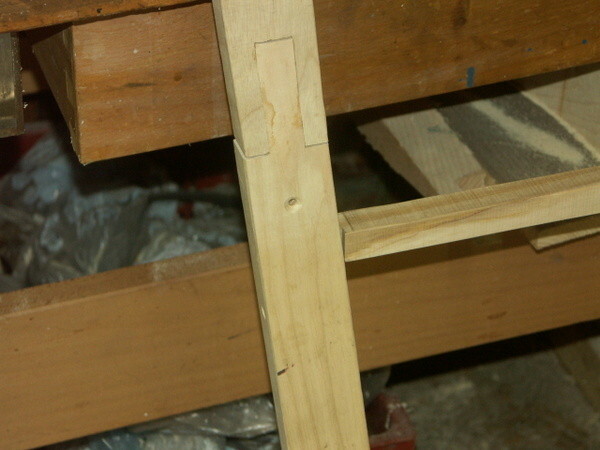 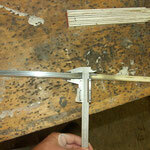 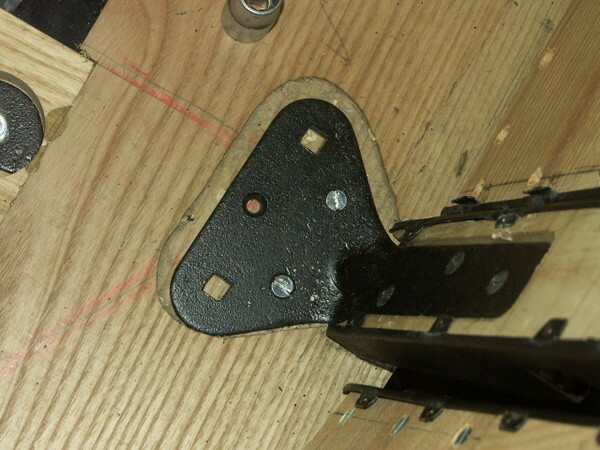 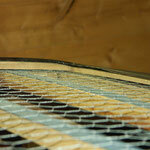 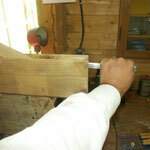 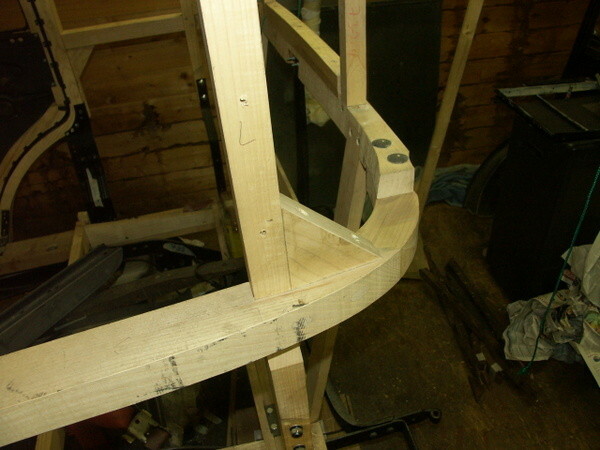 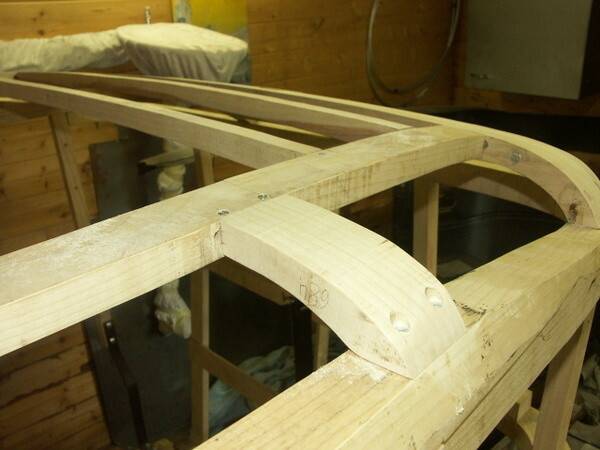 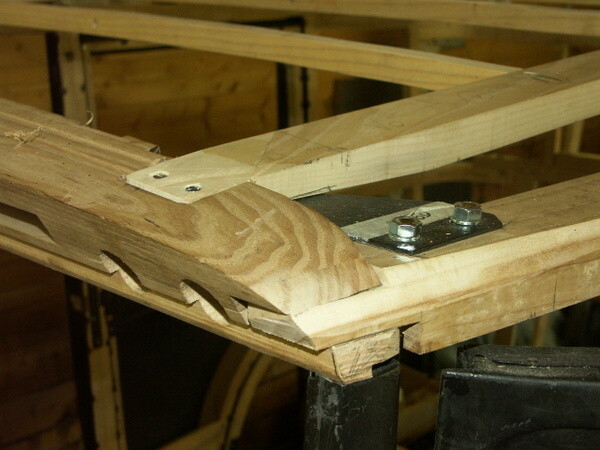 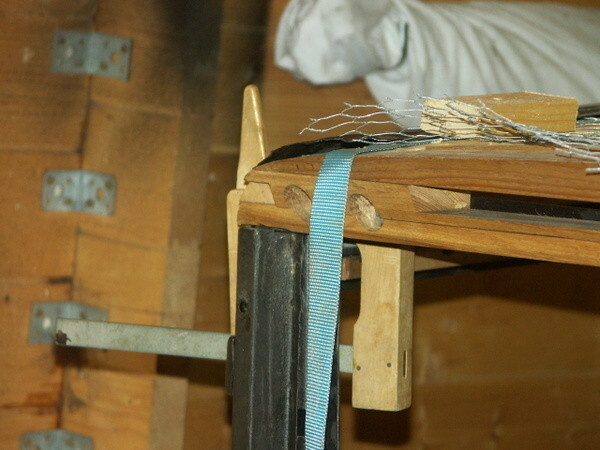 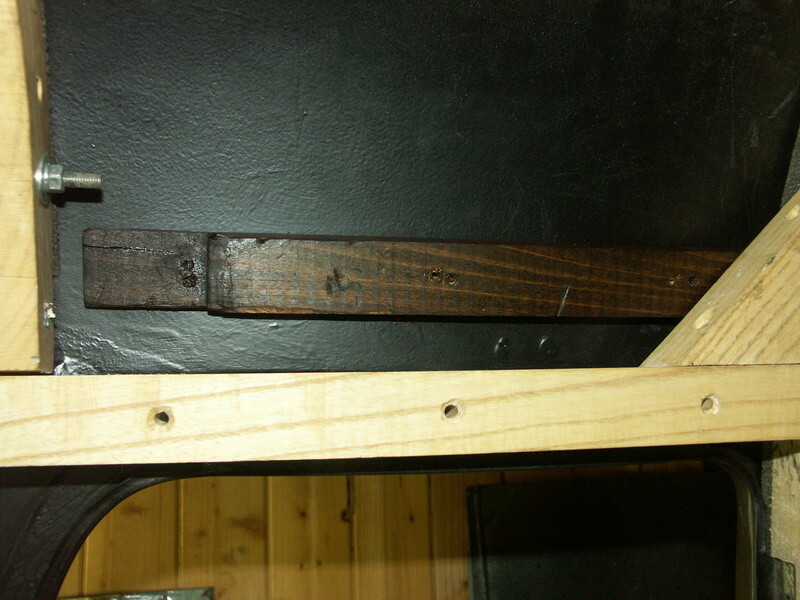 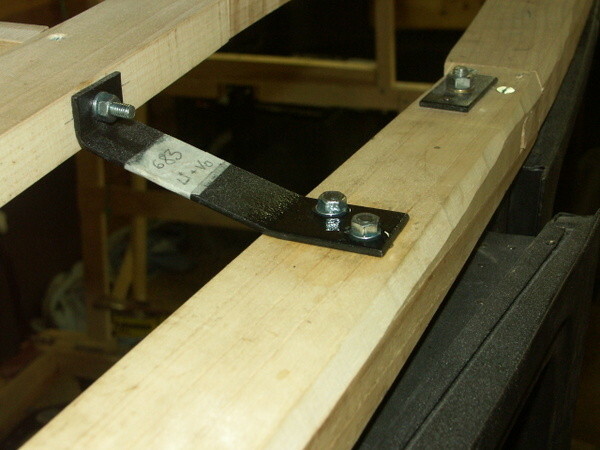 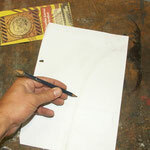 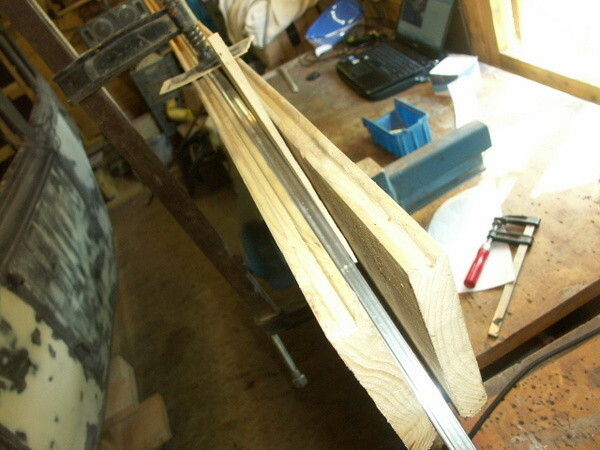 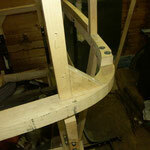 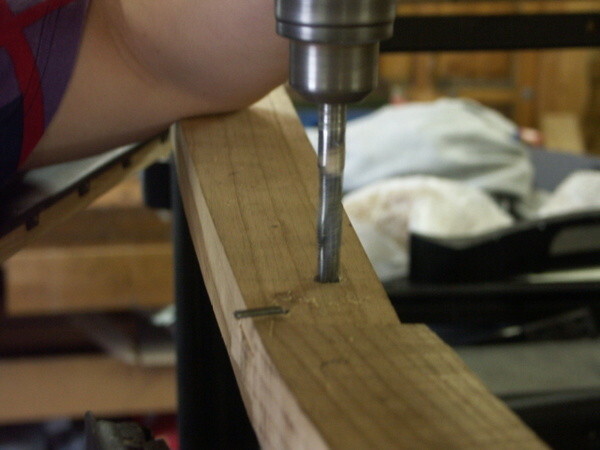 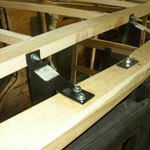 Here we describe how the wood fitting and body alignement is done. 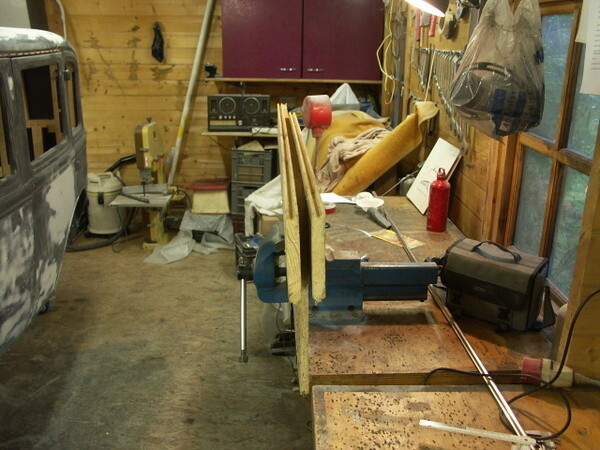 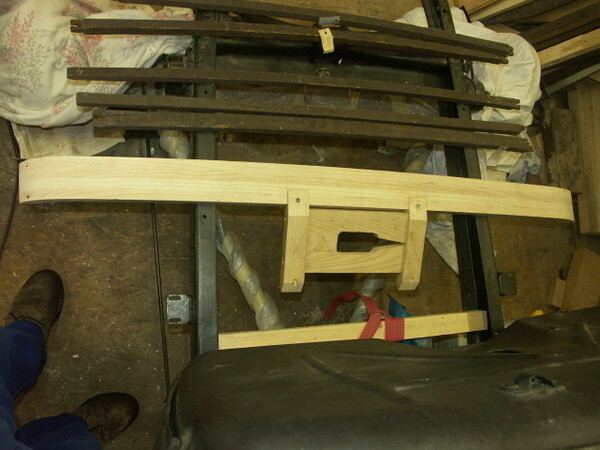 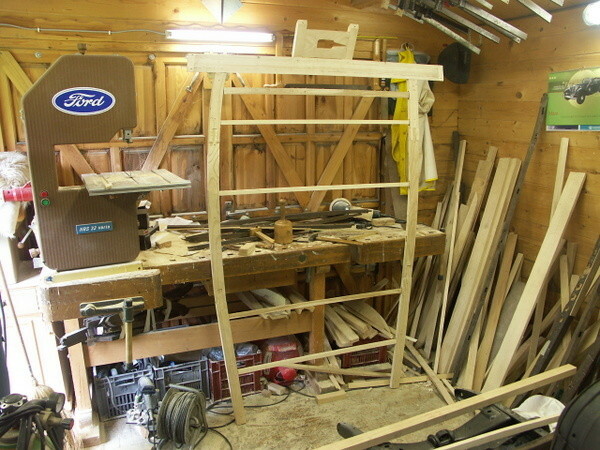 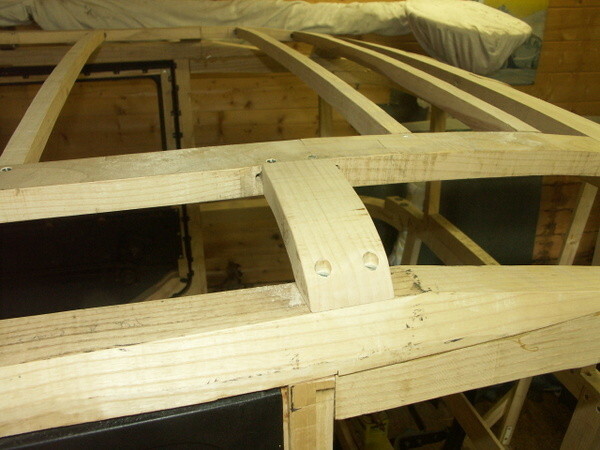 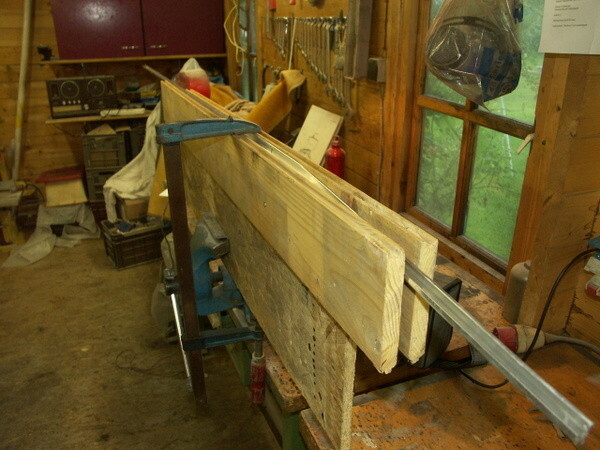 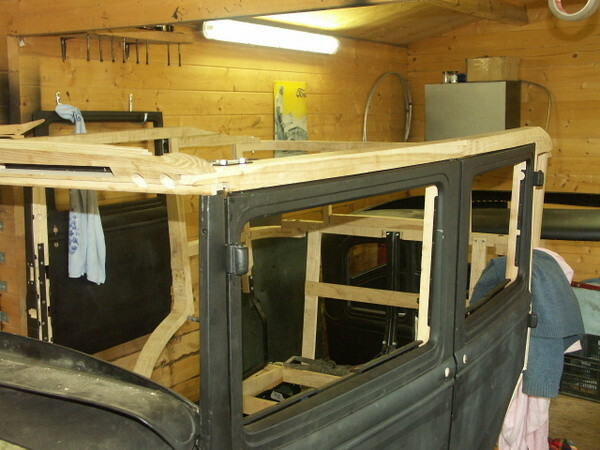 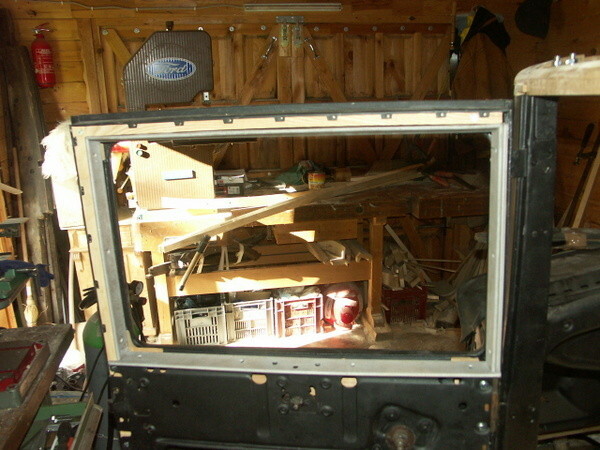 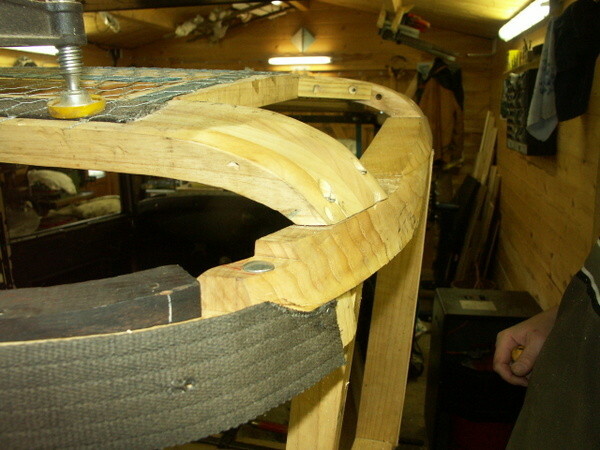 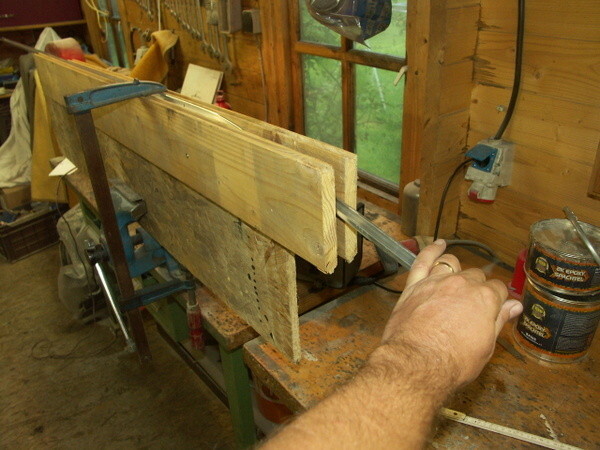 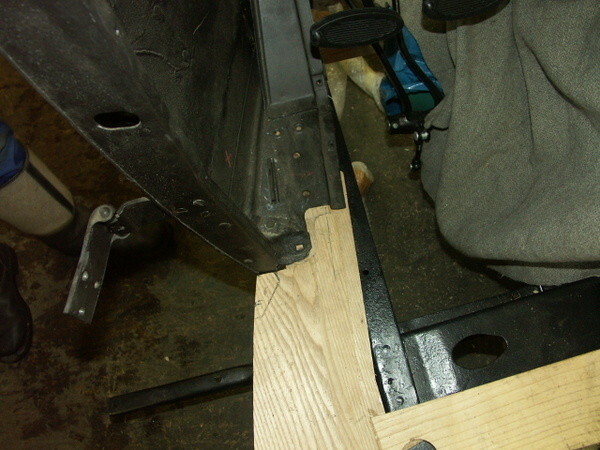 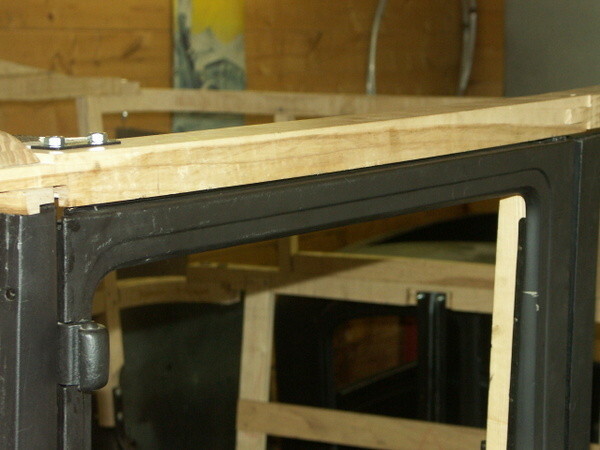 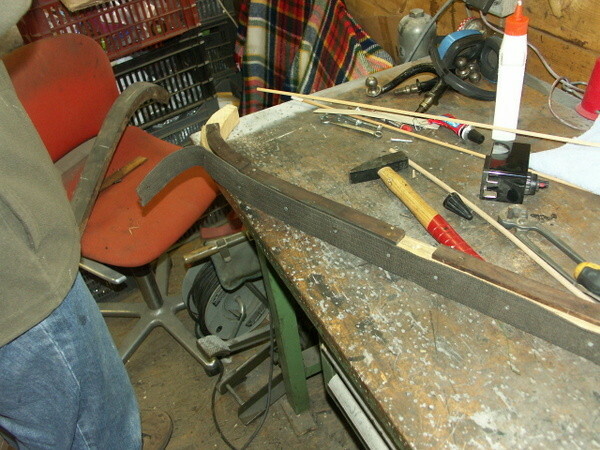 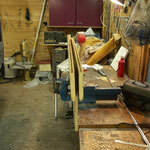 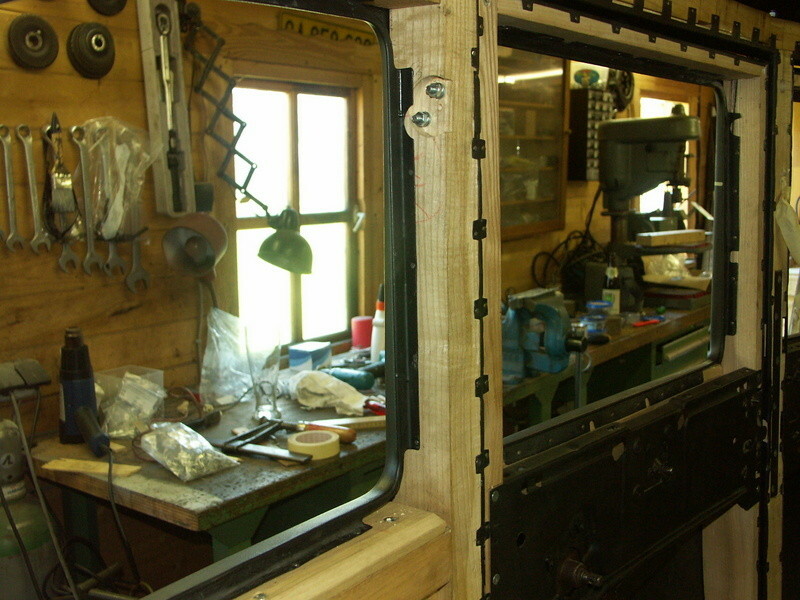 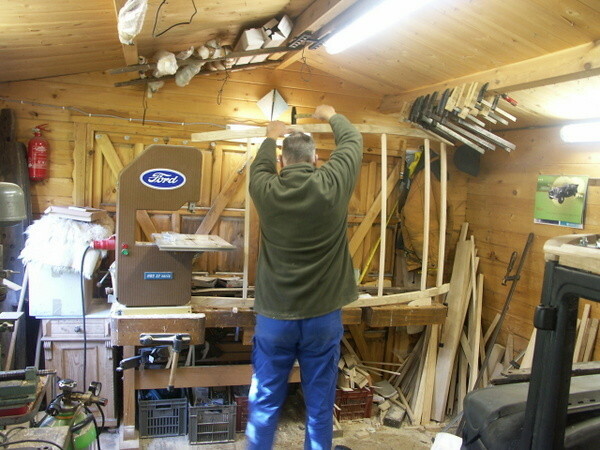 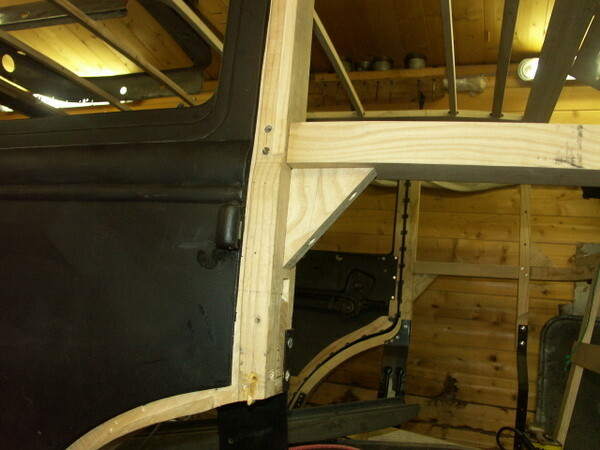 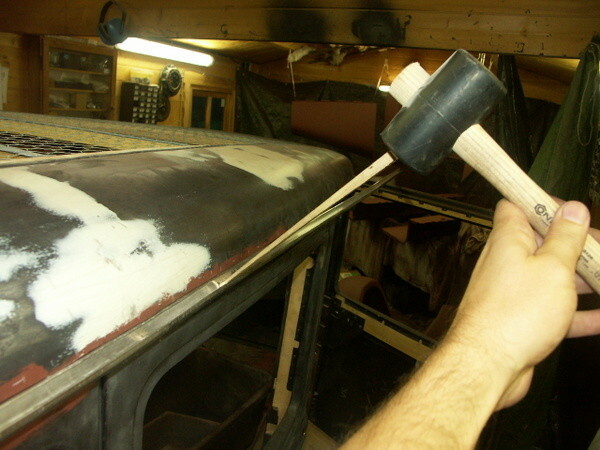 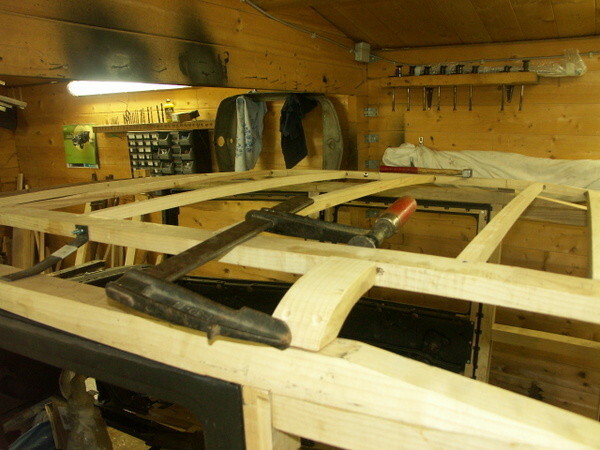 After the floor wood, most of body wood (excluding top wood) was copied from the original parts and the door wood was placed in the doors we started assembling the body. 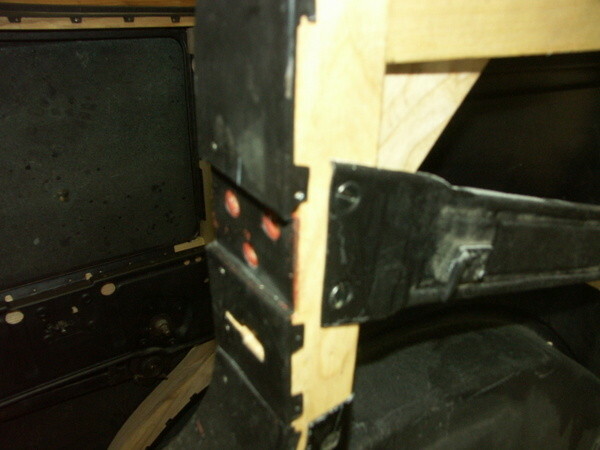 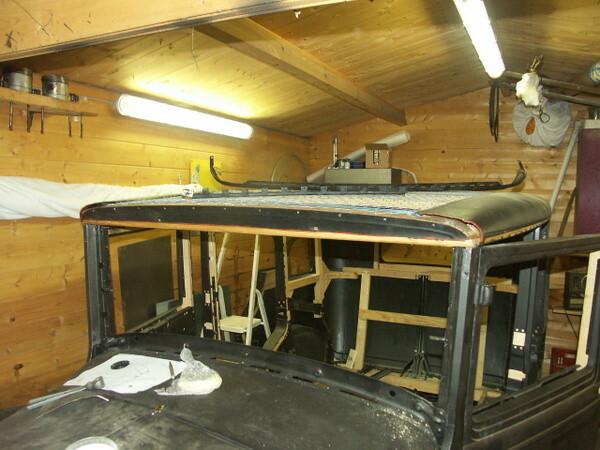 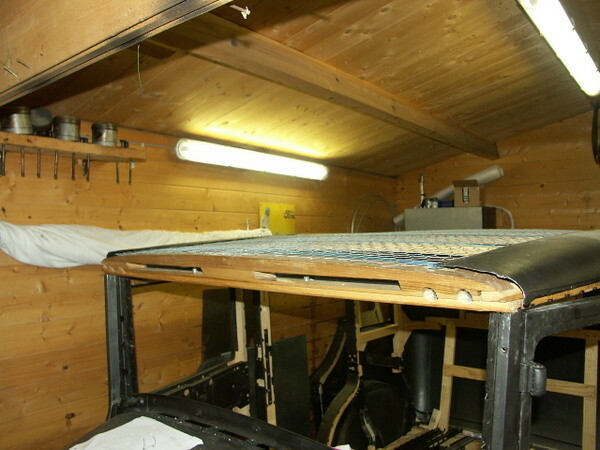 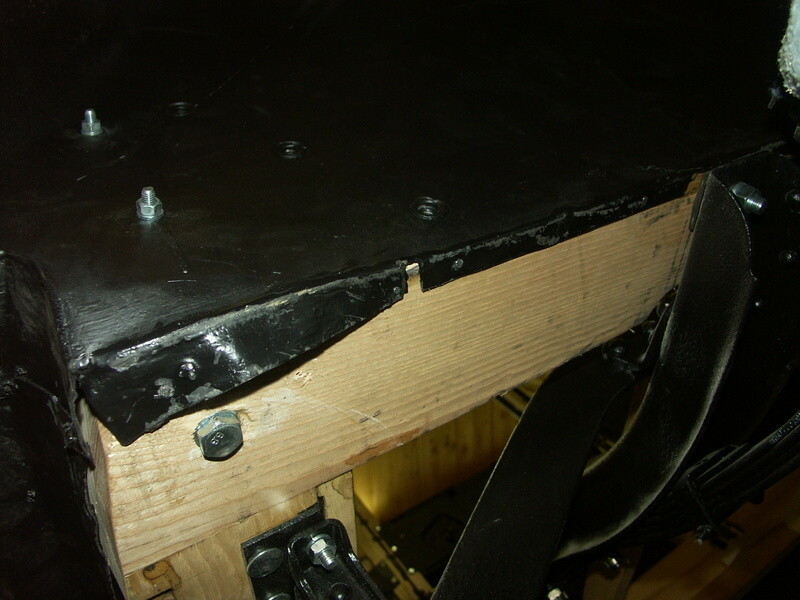 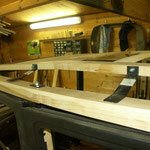 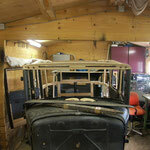 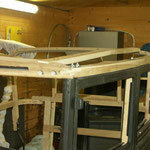 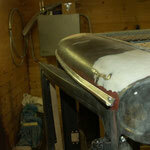 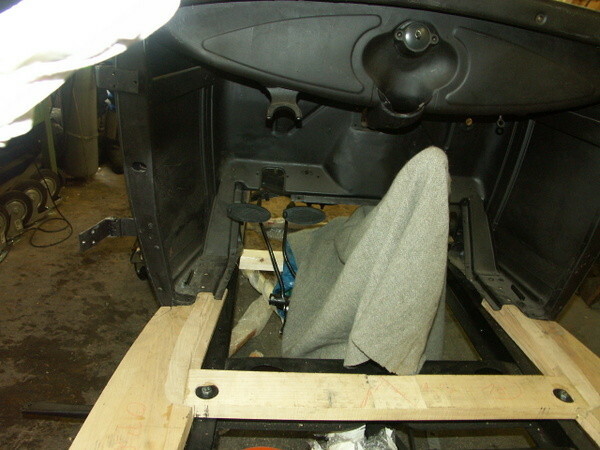 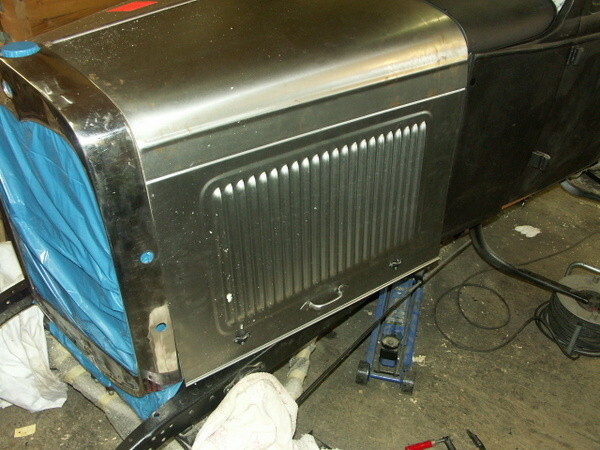 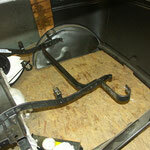 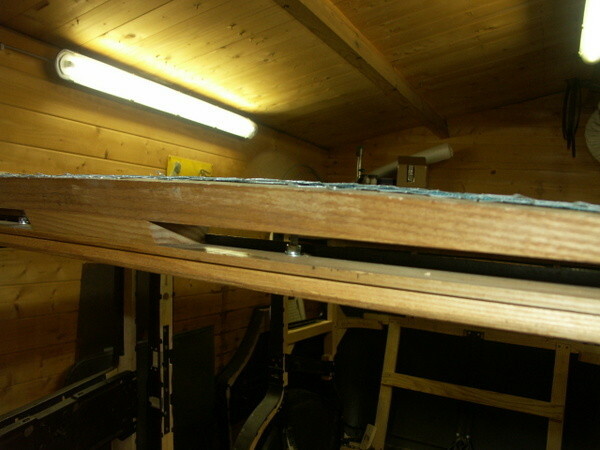 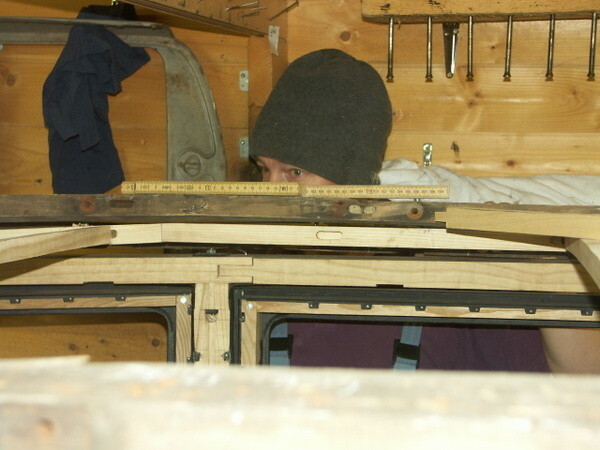 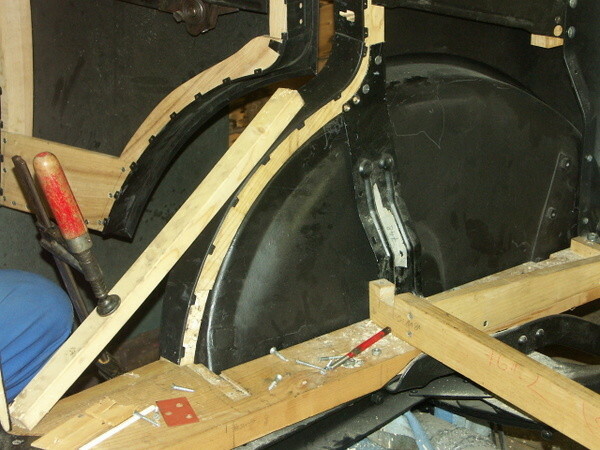 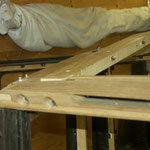 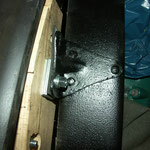 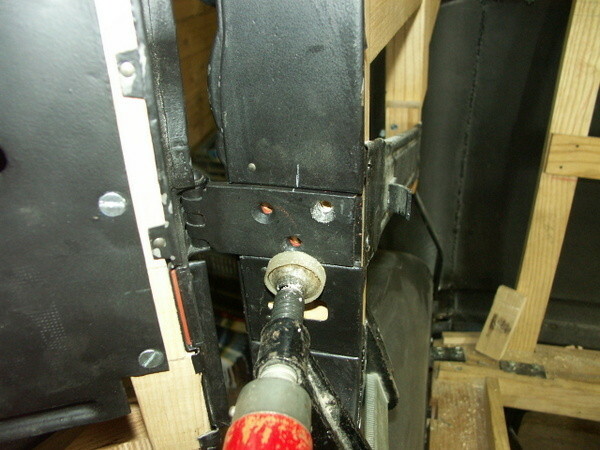 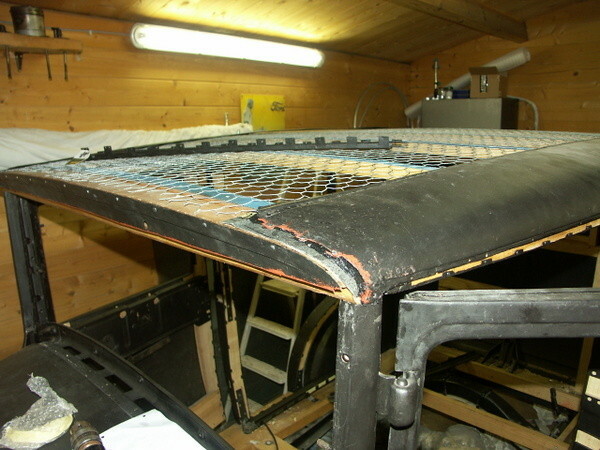 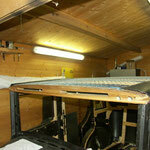 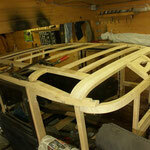 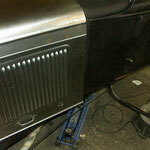 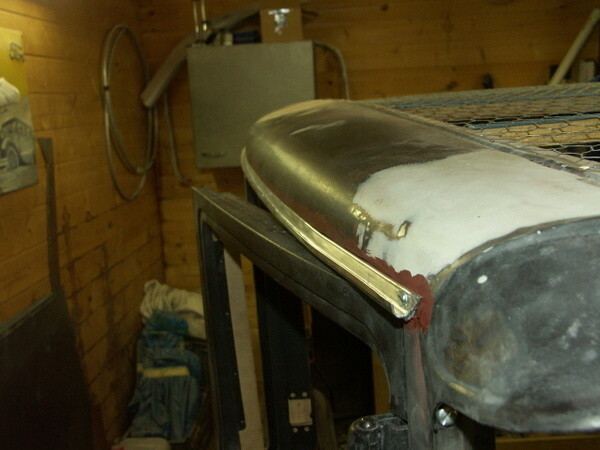 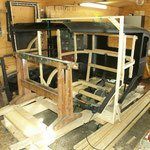 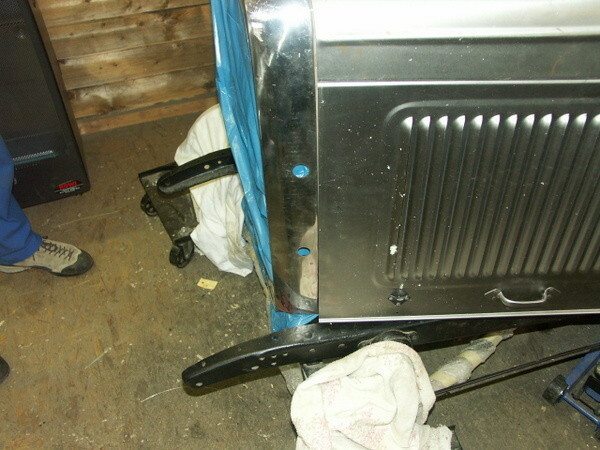 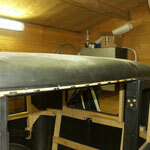 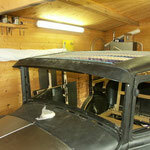 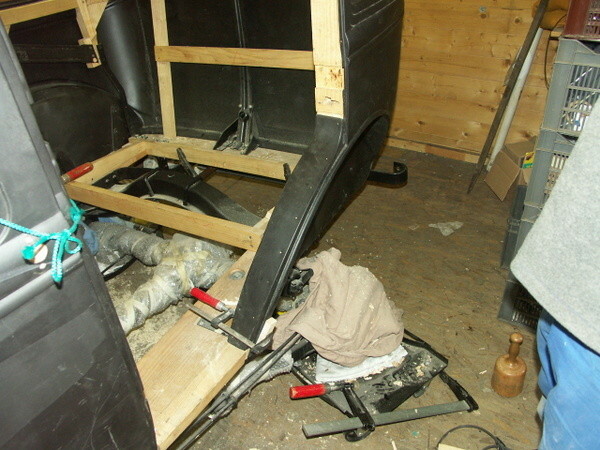 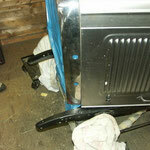 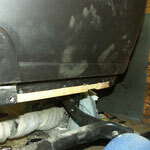 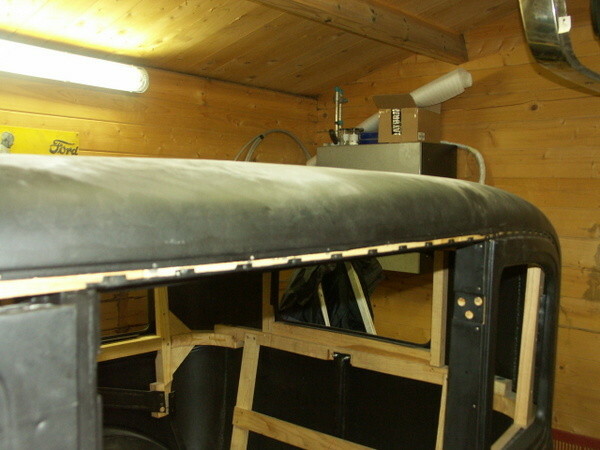 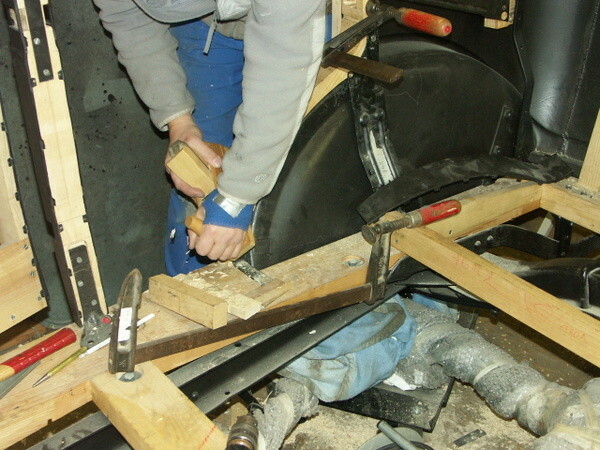 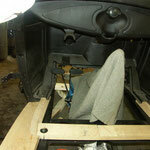 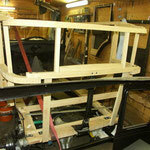 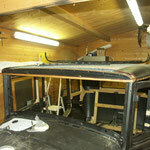 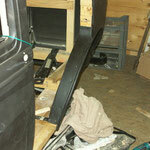 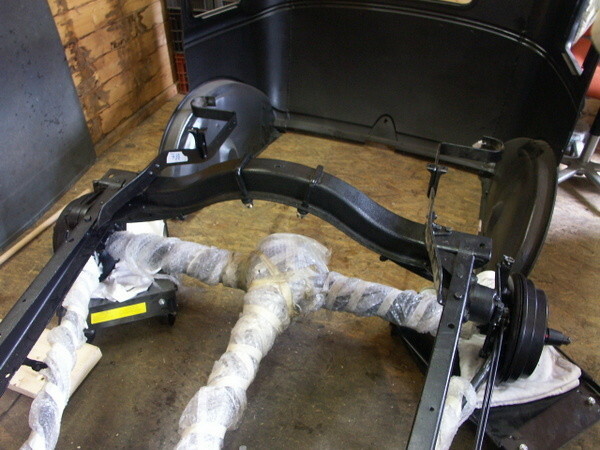 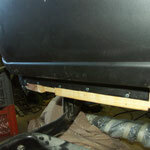 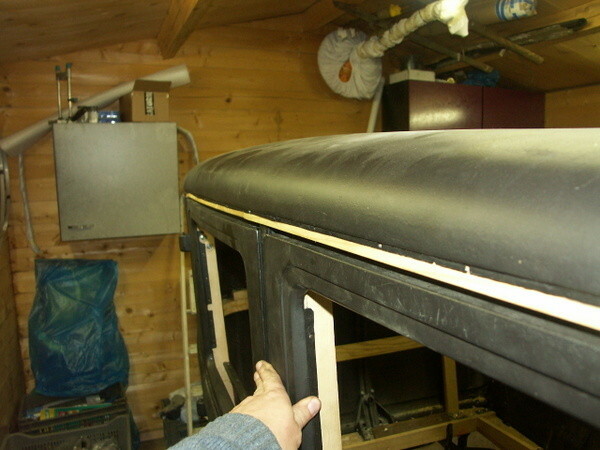 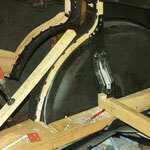 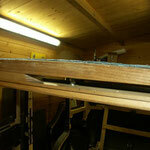 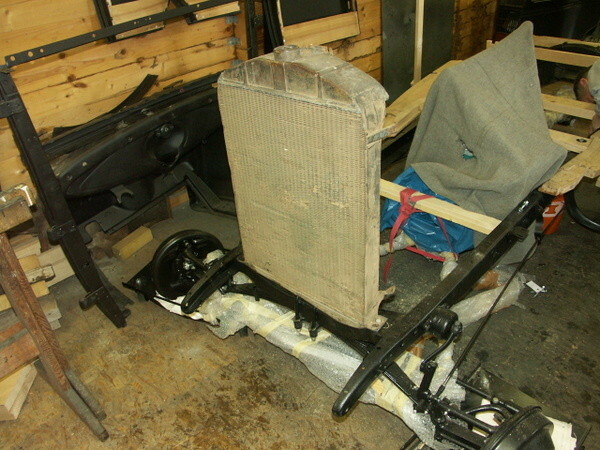 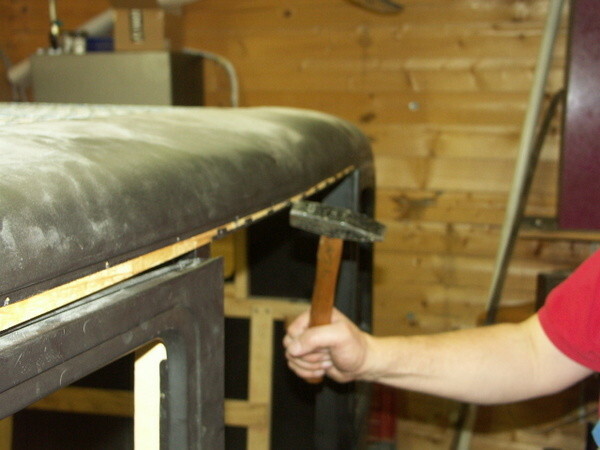 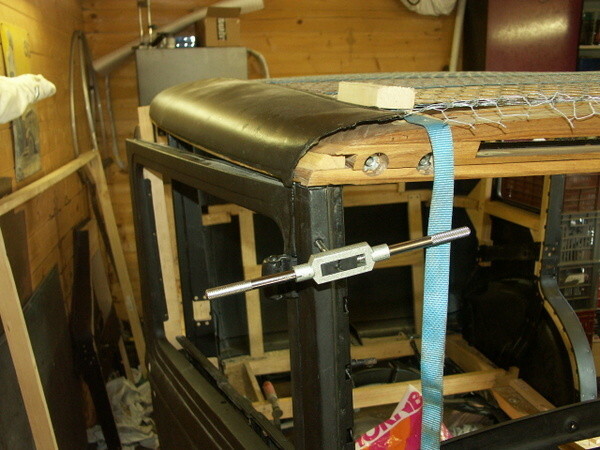 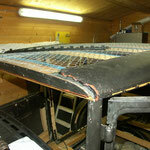 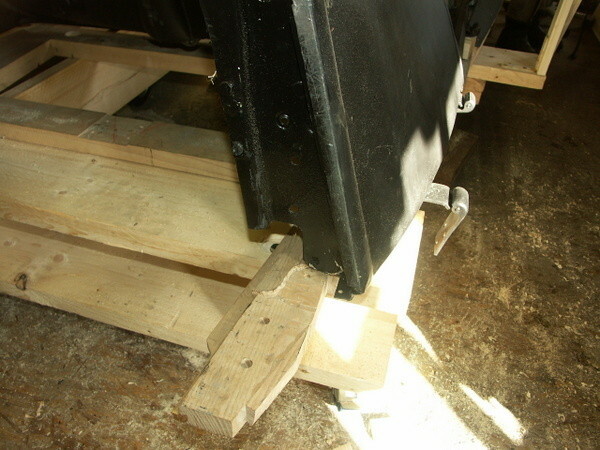 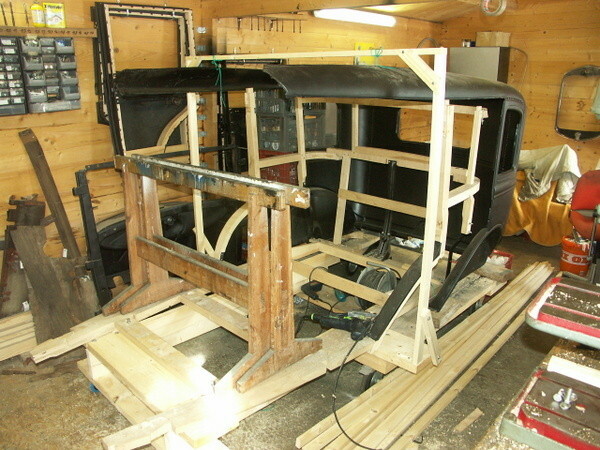 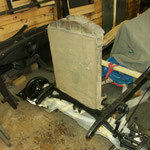 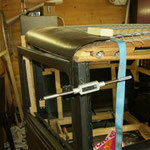 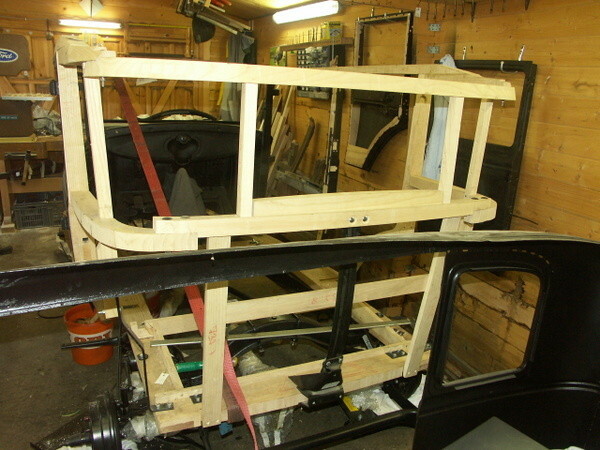 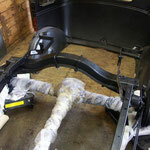 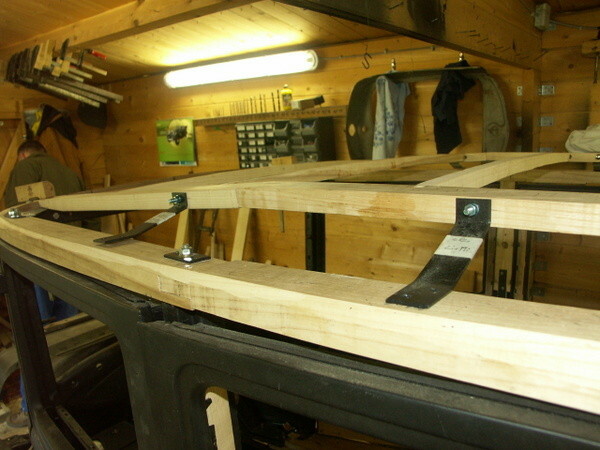 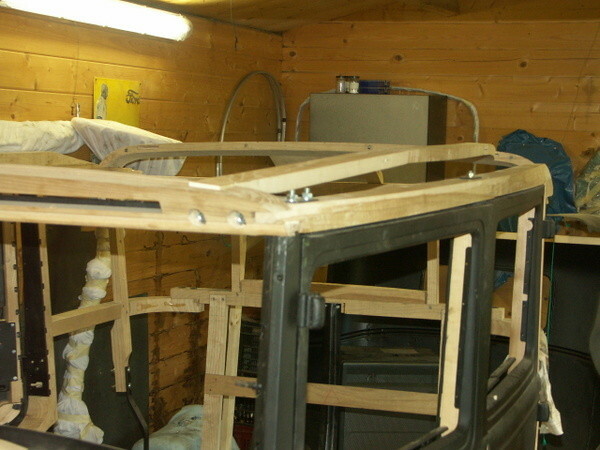 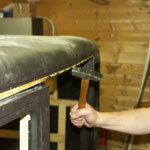 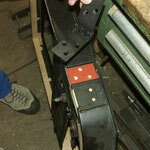 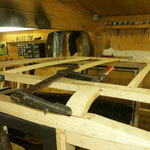 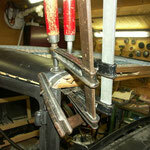 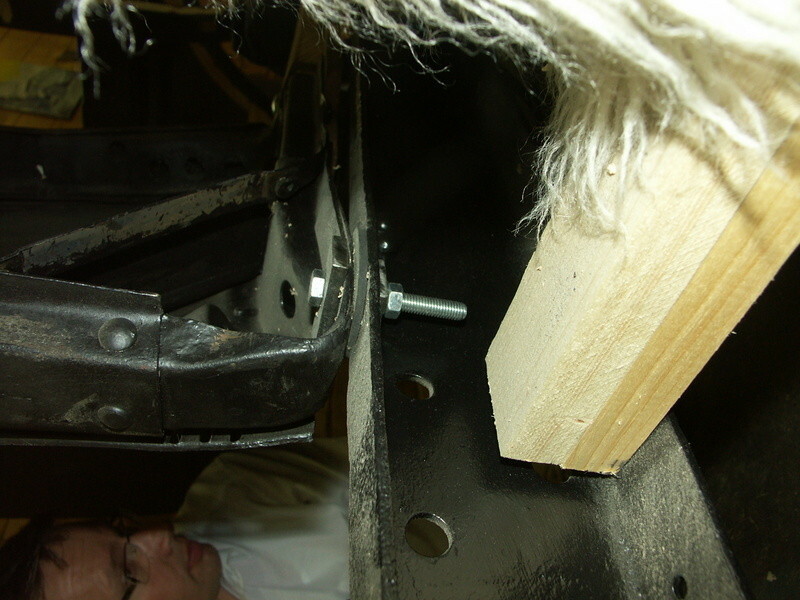 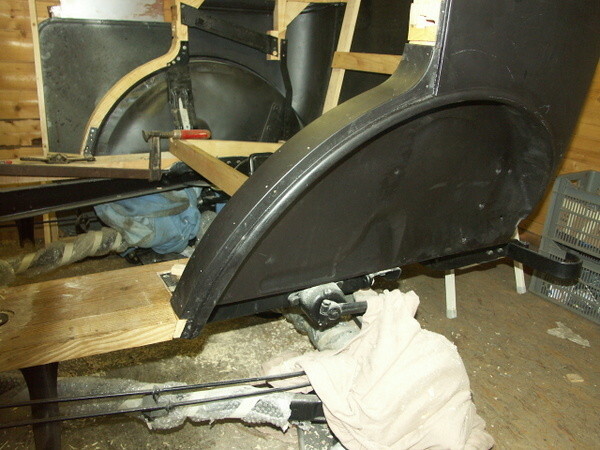 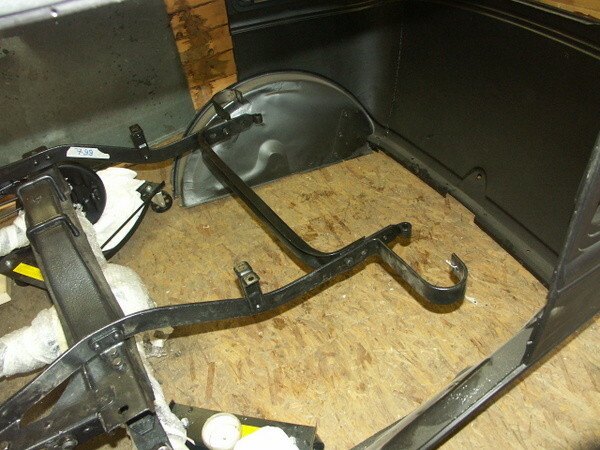 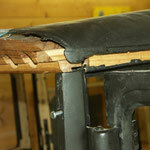 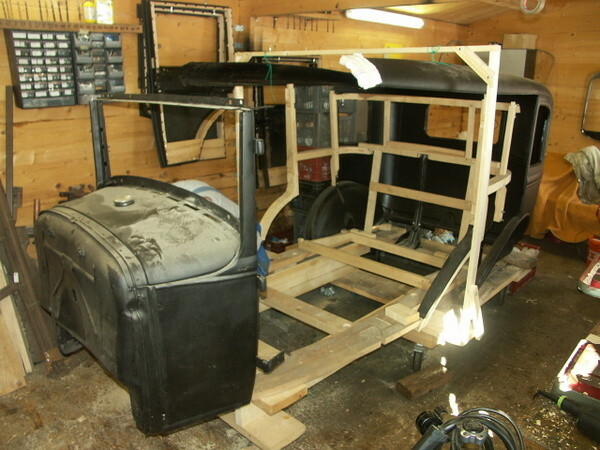 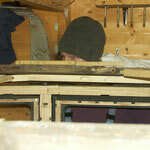 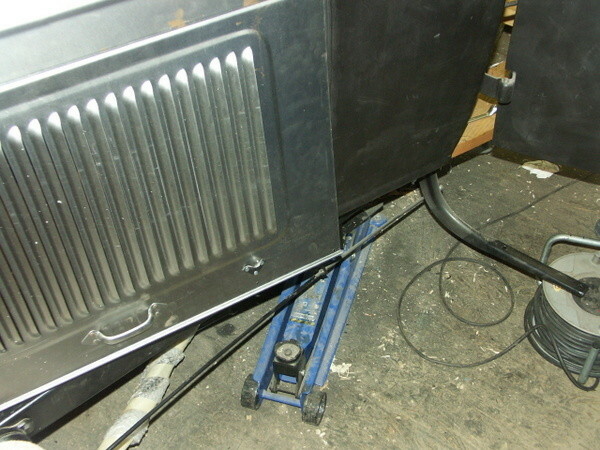 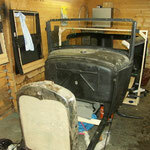 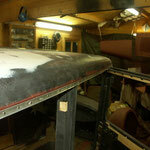 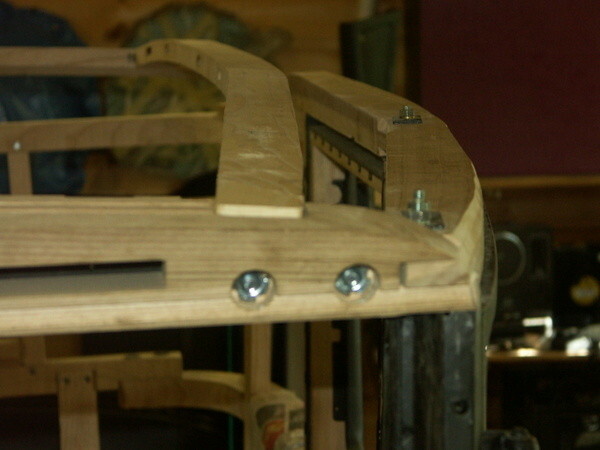 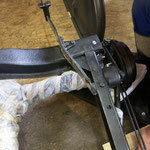 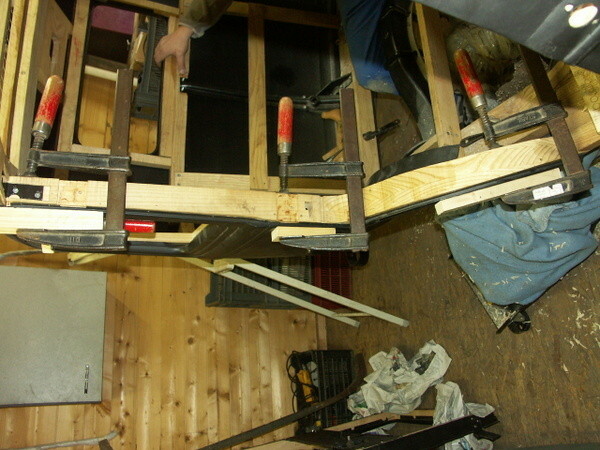 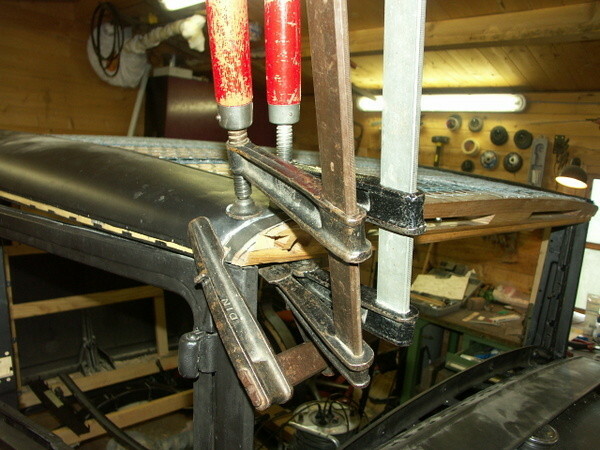 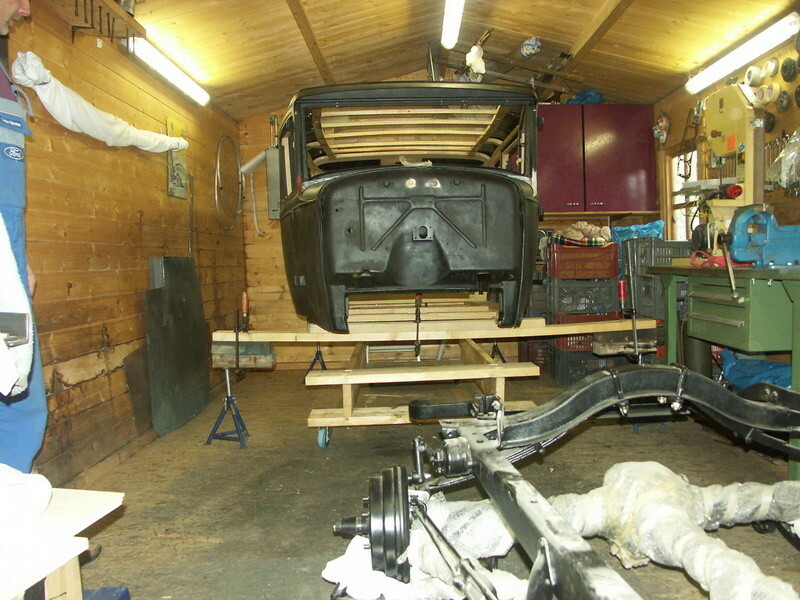 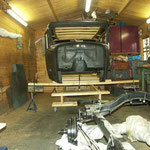 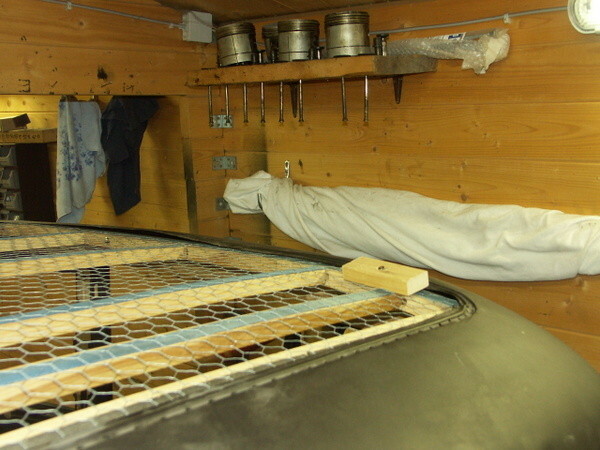 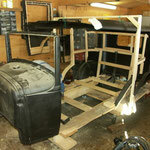 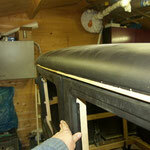 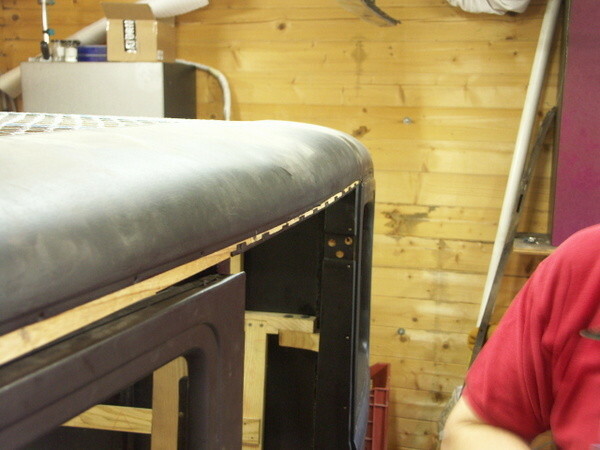 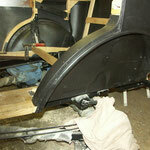 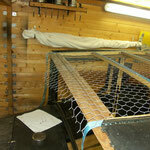 Very soon we had to realise, that the body has to be placed on the chassis for a propper door fit. 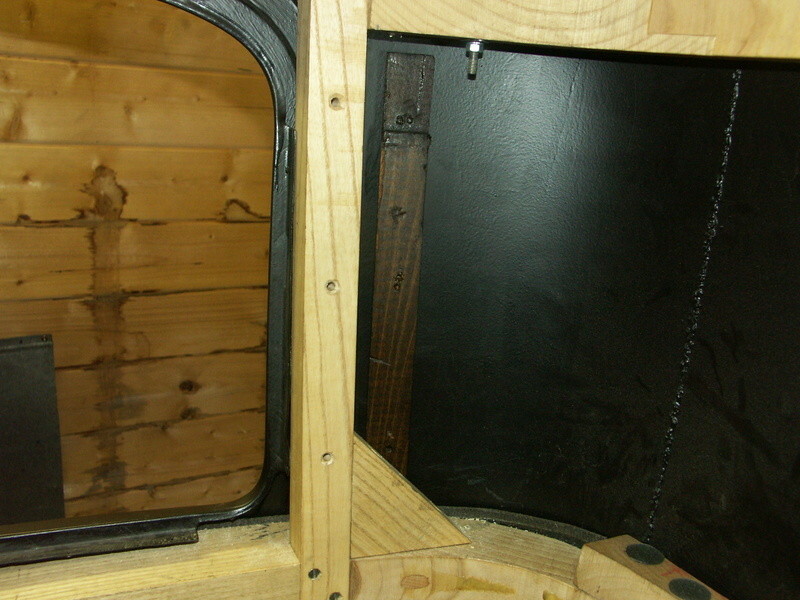 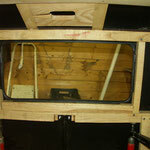 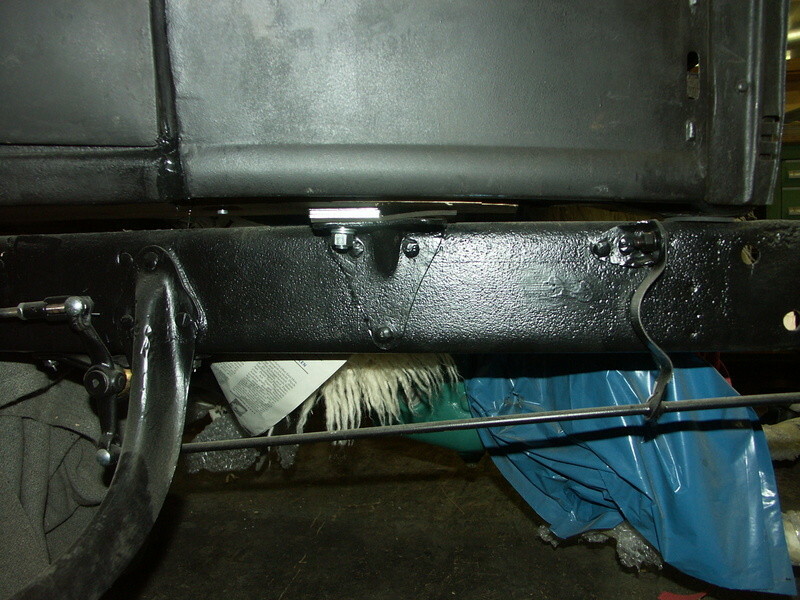 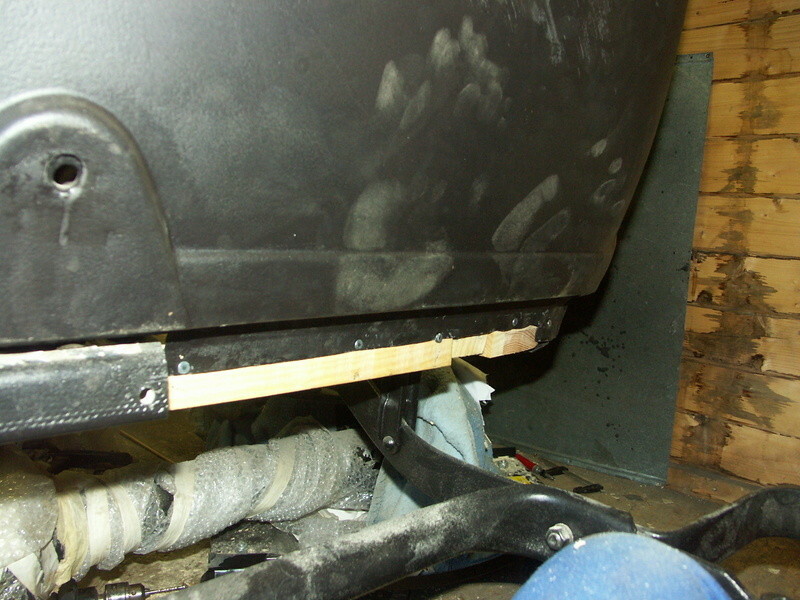 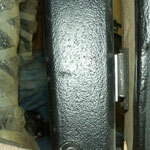 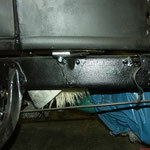 After we did that the door fit was nice, but we had to lift up the front of the cowl with a tension belt. 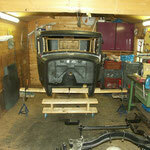 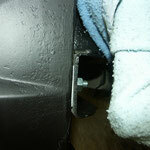 And now we had to realise that without the hood and radiator no proper alignement can be achieved. 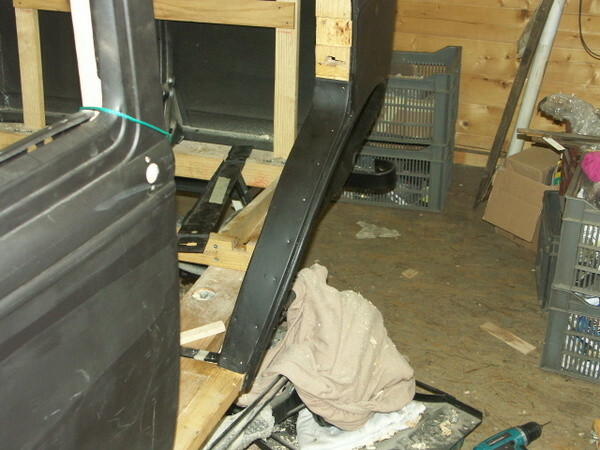 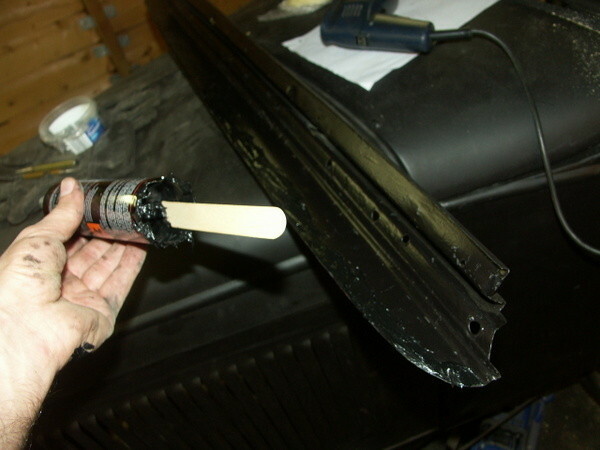 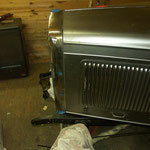 To avoid some bad surpises later we assemblied for that reason the radiator, shell and hood. 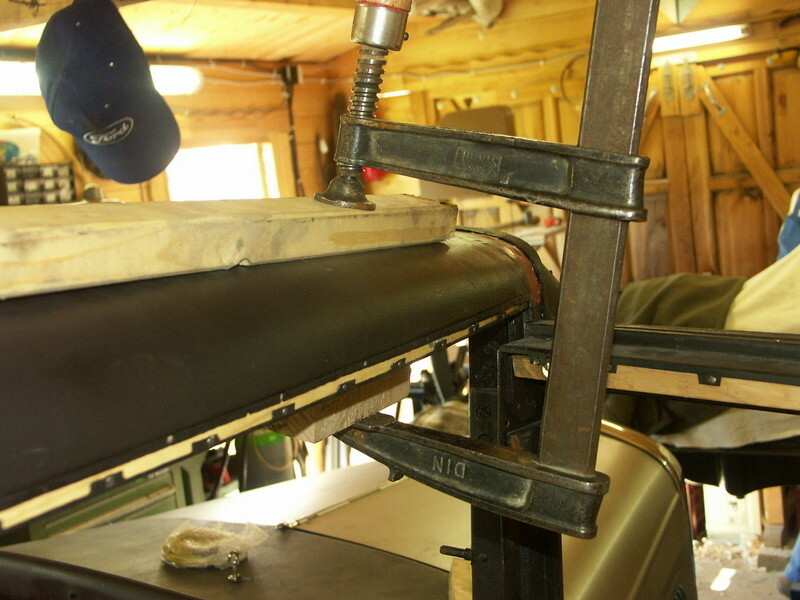 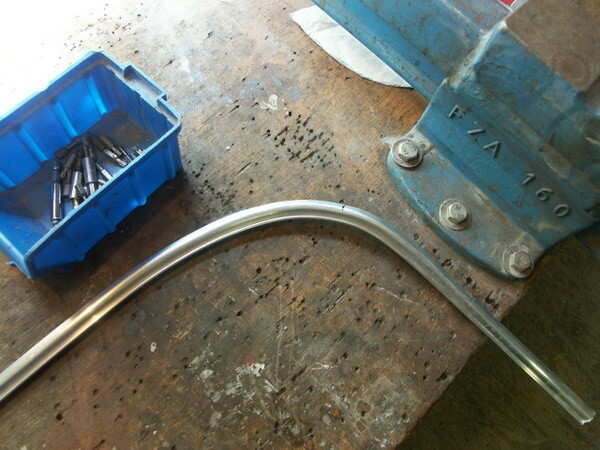 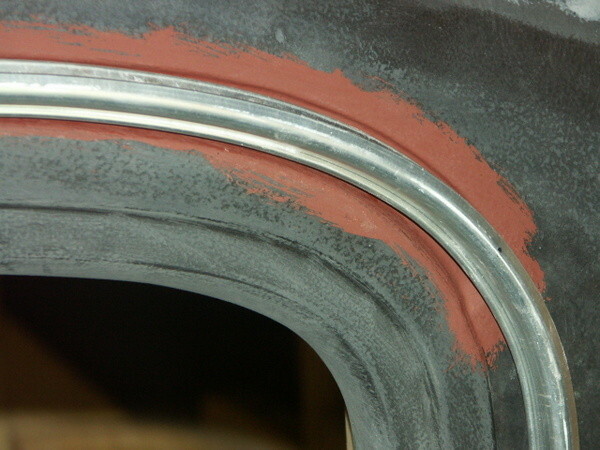 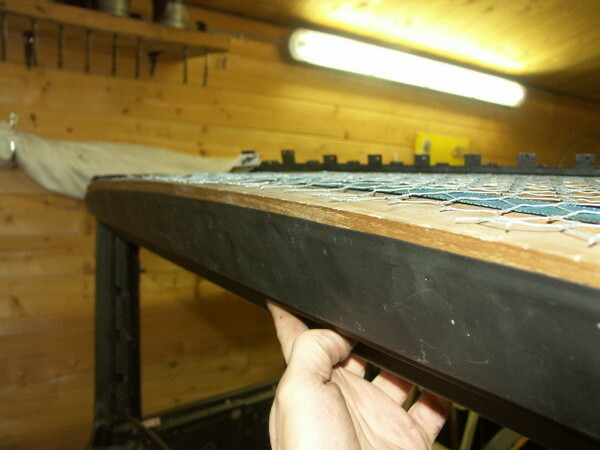 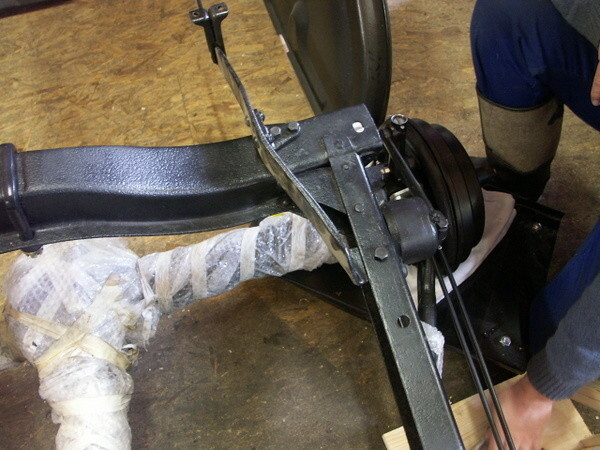 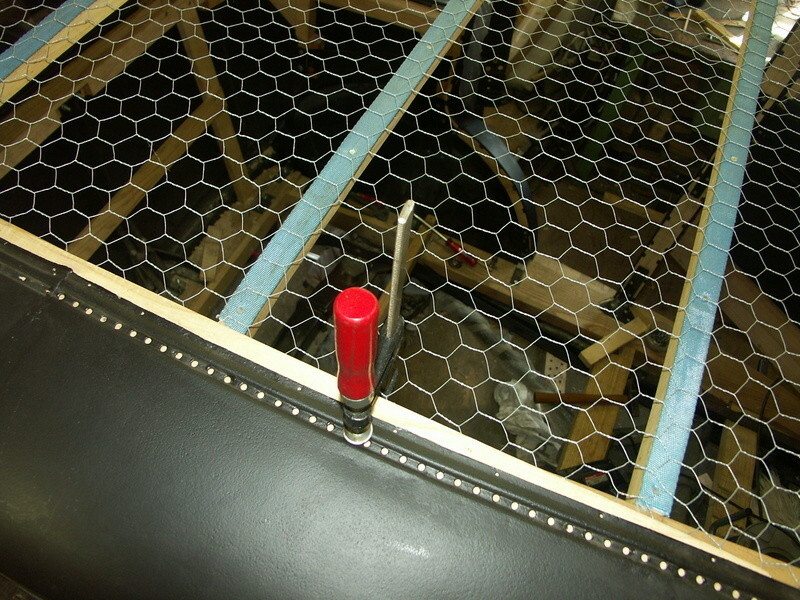 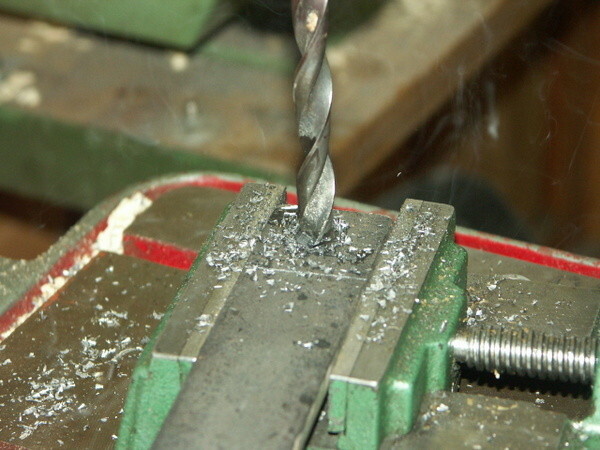 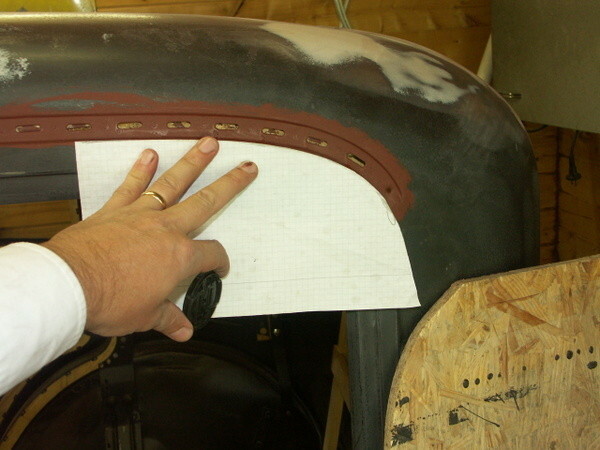 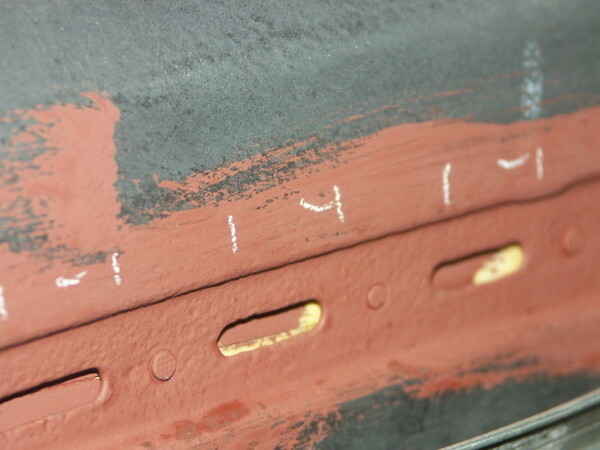 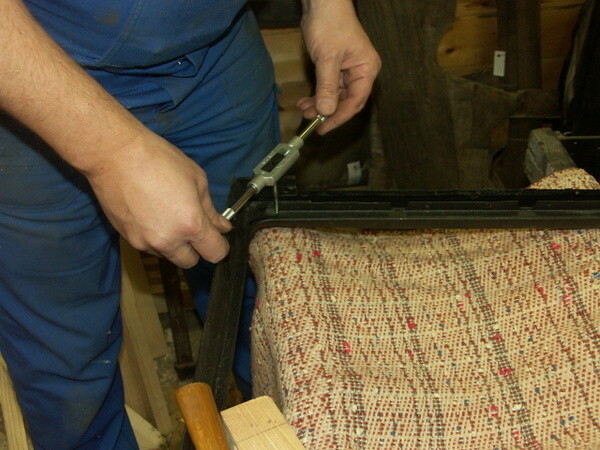 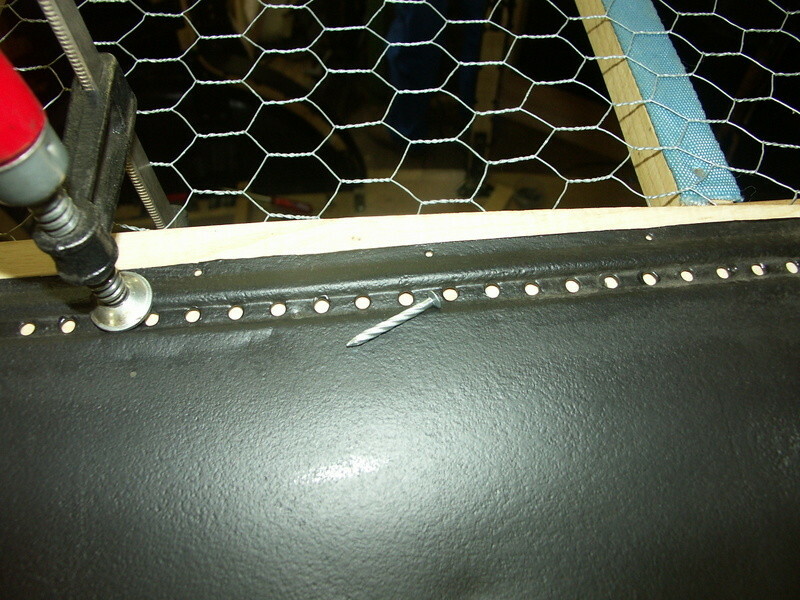 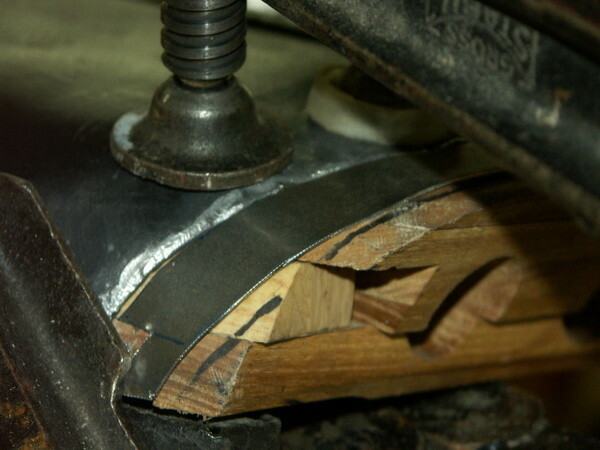 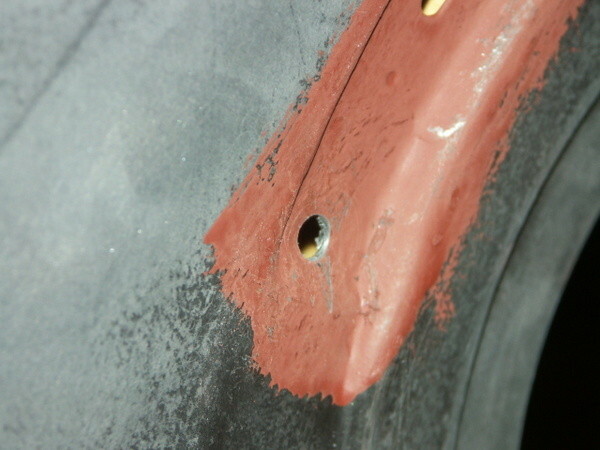 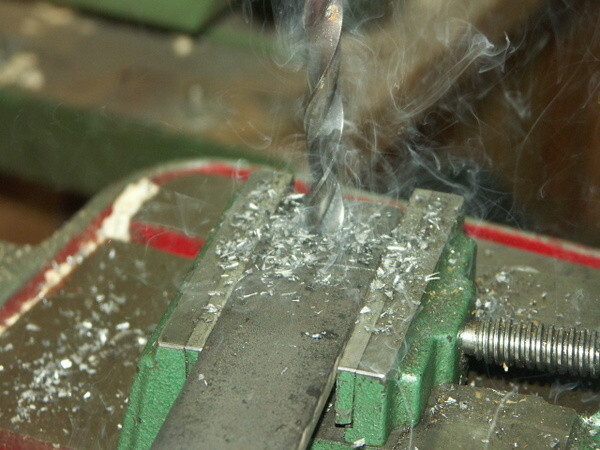 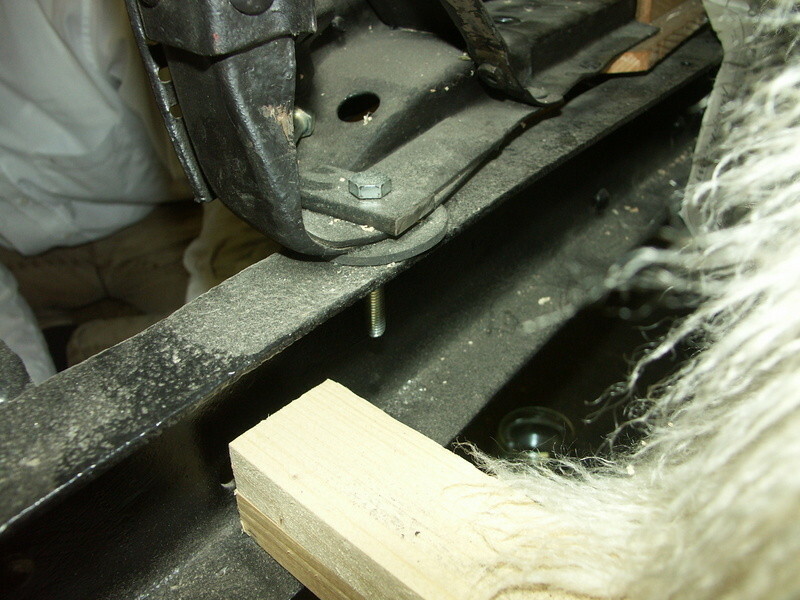 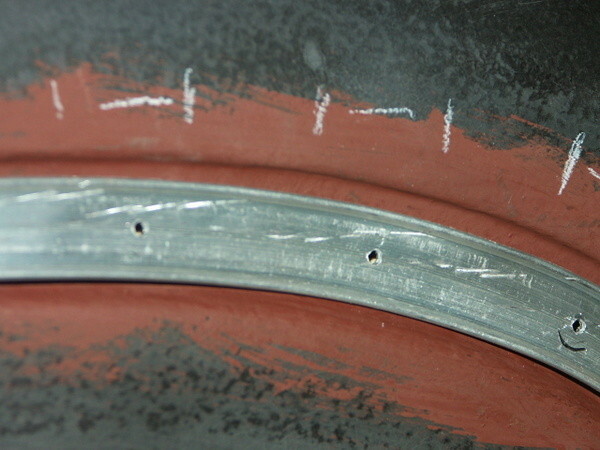 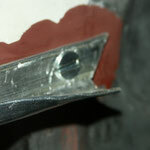 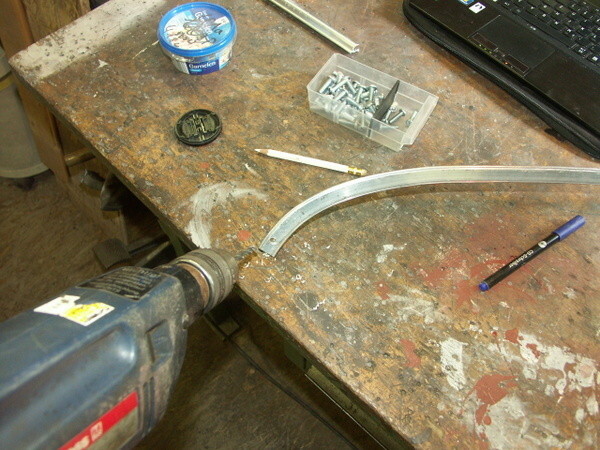 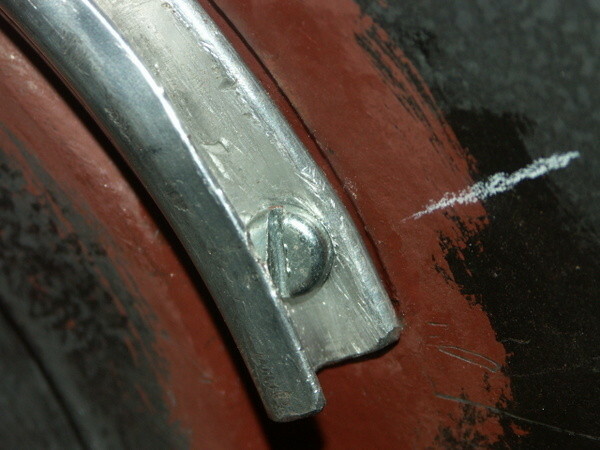 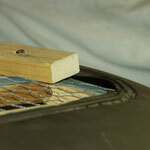 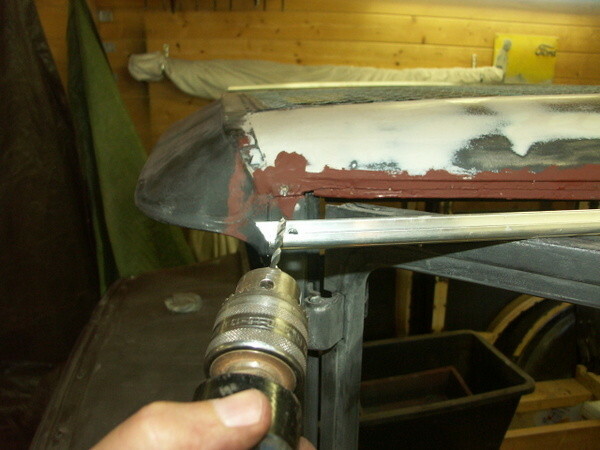 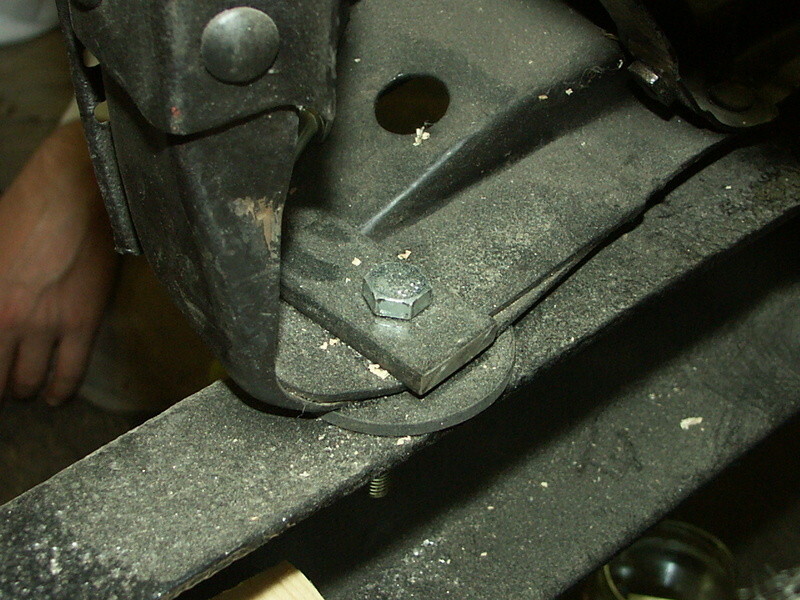 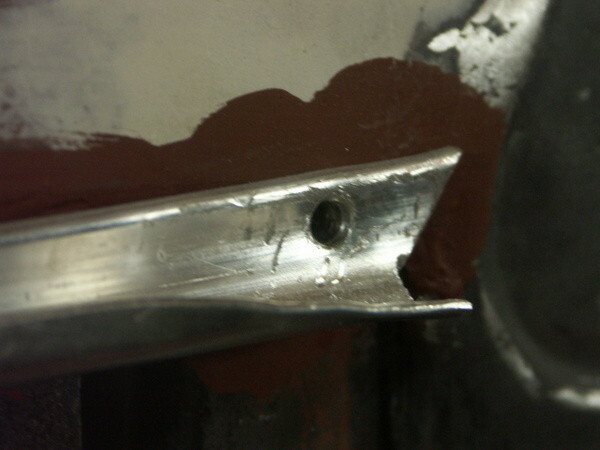 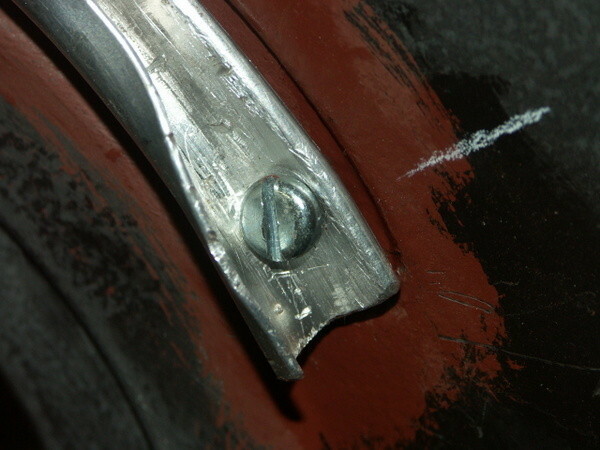 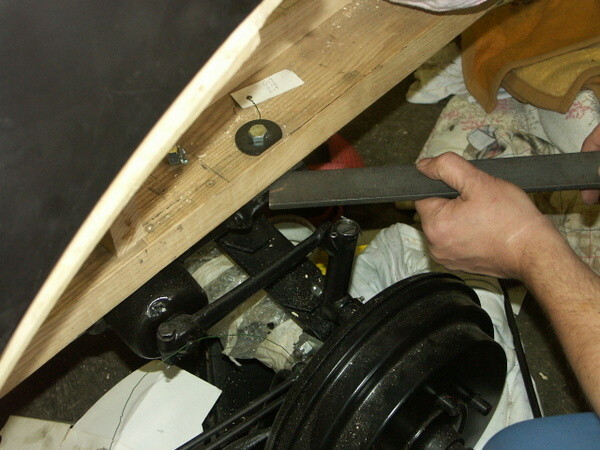 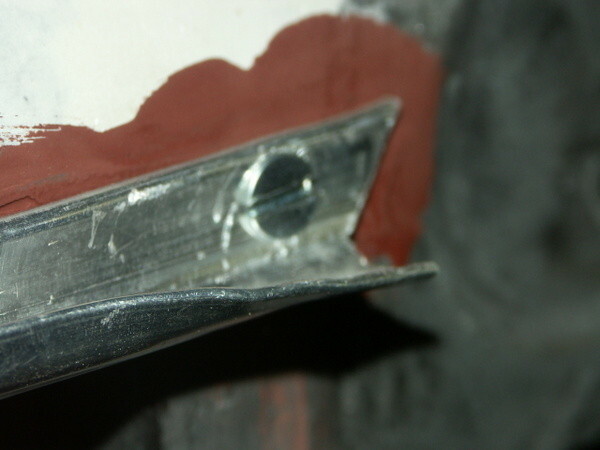 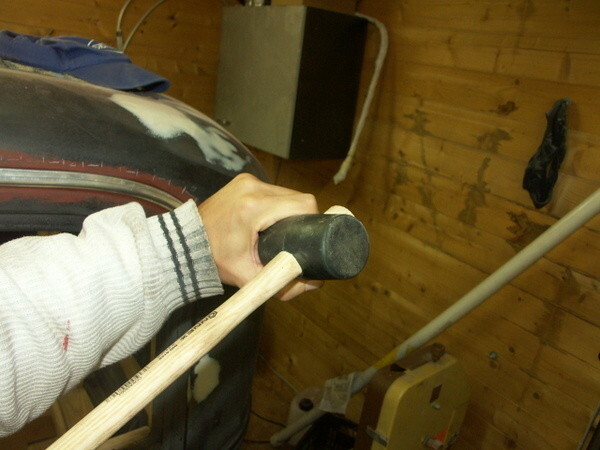 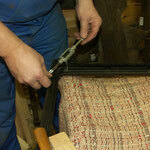 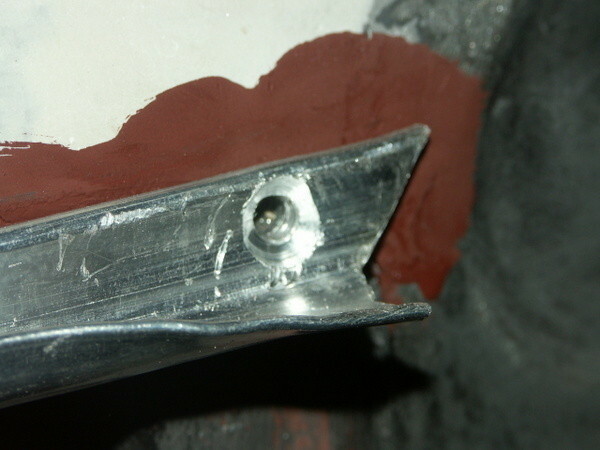 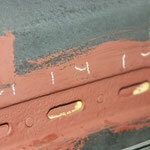 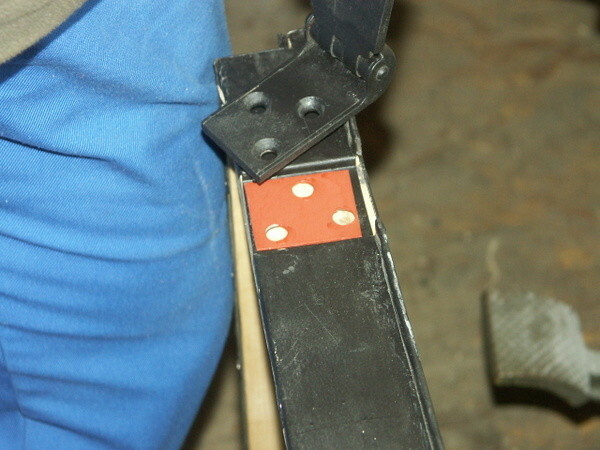 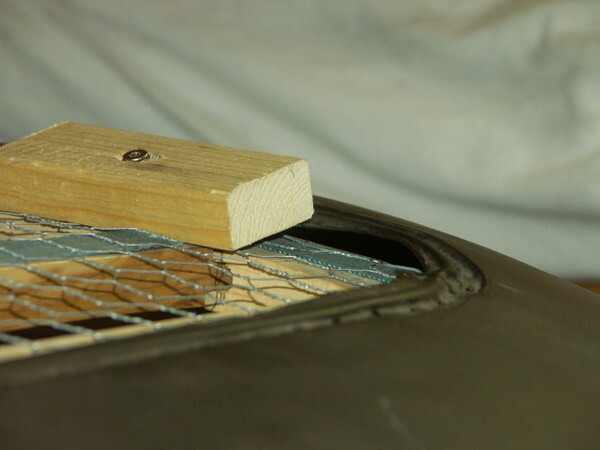 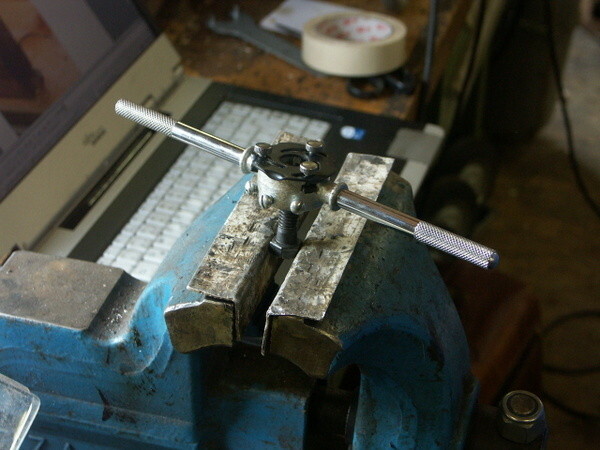 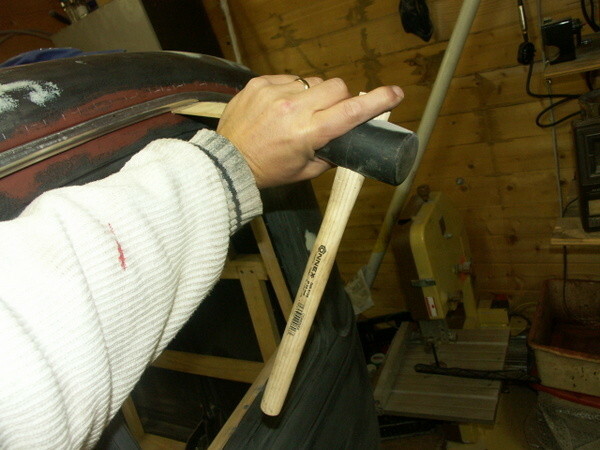 It is necessary to shim the cowl, respective lift it 2-3 cm in the front. 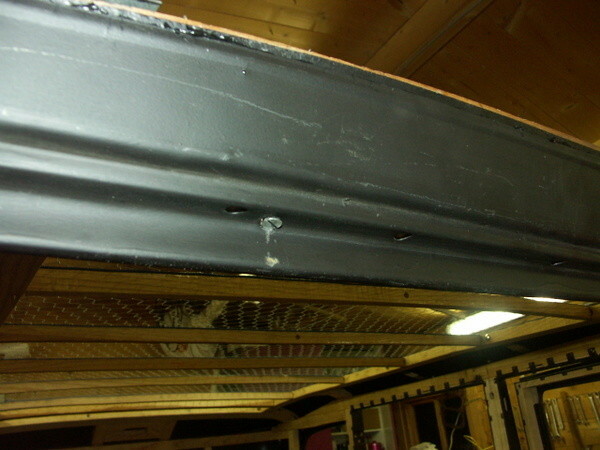 Repro rain gutters installed. 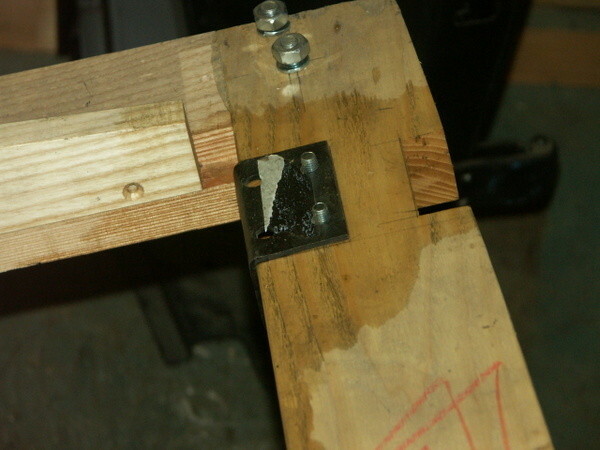 It was easier than expected. 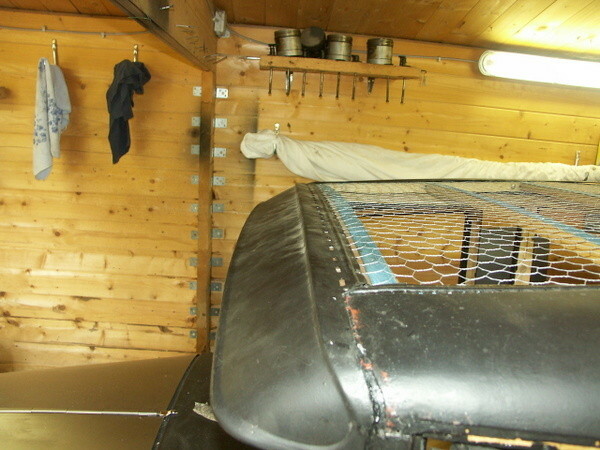 See pictures at bottom for details. 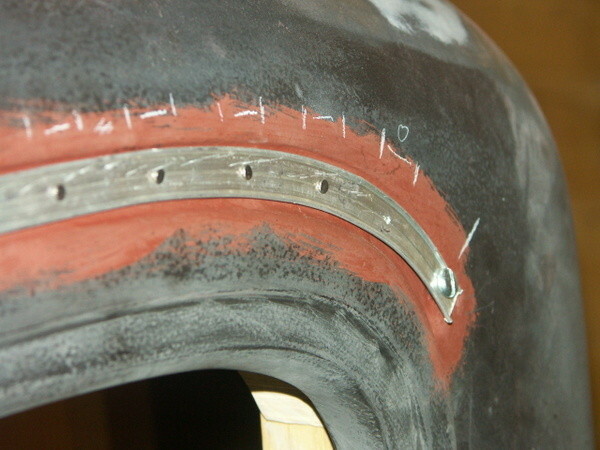 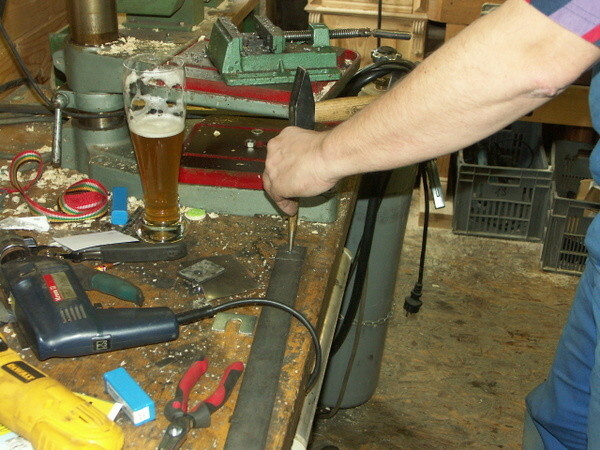 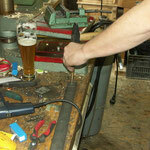 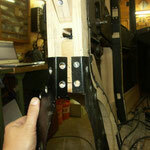 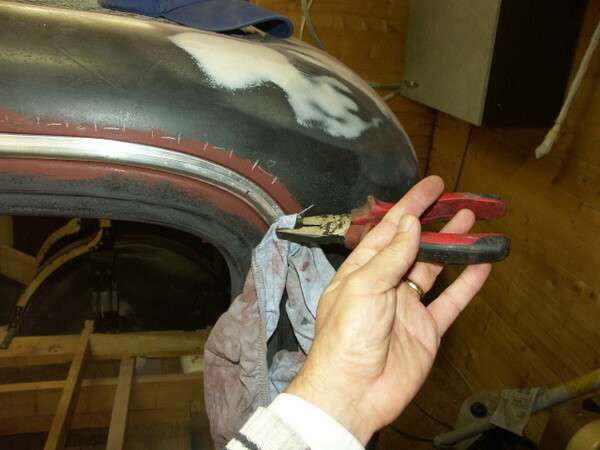 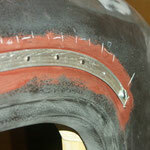 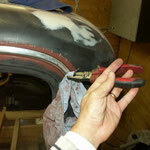 More pictures of the fitting process. 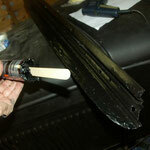 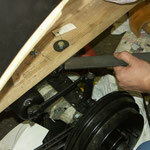 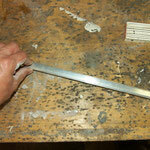 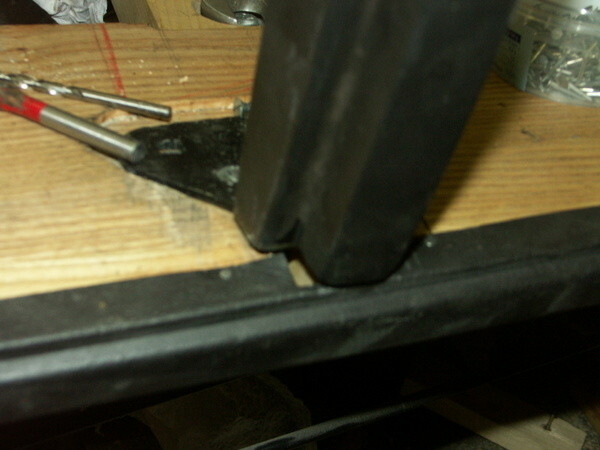 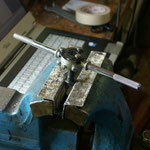 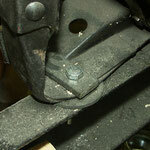 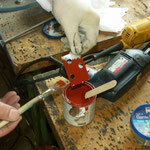 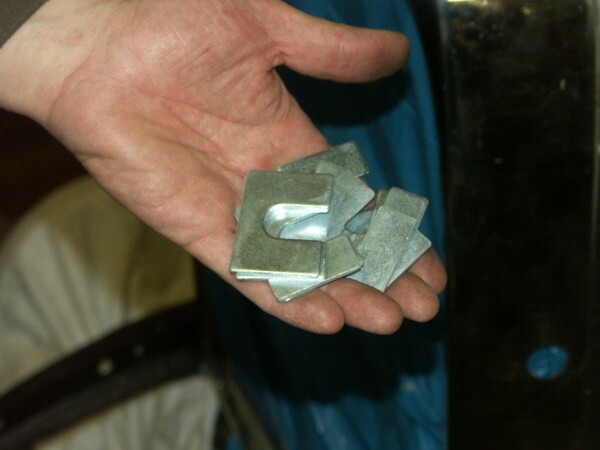 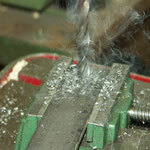 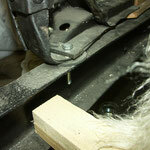 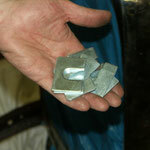 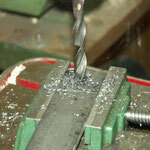 We had to make very thick shims at the rear body mounts. 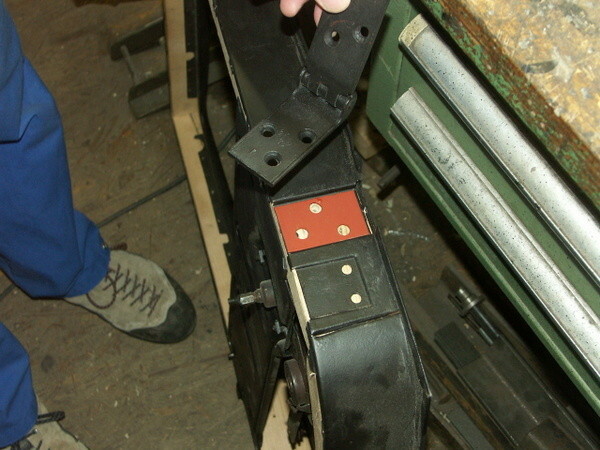 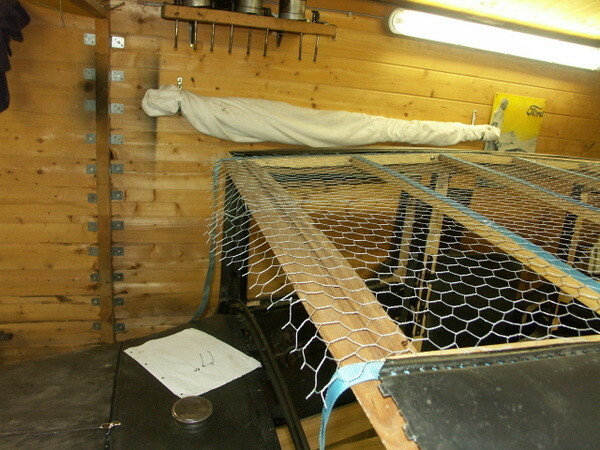 Assembly of the big rearward sheet metal penal. 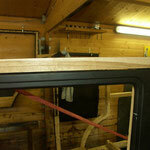 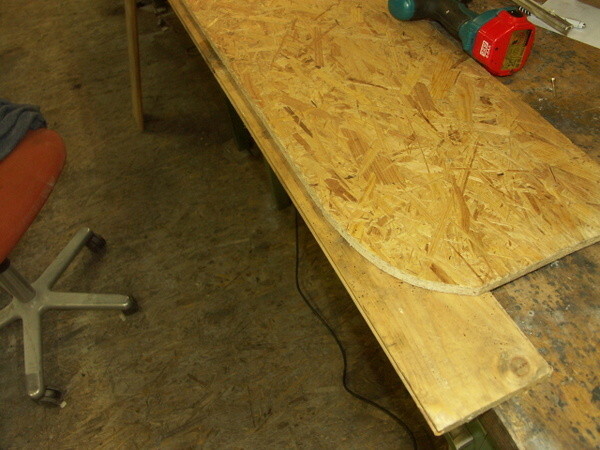 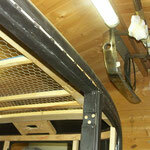 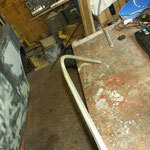 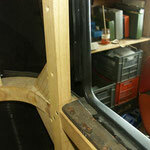 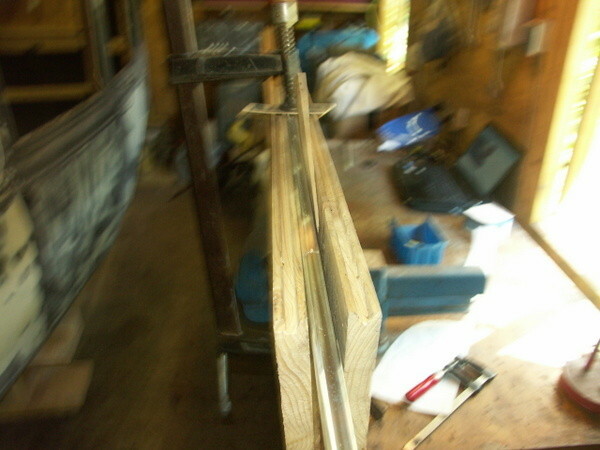 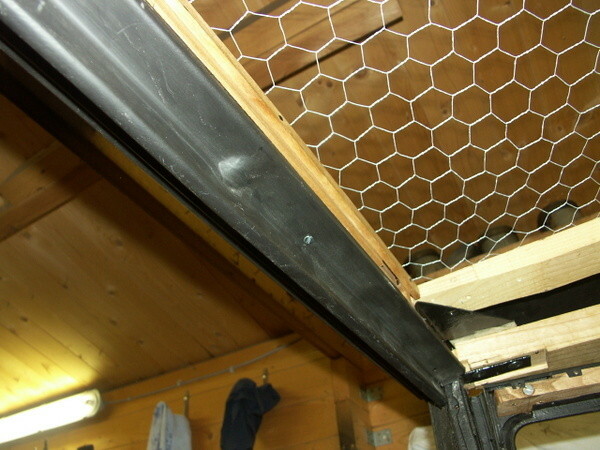 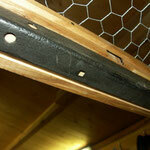 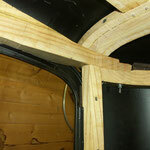 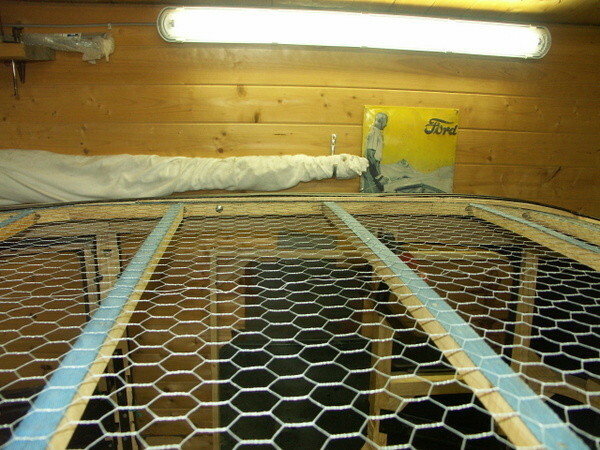 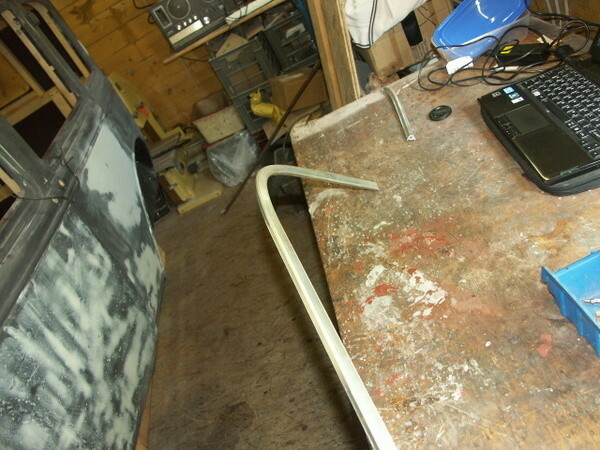 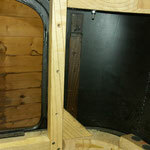 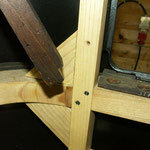 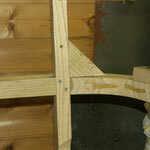 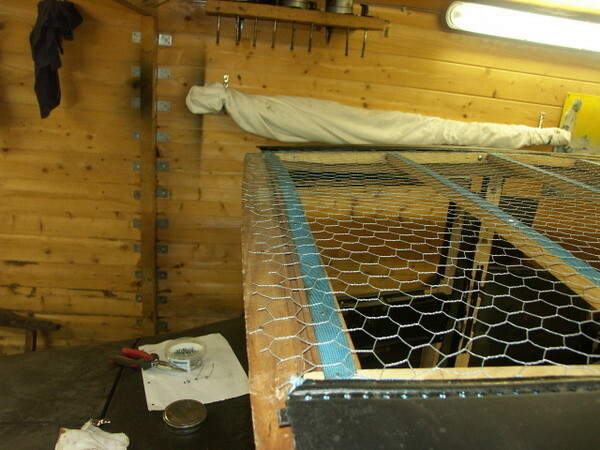 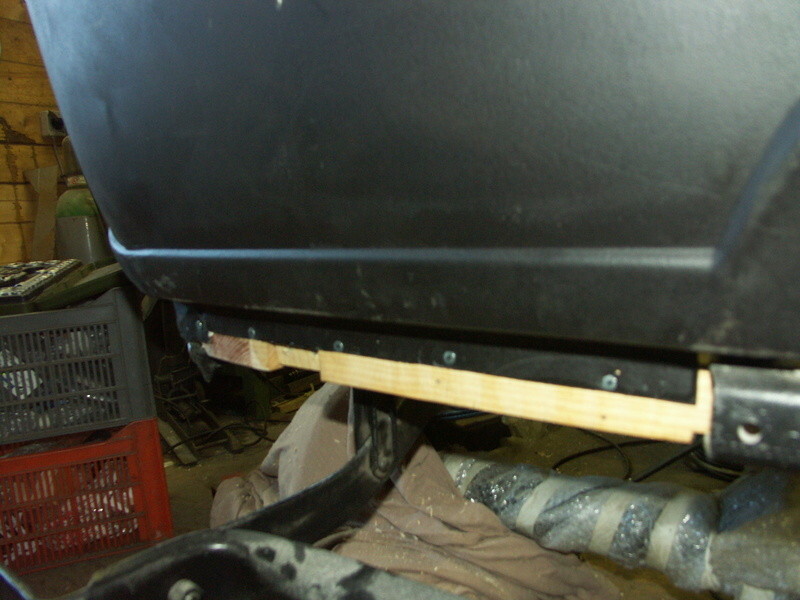 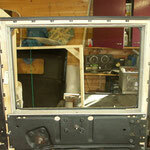 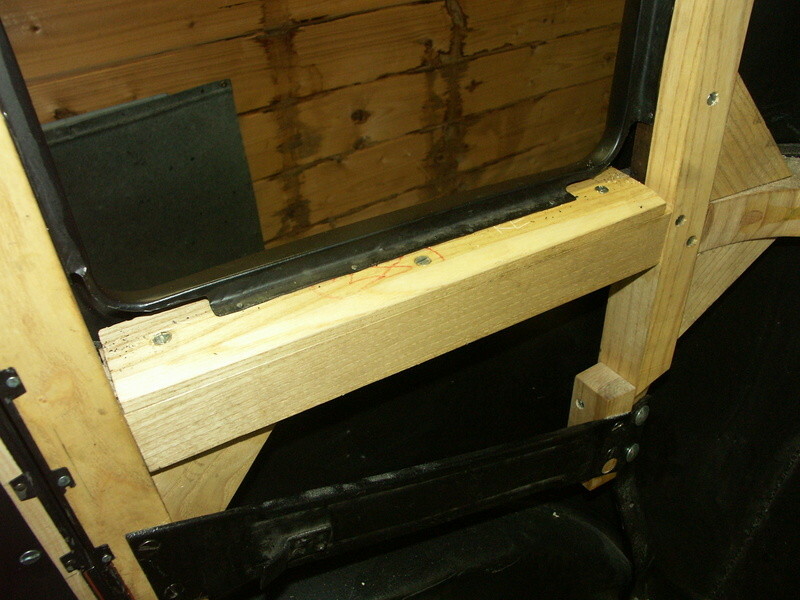 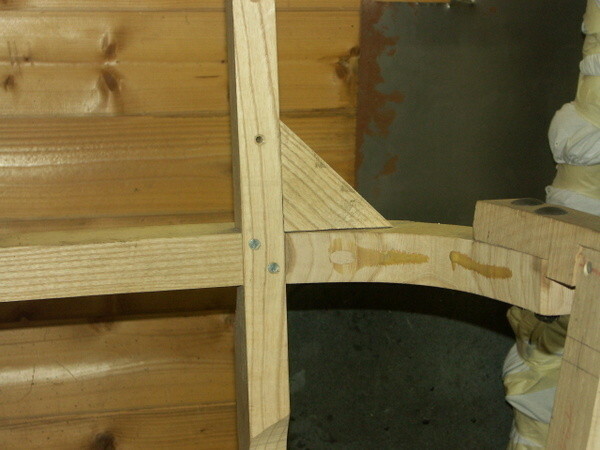 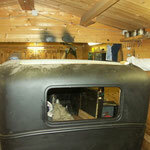 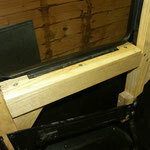 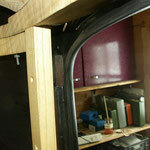 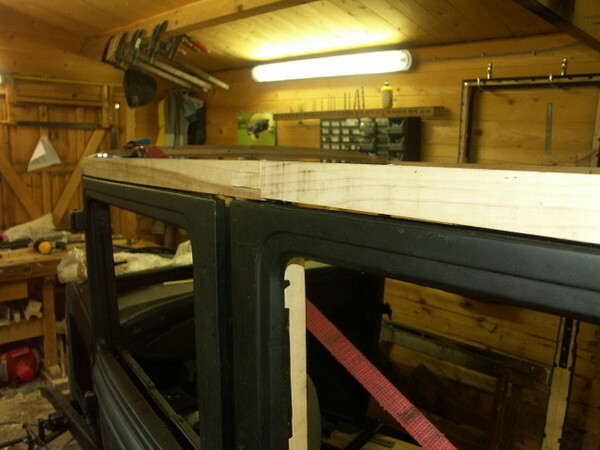 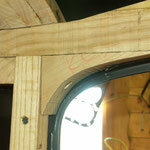 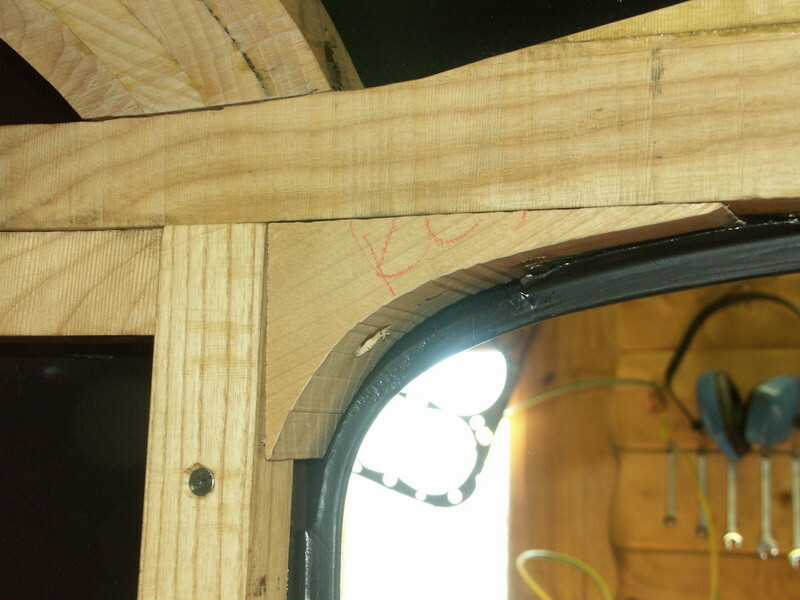 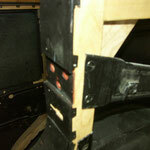 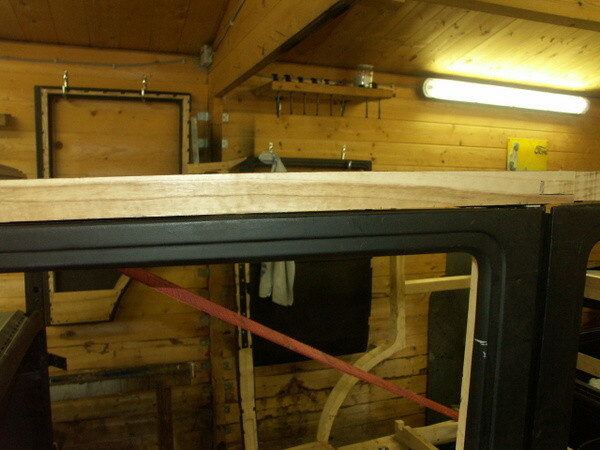 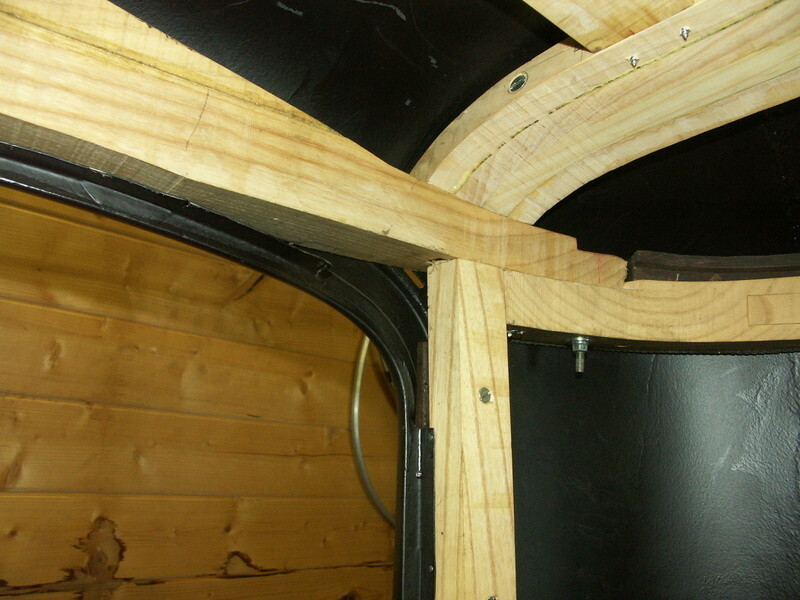 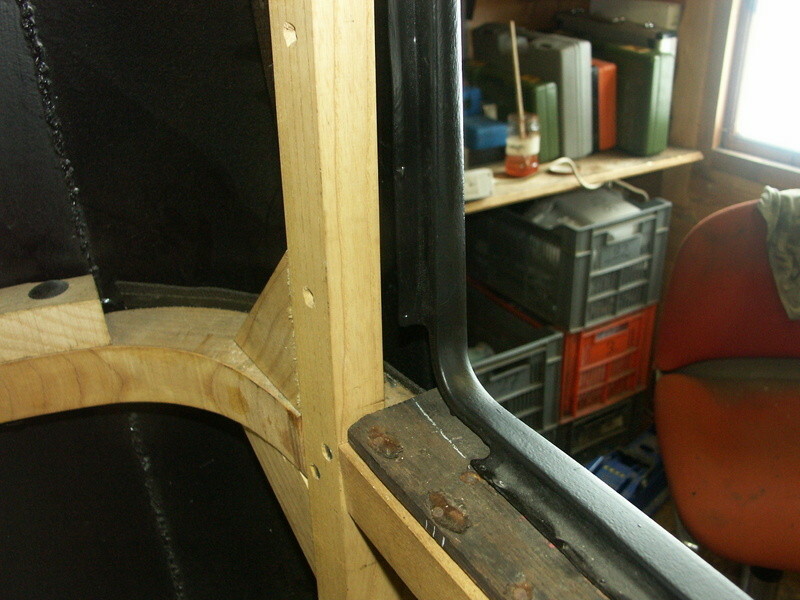 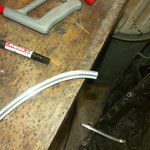 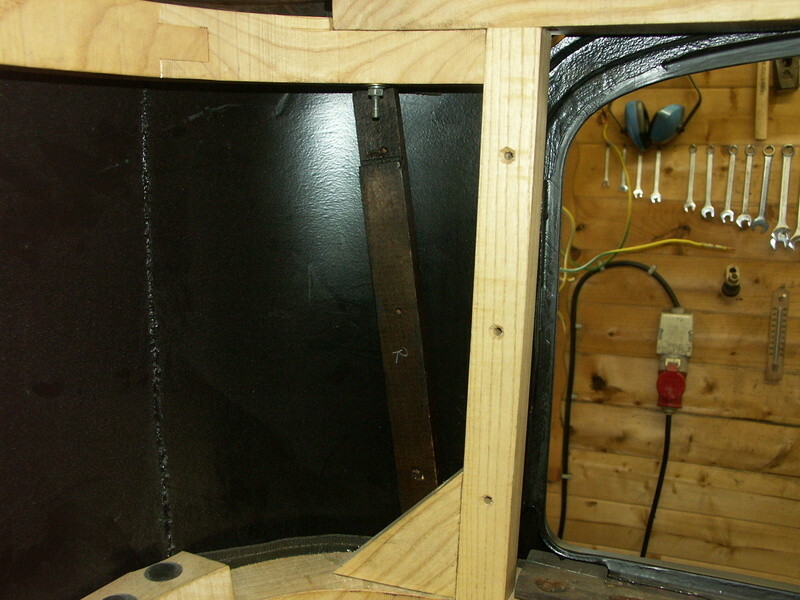 This was tricky, as the right side panel was severel cm higher than the door hight, and even is bend some cm outward. 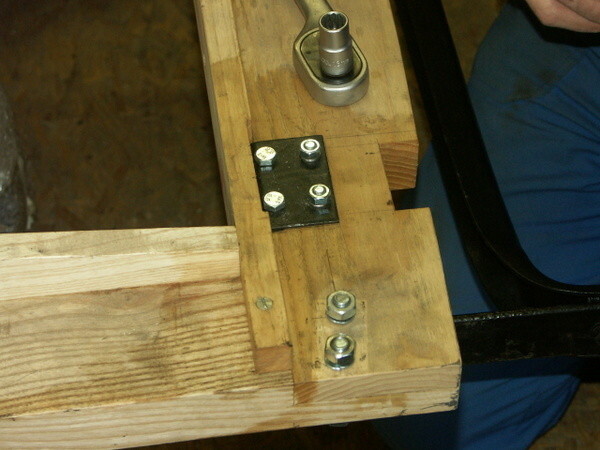 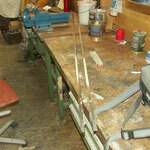 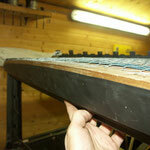 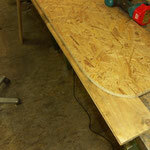 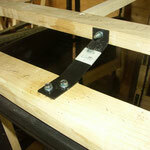 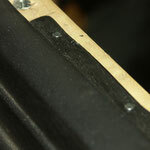 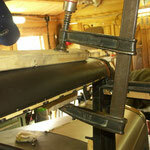 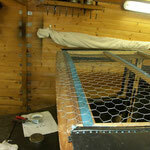 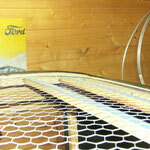 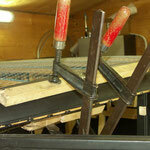 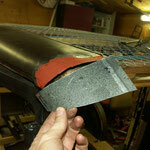 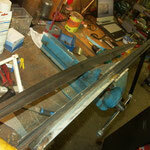 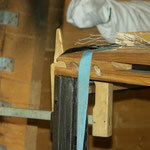 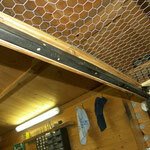 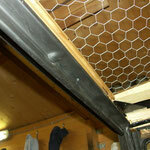 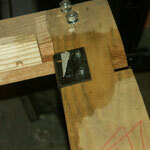 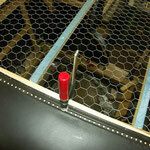 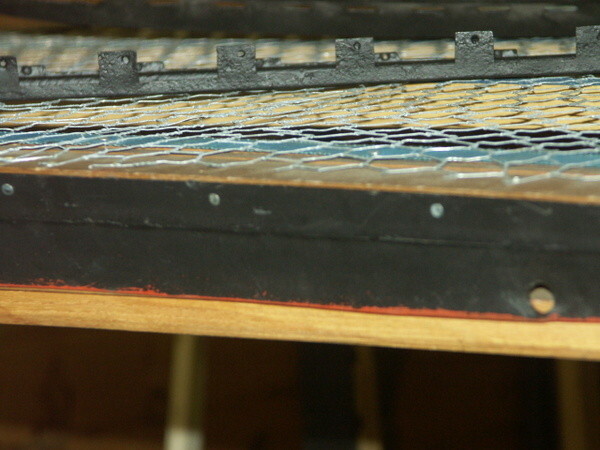 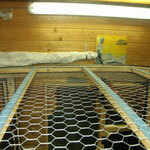 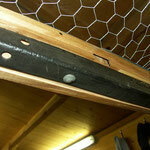 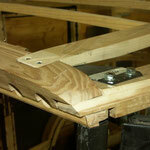 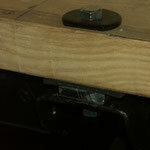 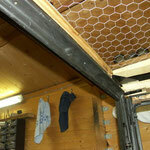 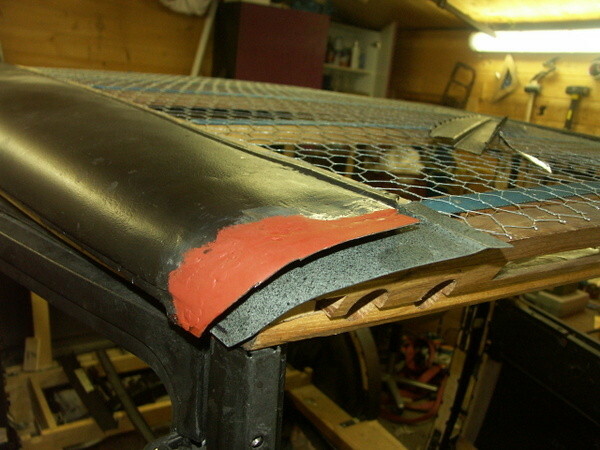 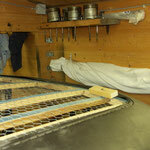 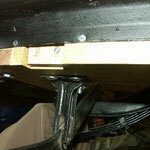 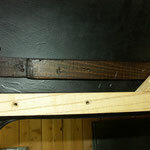 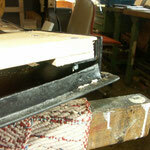 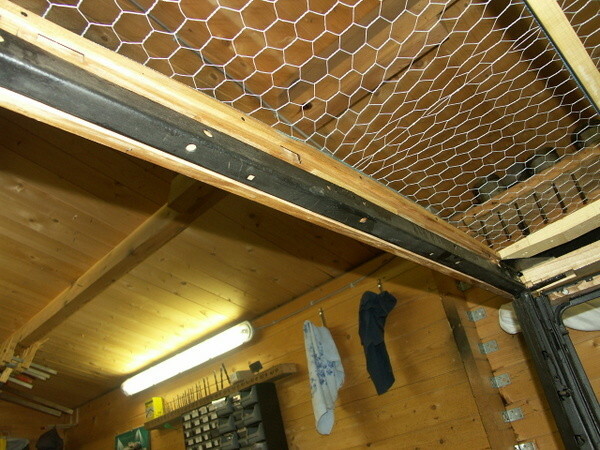 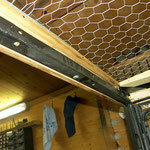 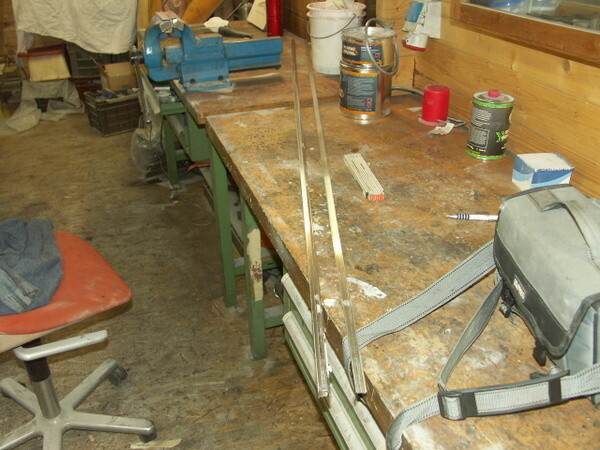 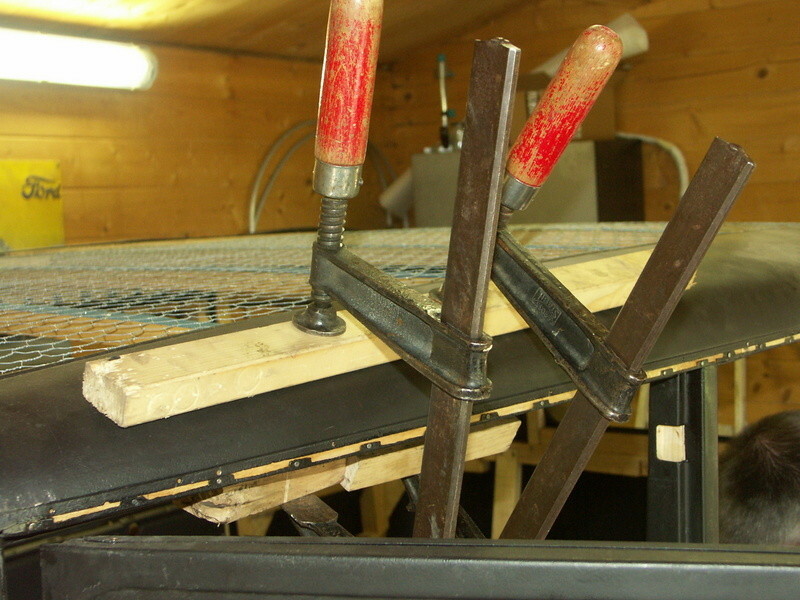 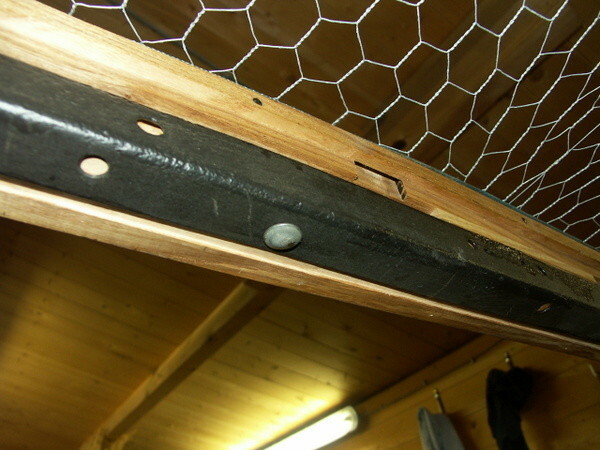 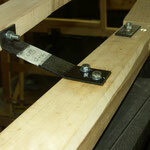 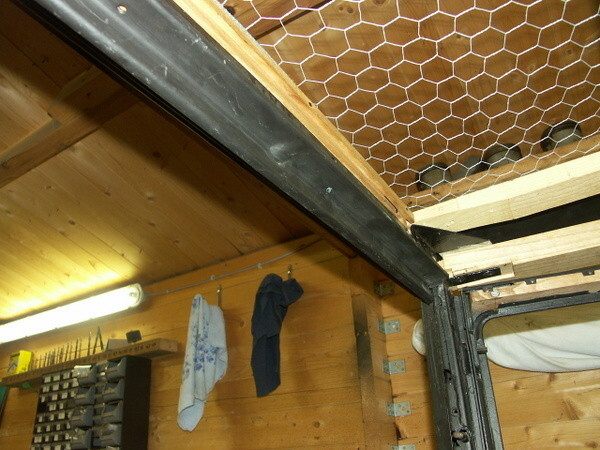 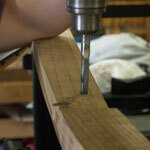 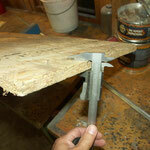 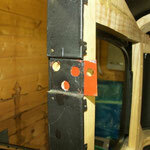 We decided not to form the sheet metal panel, but to support it with a small wooden strip. 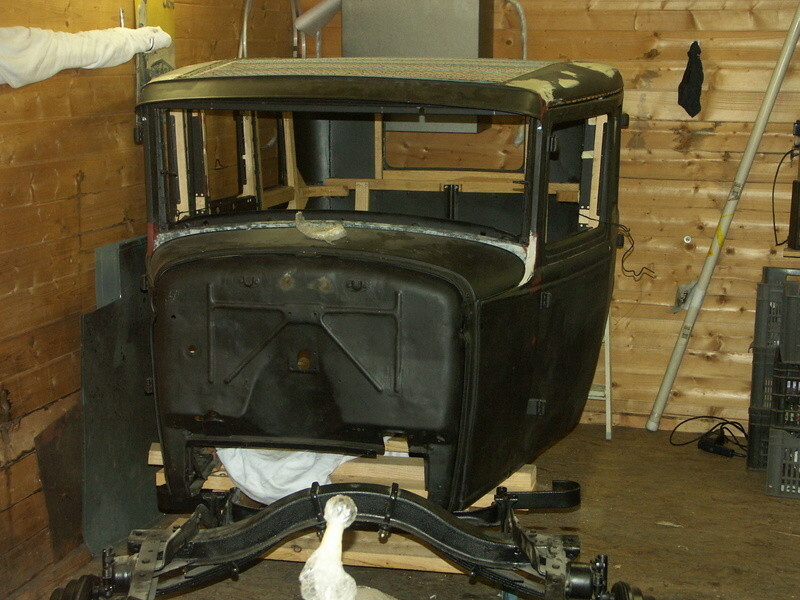 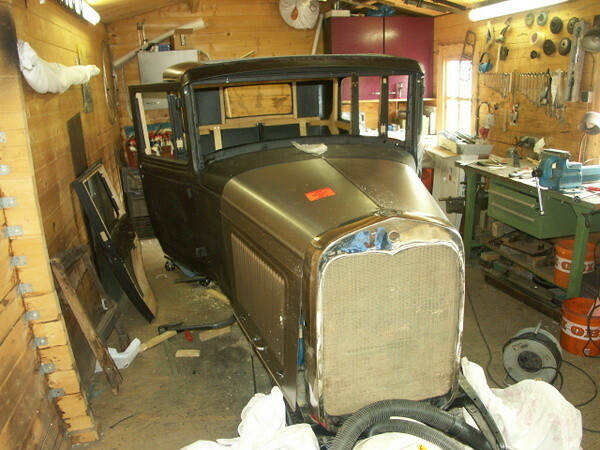 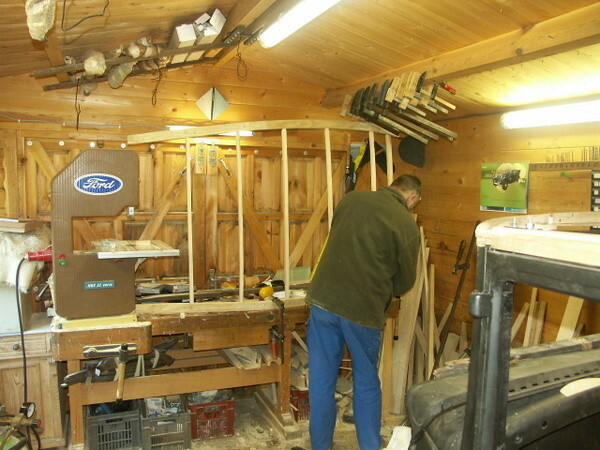 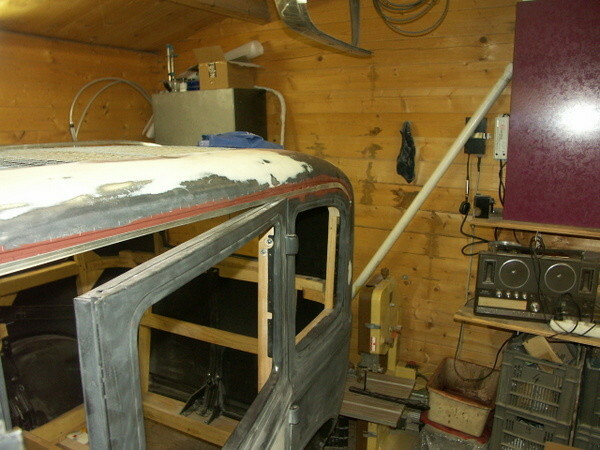 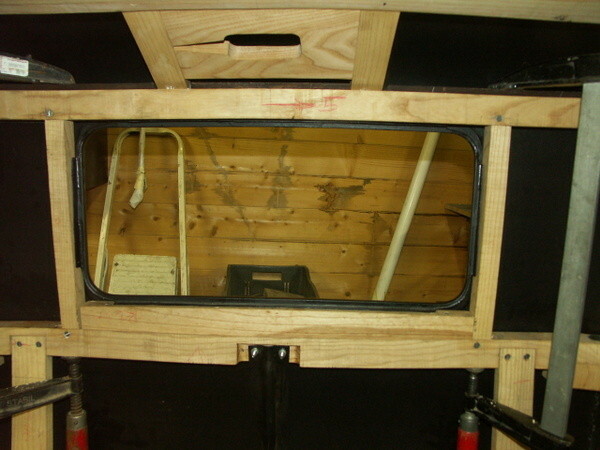 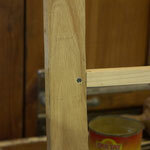 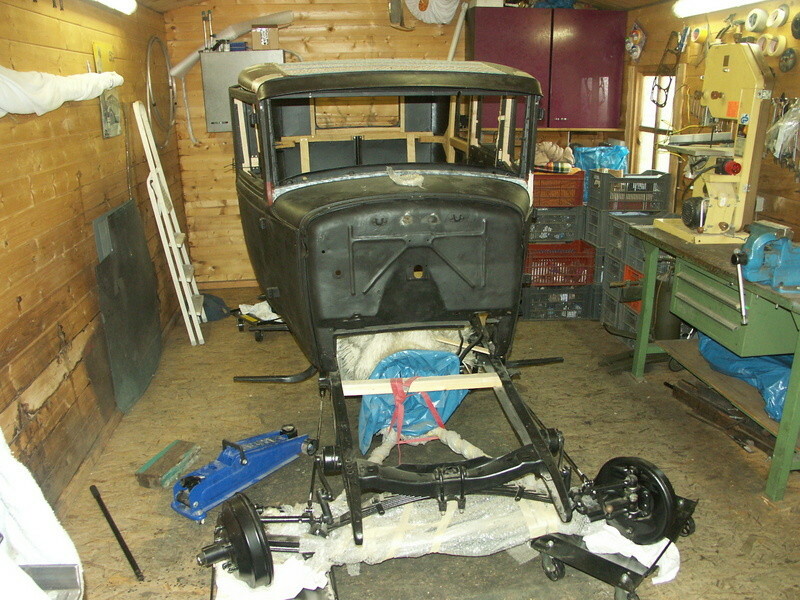 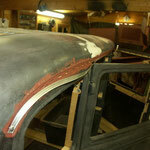 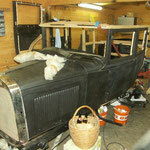 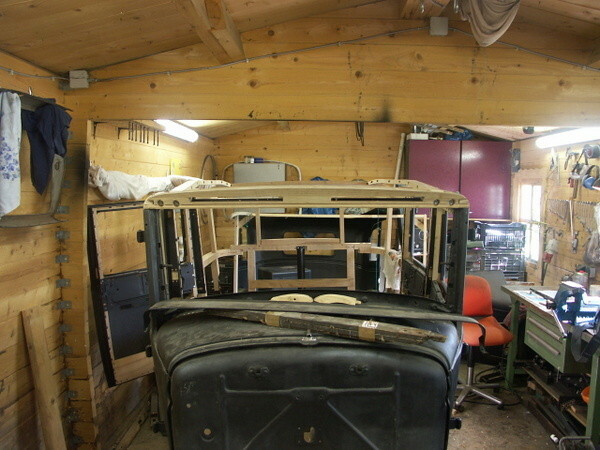 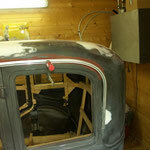 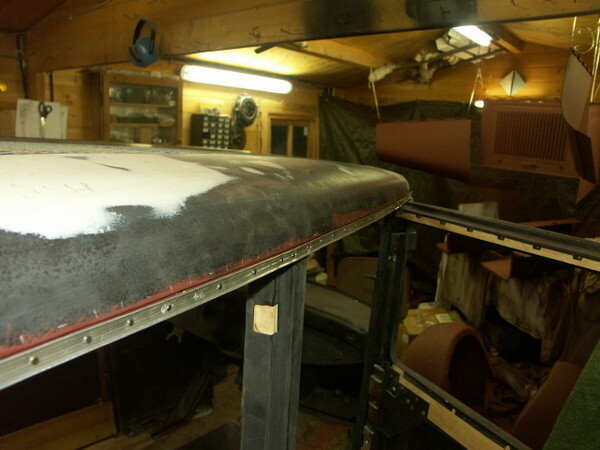 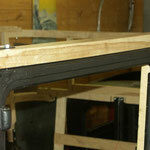 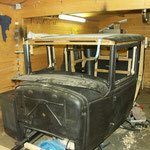 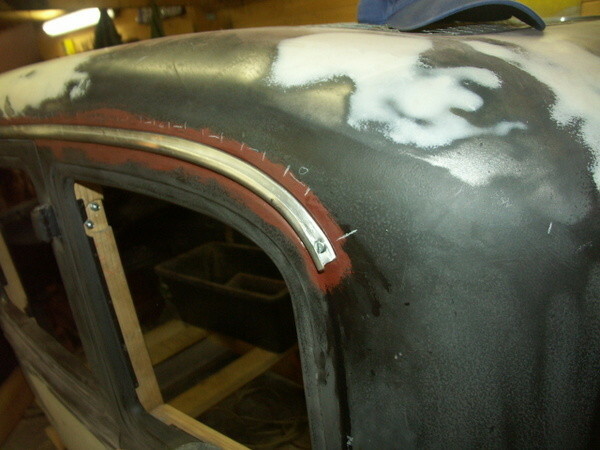 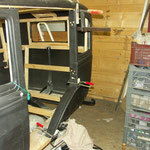 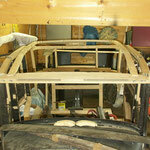 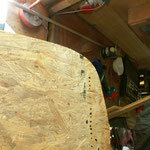 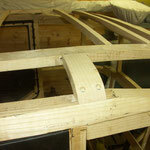 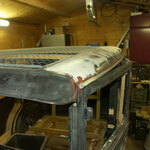 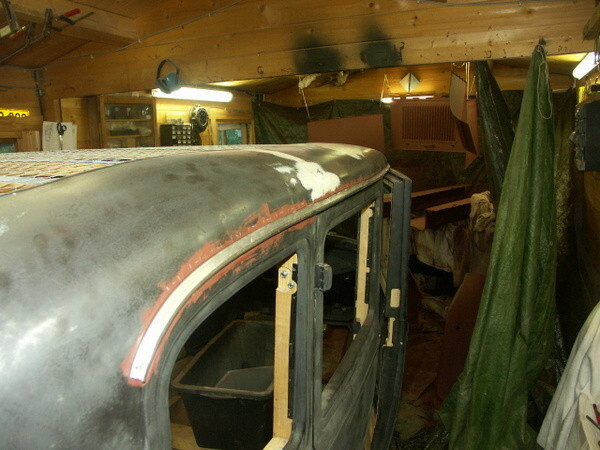 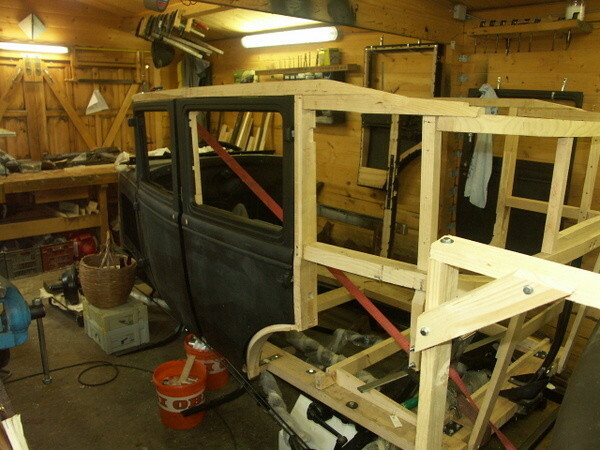 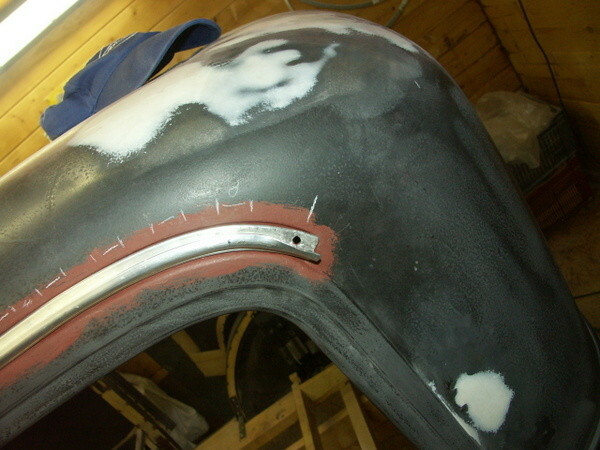 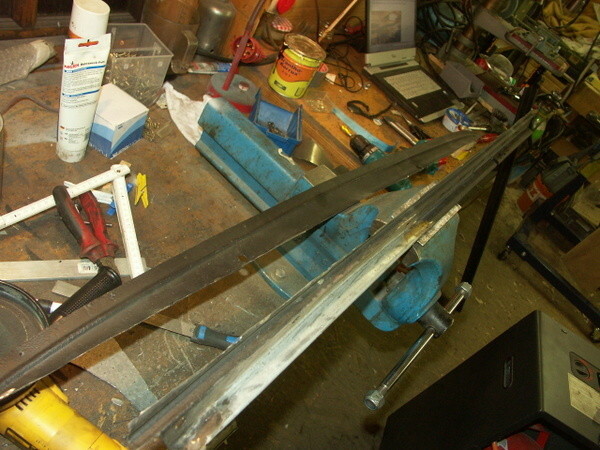 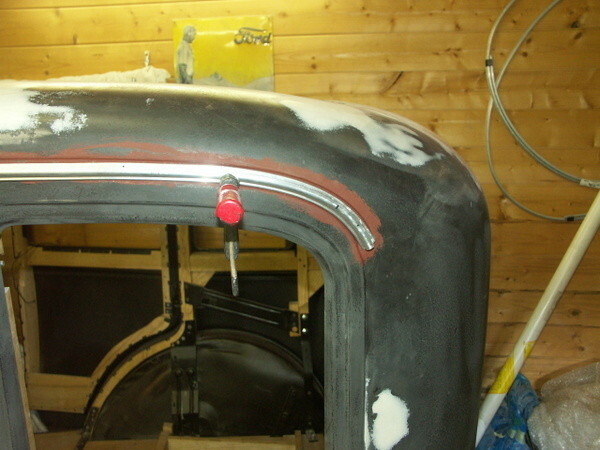 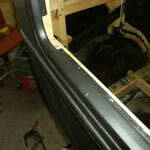 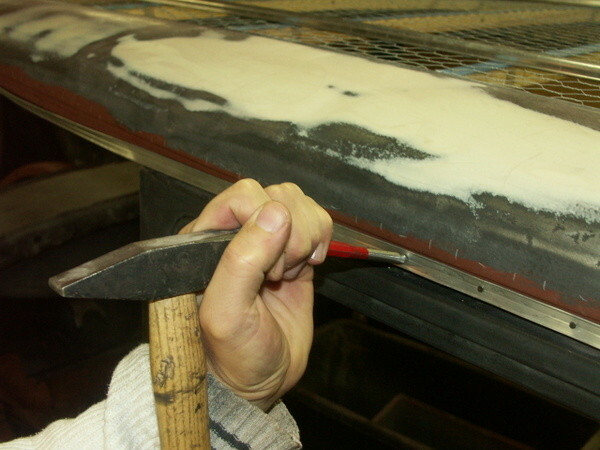 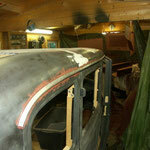 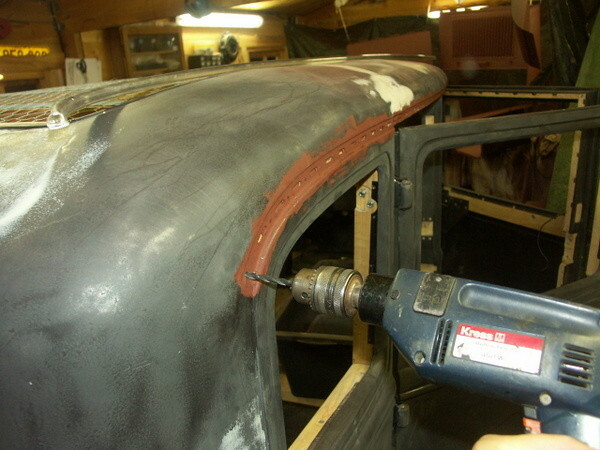 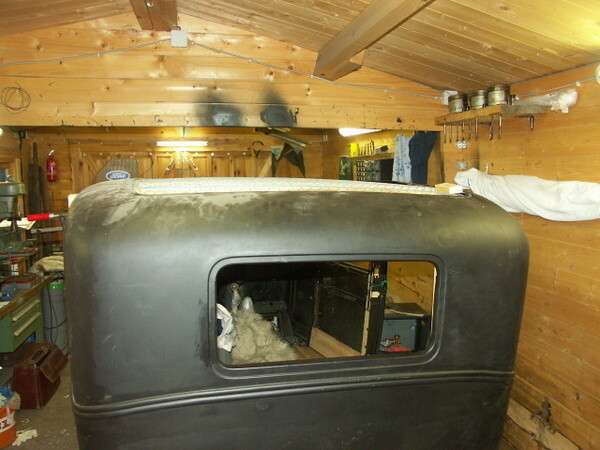 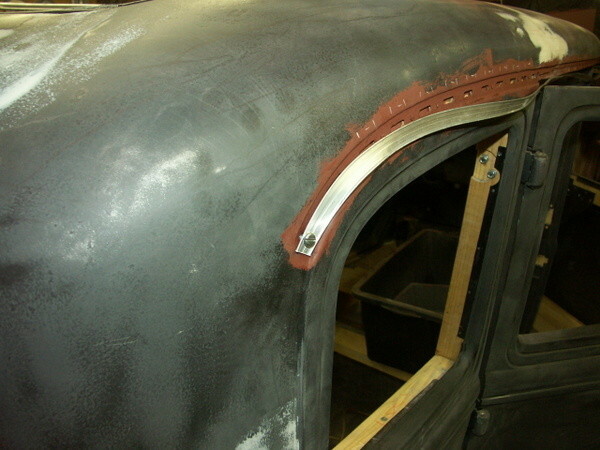 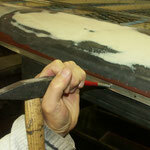 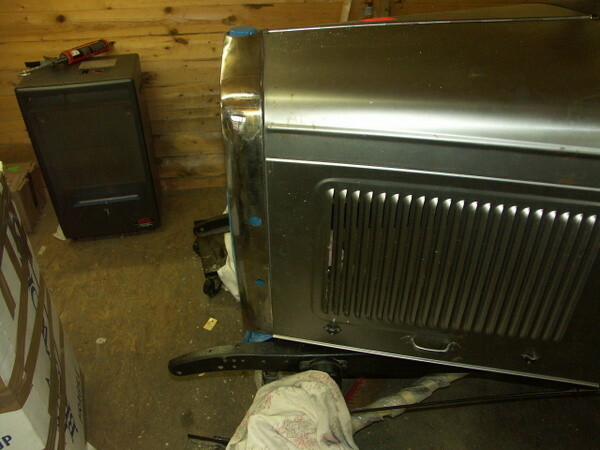 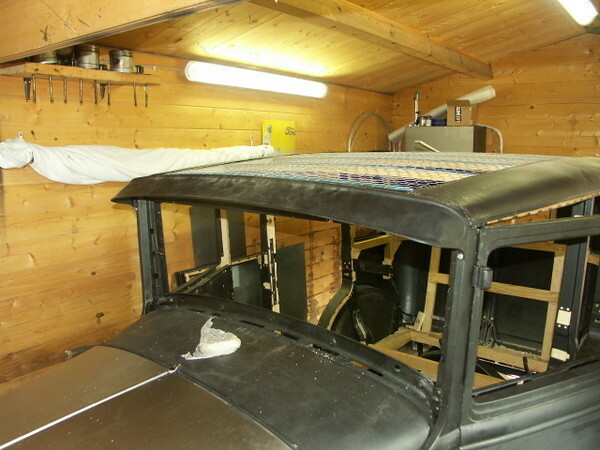 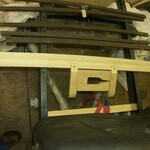 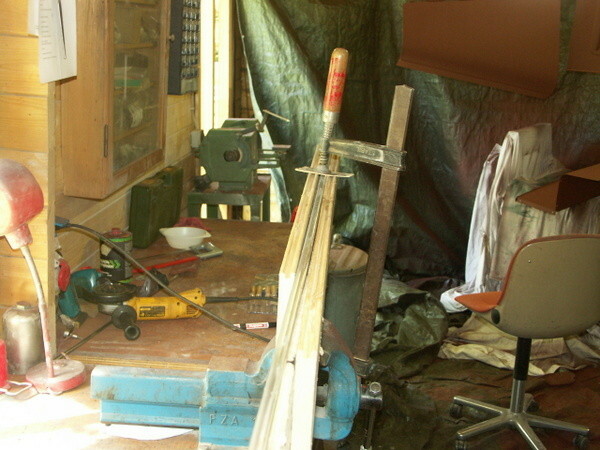 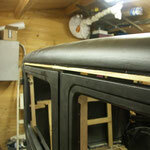 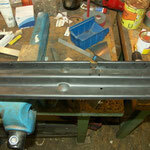 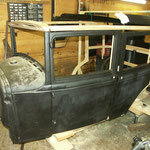 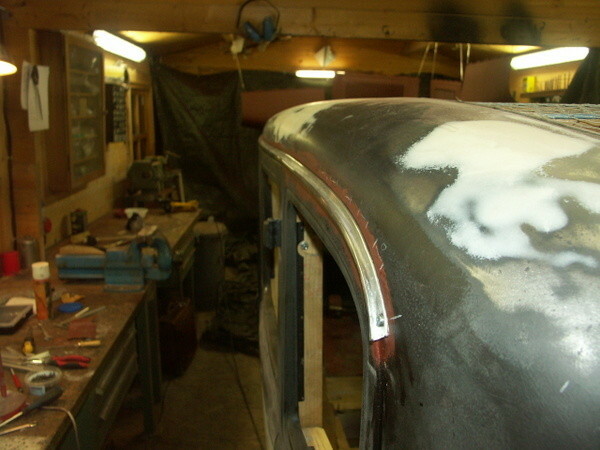 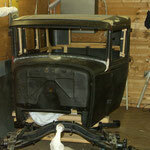 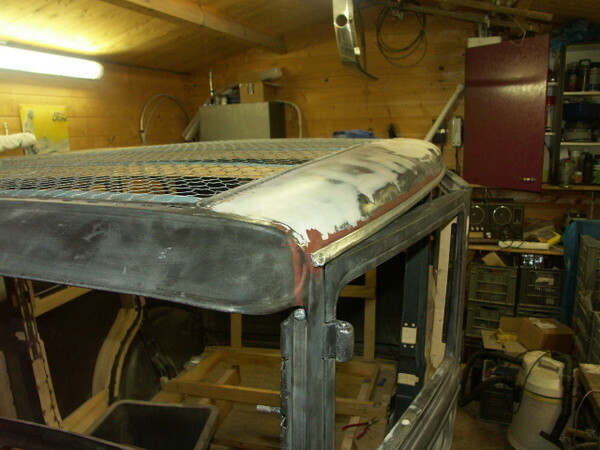 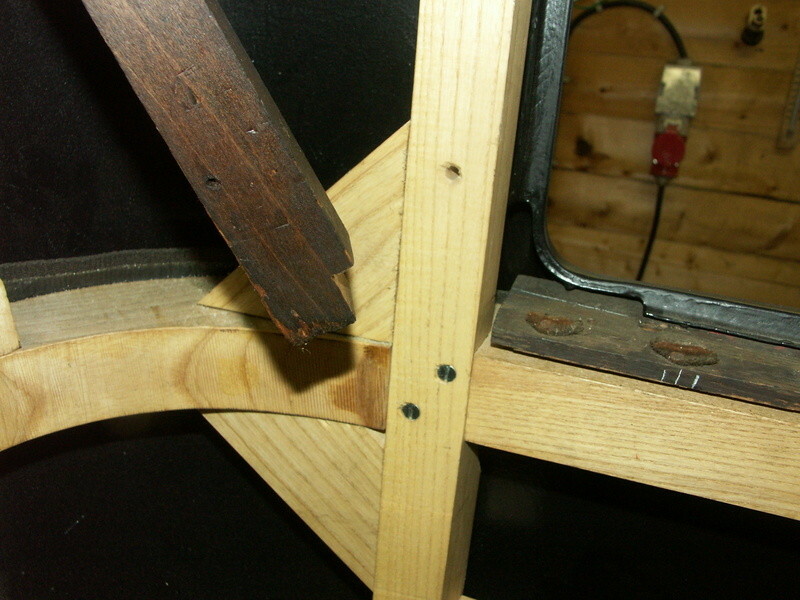 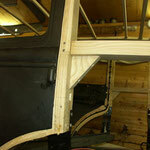 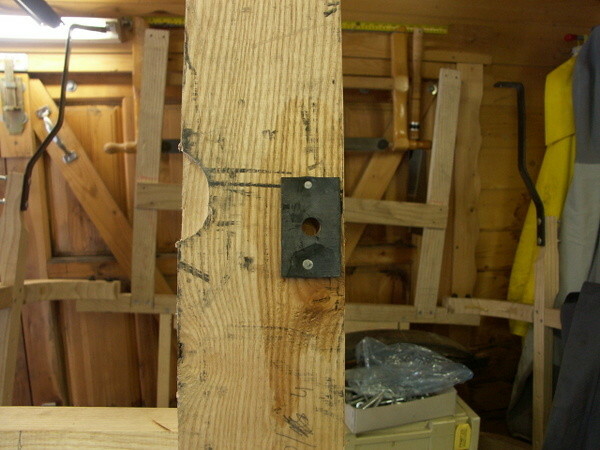 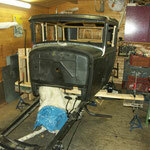 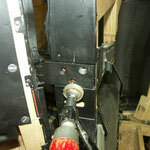 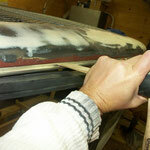 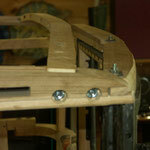 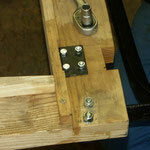 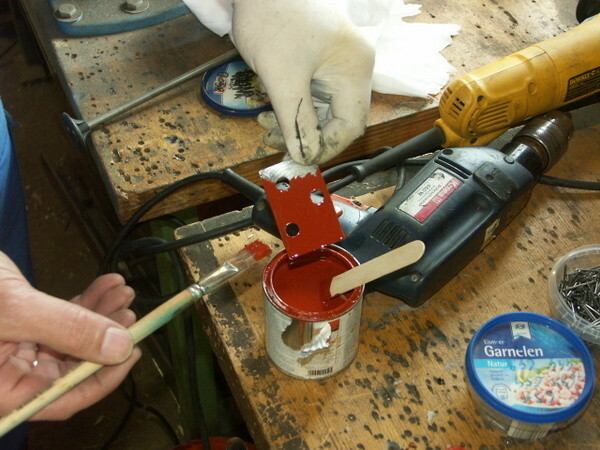 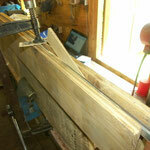 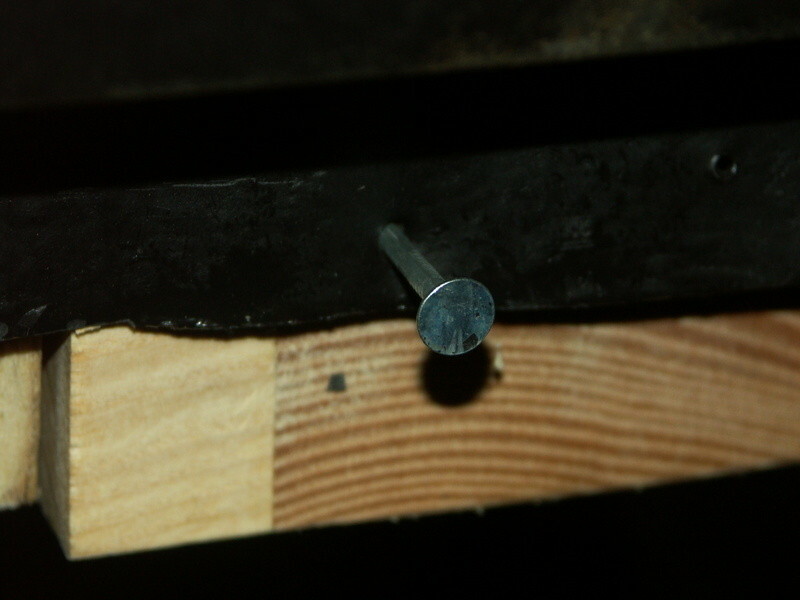 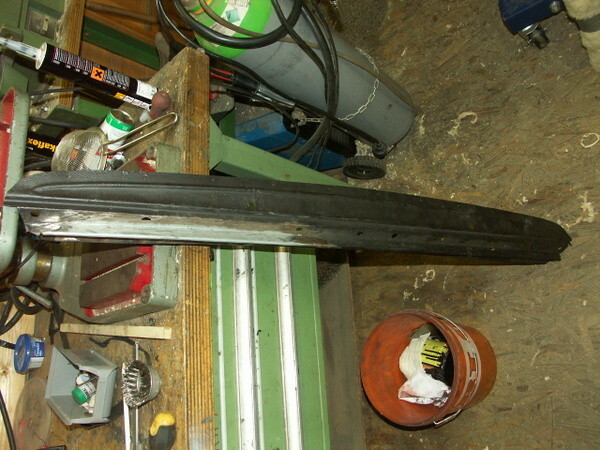 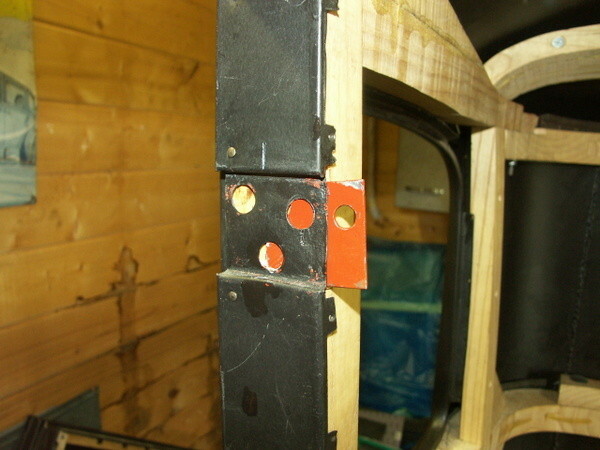 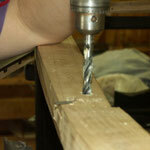 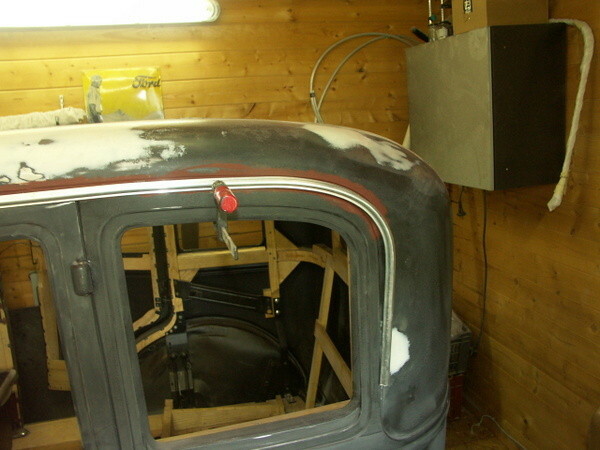 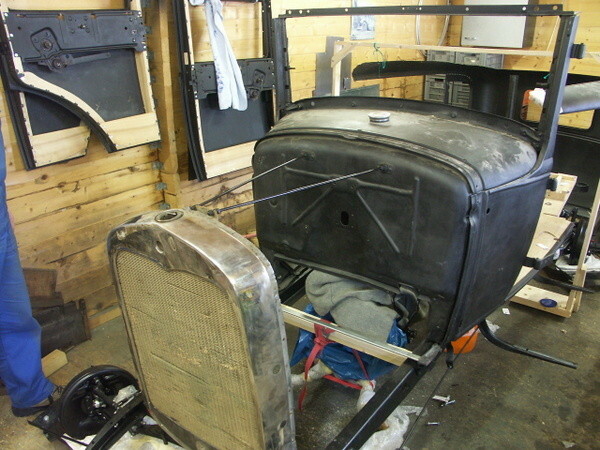 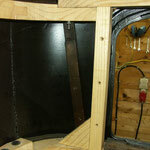 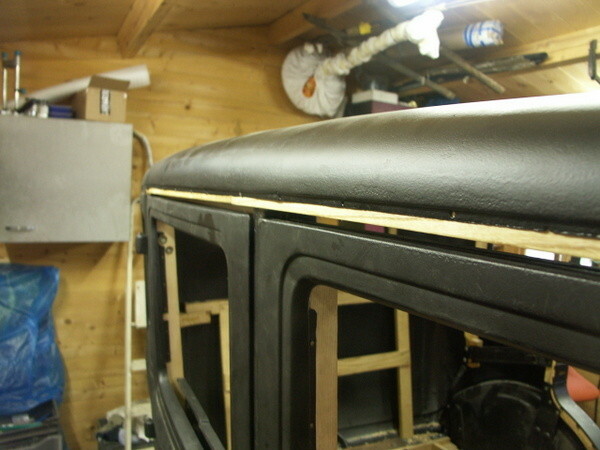 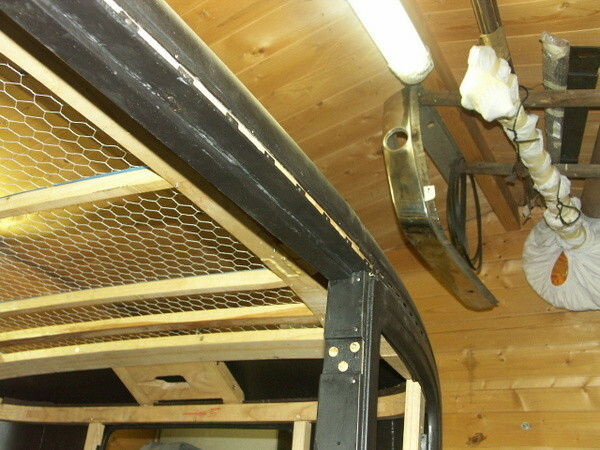 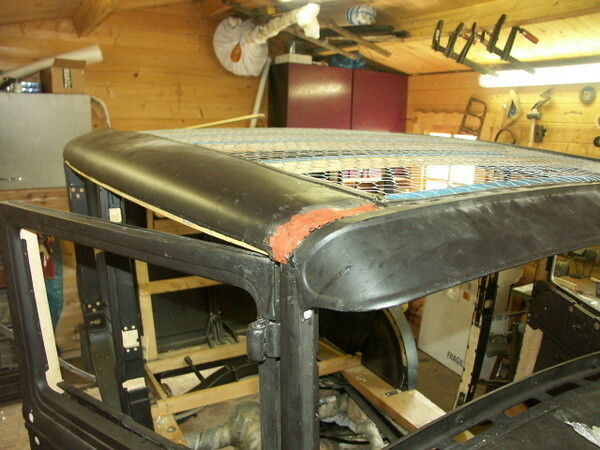 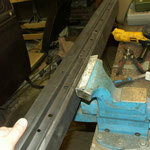 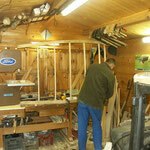 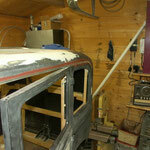 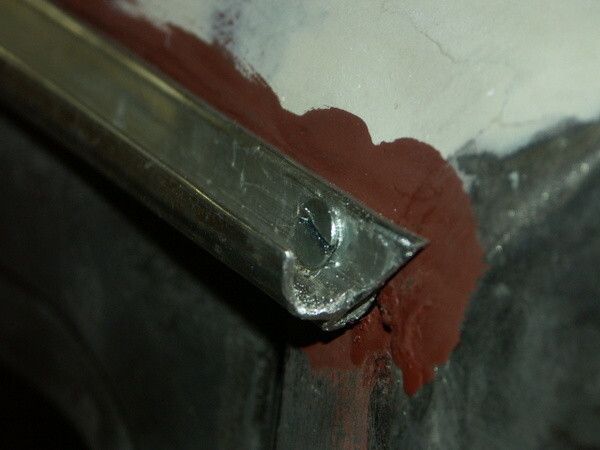 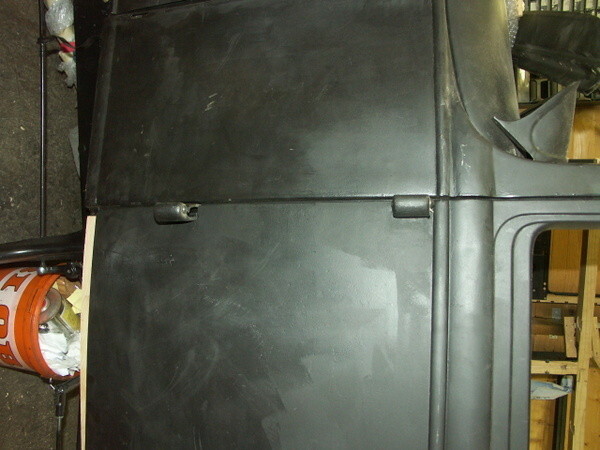 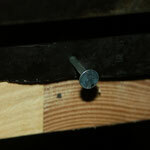 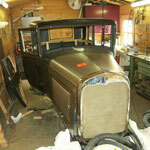 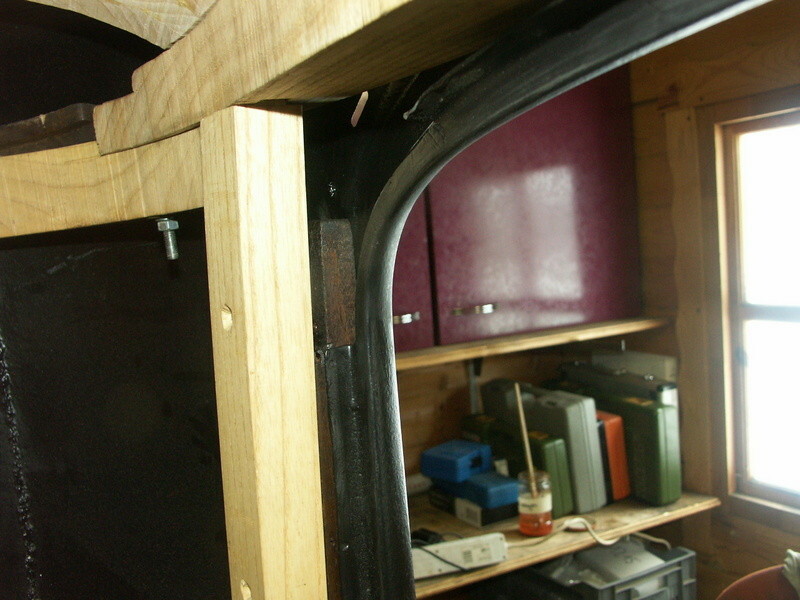 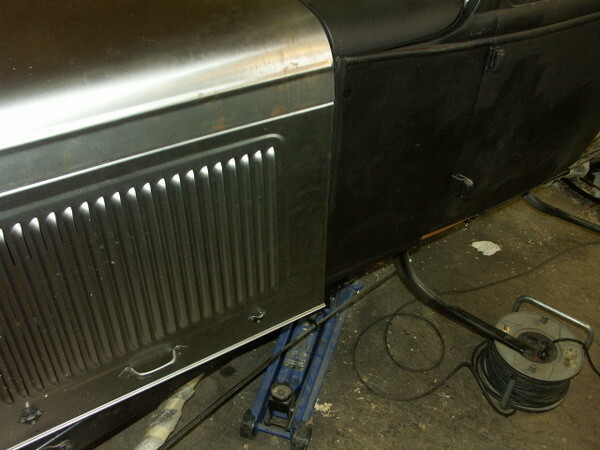 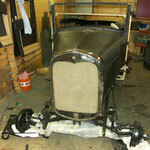 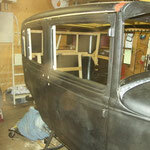 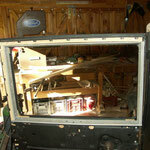 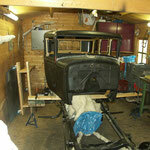 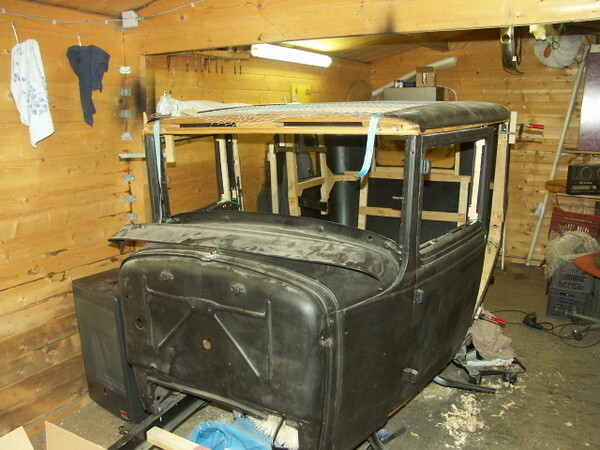 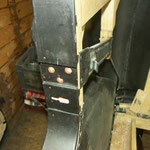 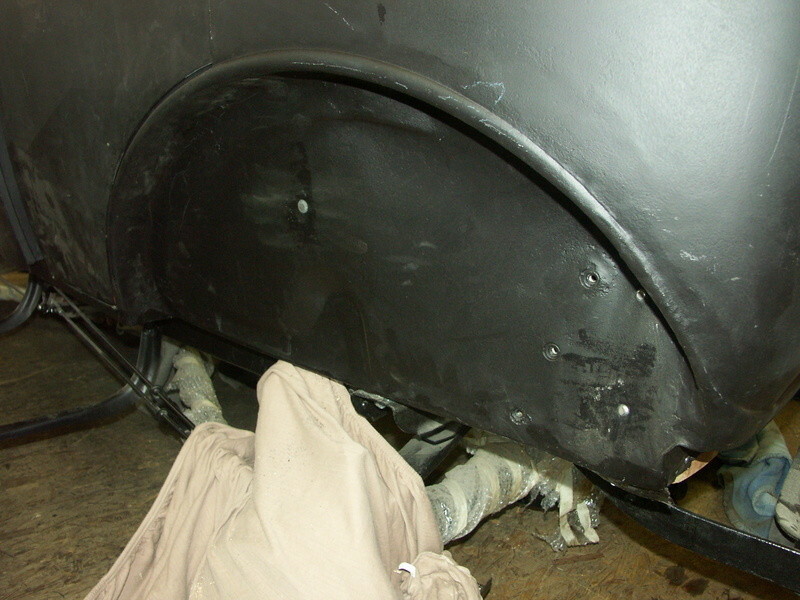 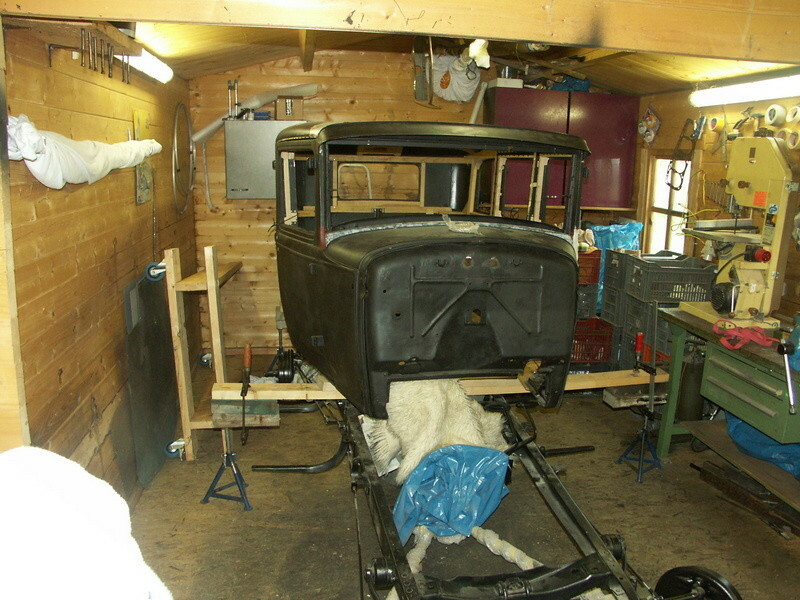 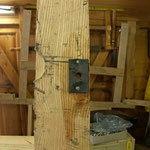 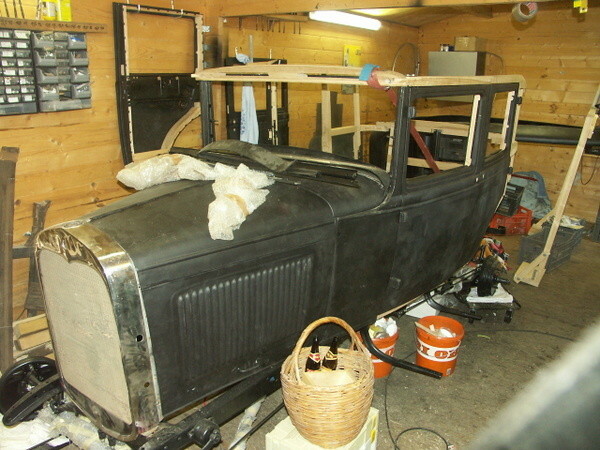 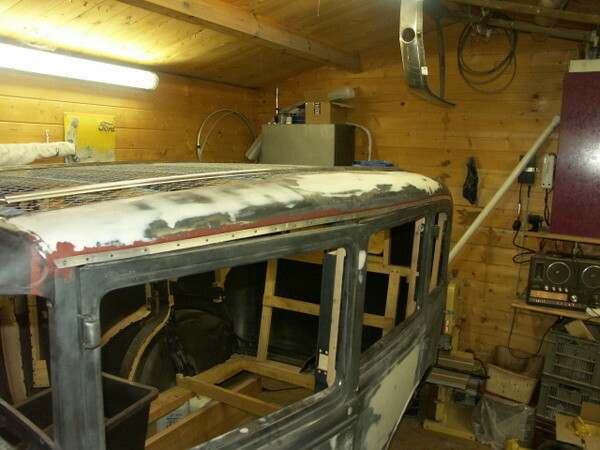 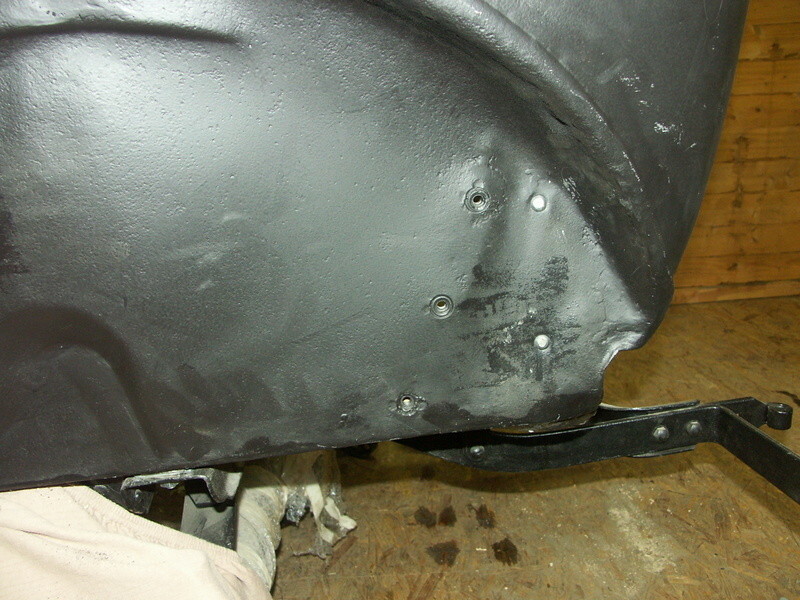 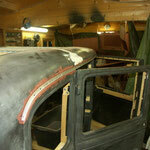 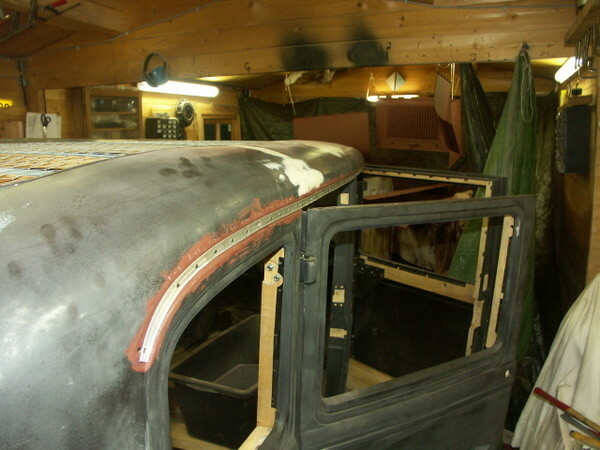 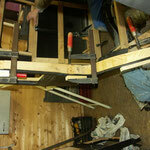 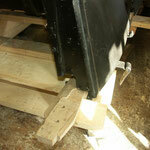 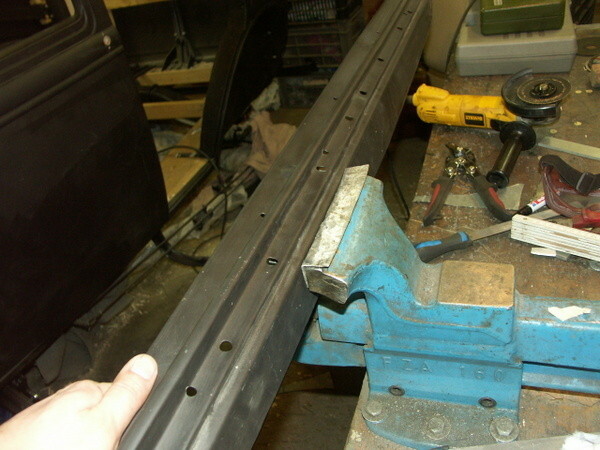 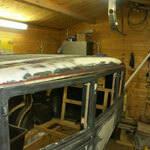 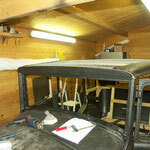 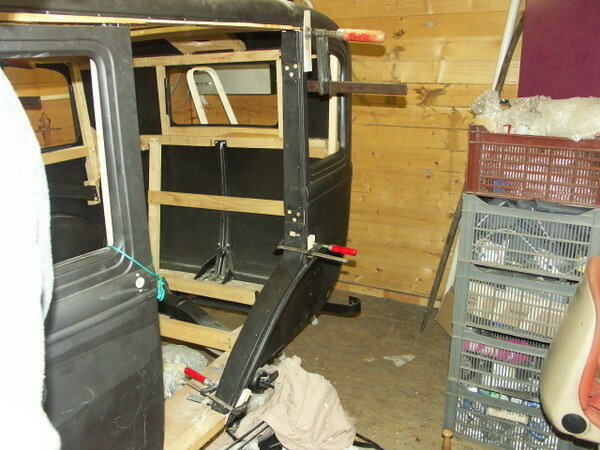 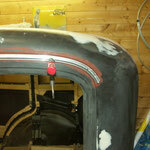 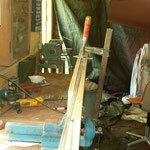 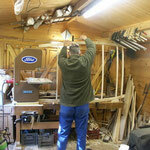 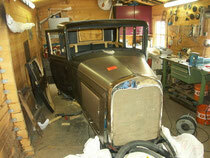 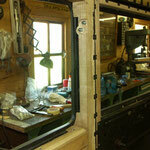 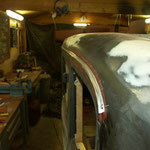 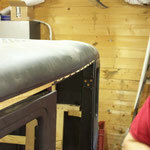 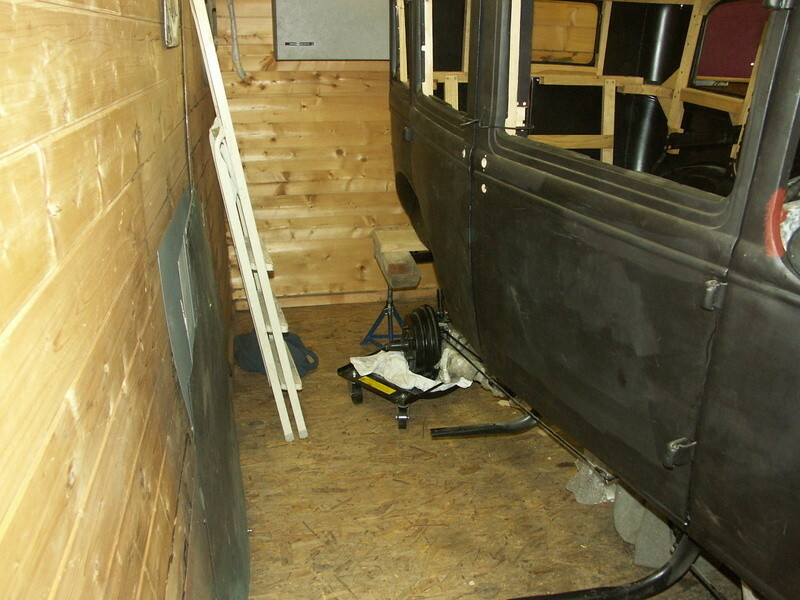 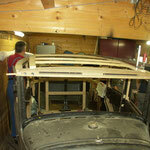 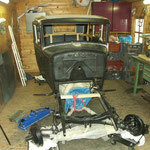 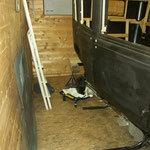 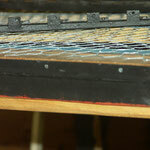 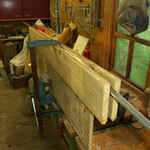 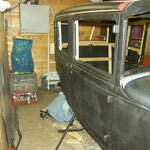 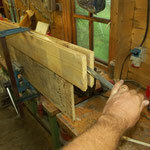 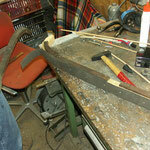 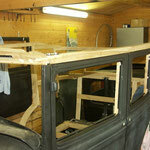 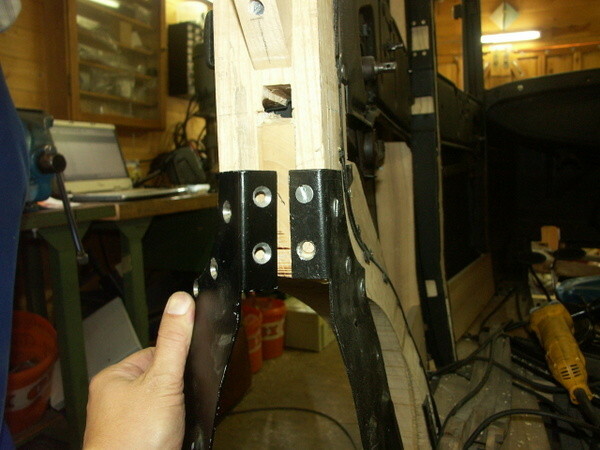 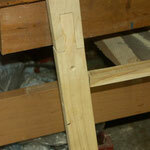 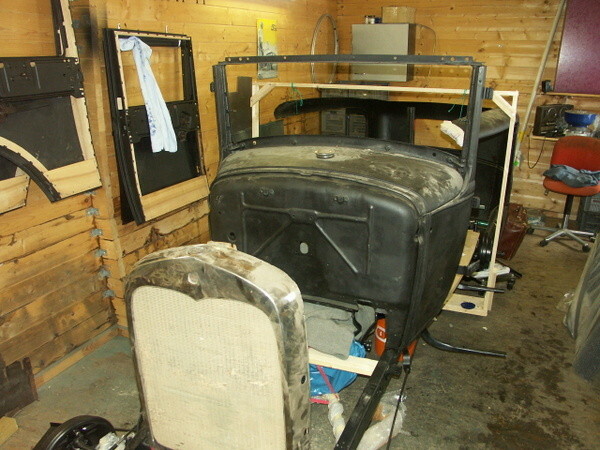 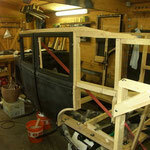 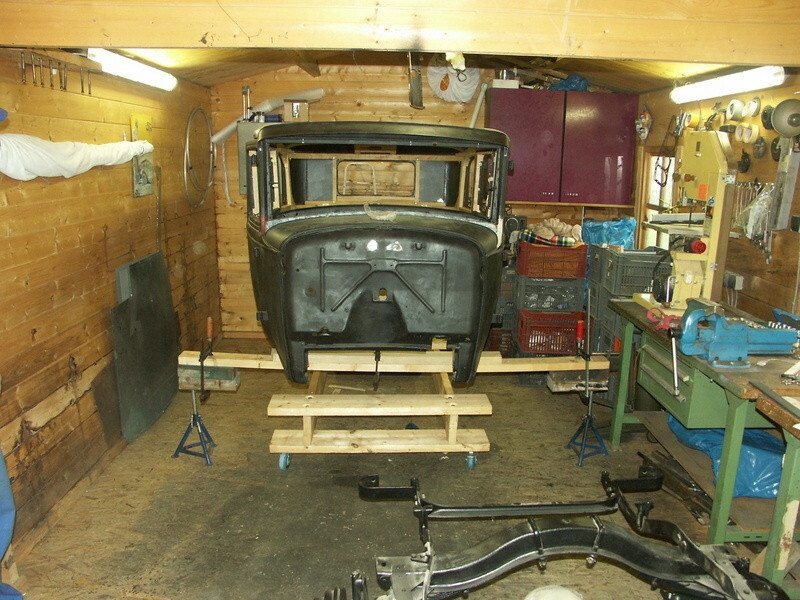 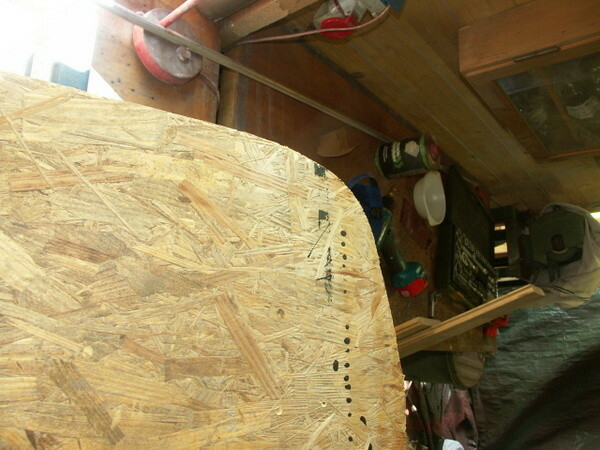 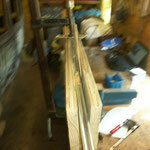 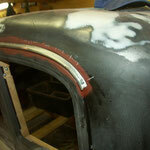 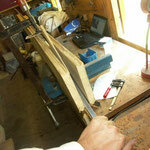 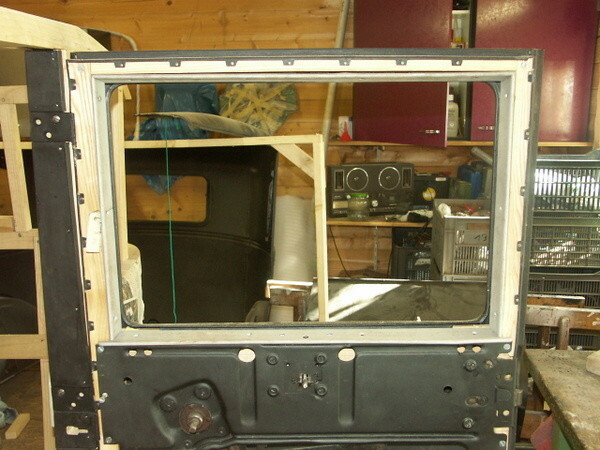 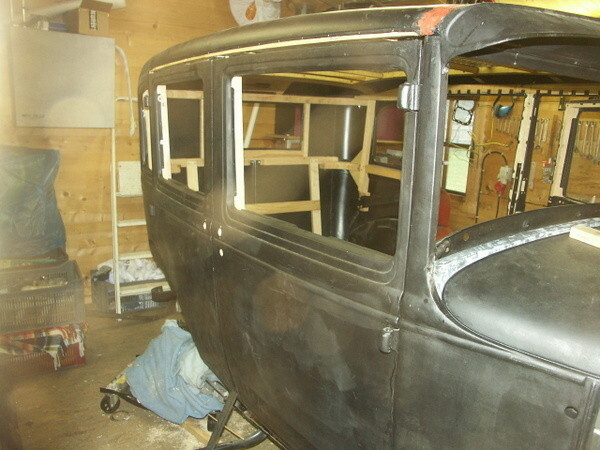 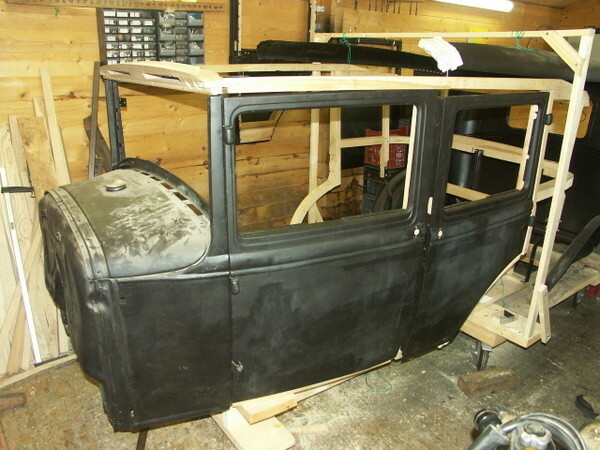 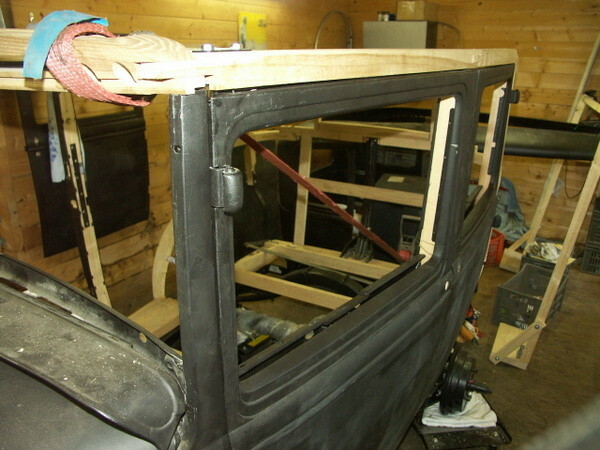 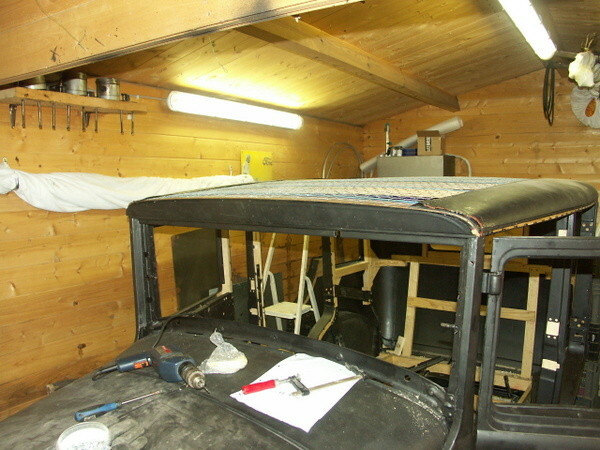 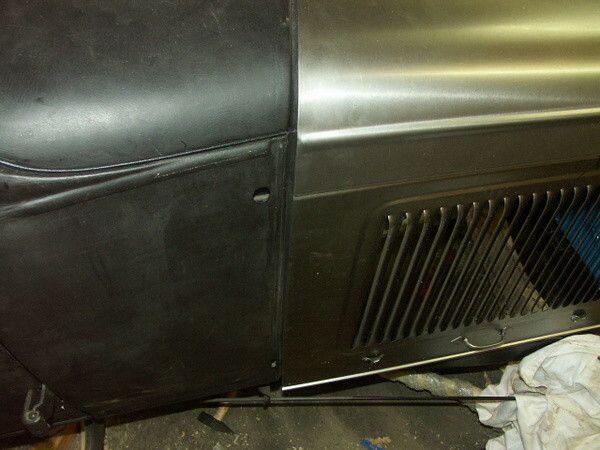 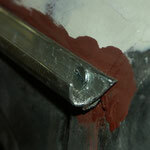 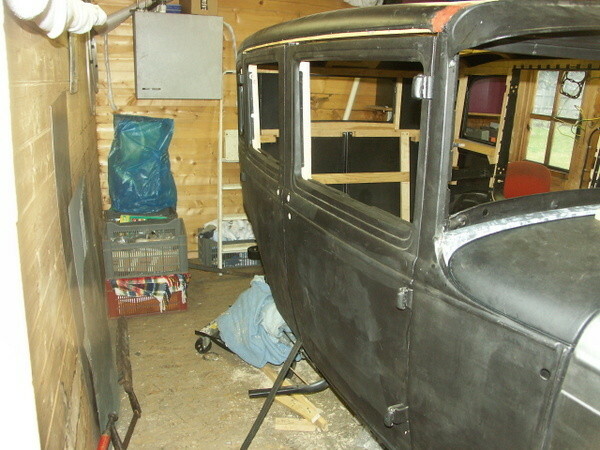 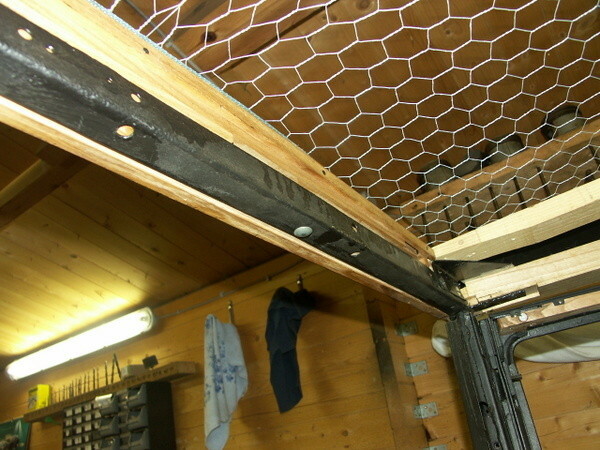 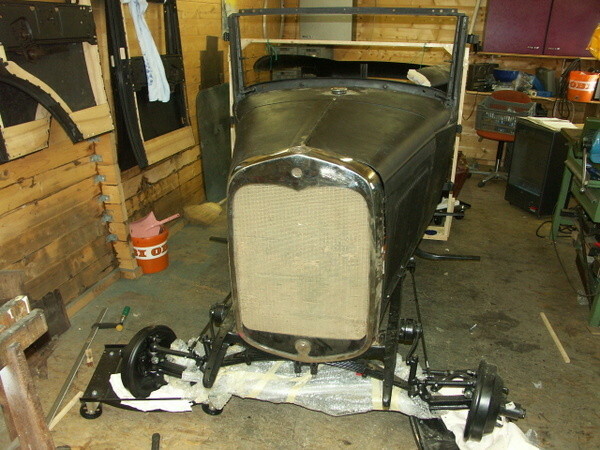 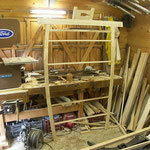 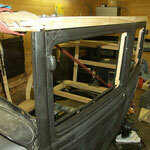 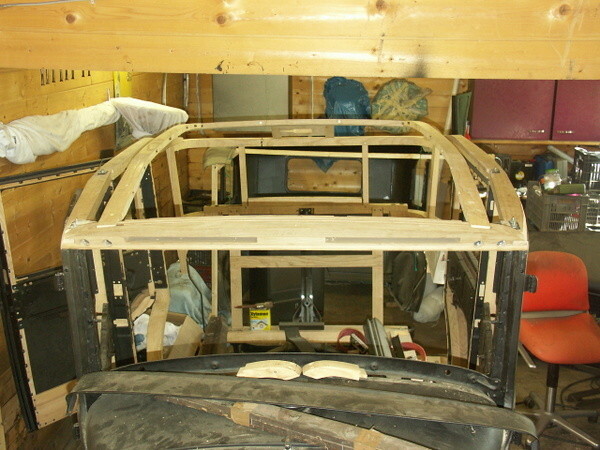 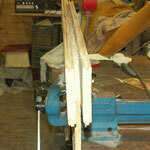 Then the fixing of the panels with nails was begun, starting with the rear left door. 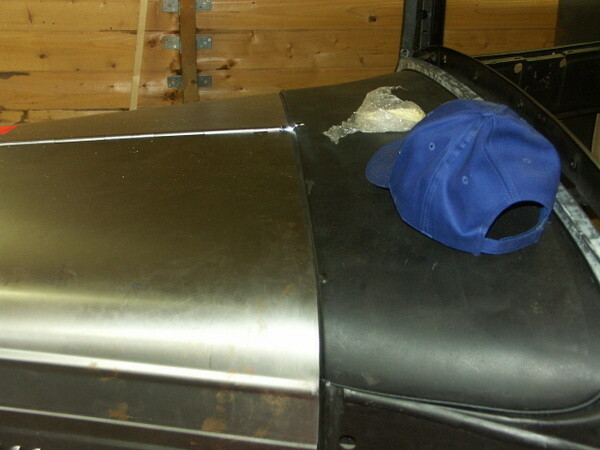 March 9th 2014: Sunvisor and Panel above windshield. 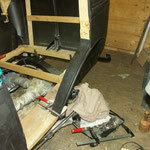 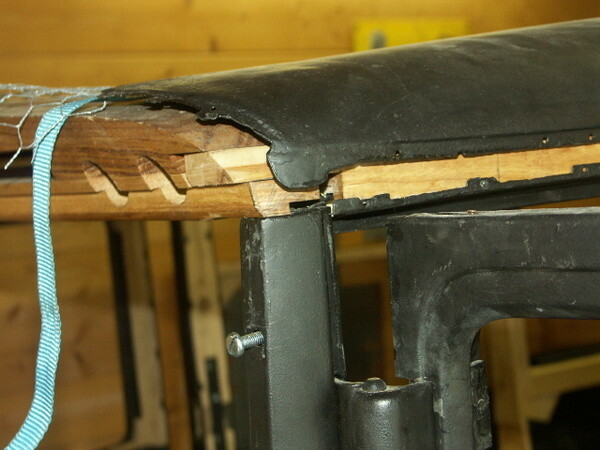 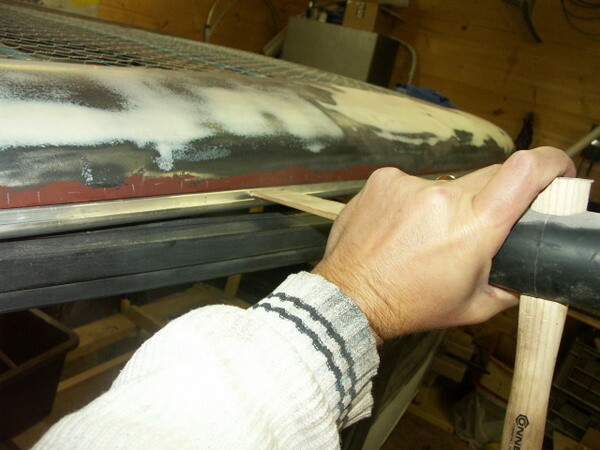 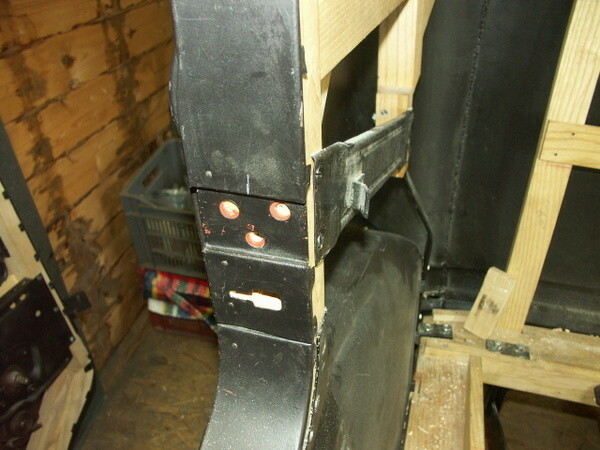 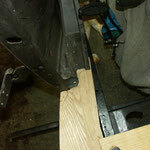 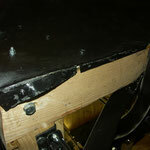 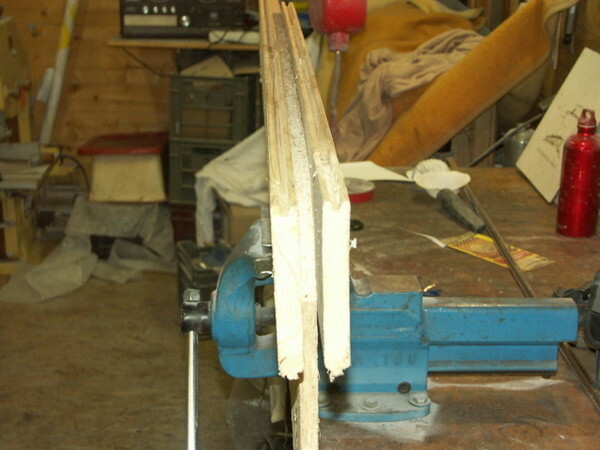 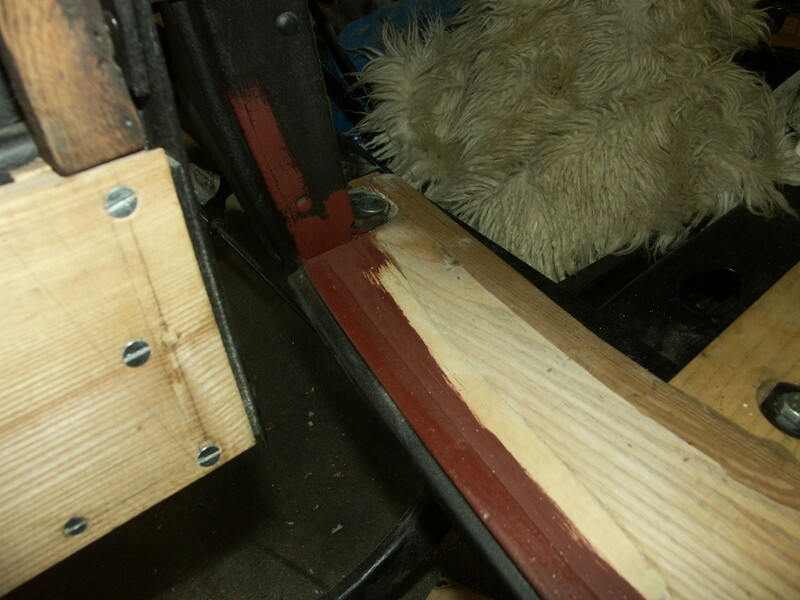 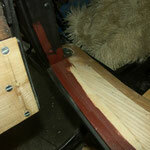 Now the tricky bit starts: Due to the accident of the car informer times the fit of the main body panel to the wood is very bad. 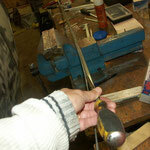 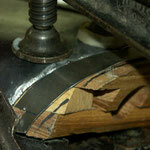 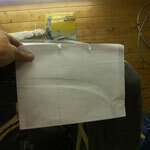 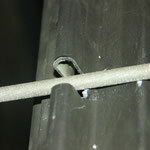 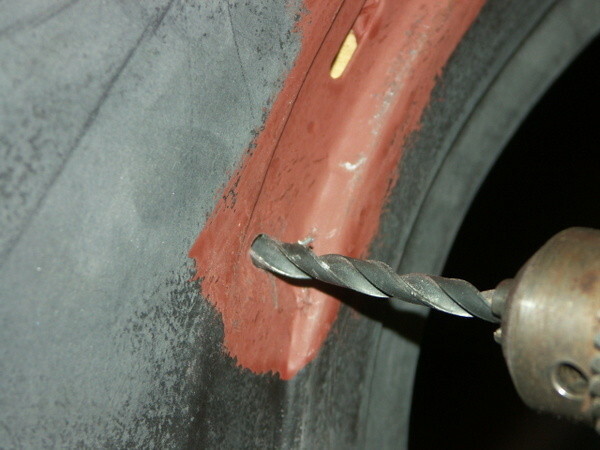 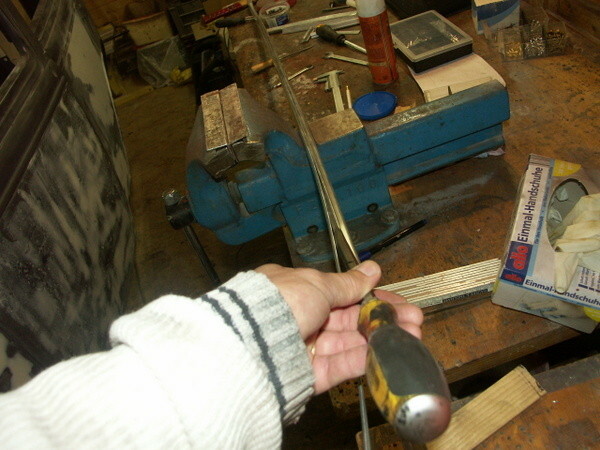 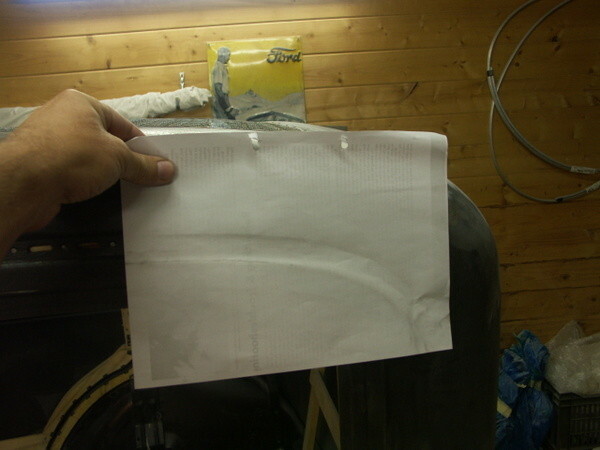 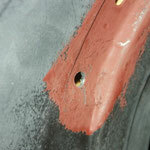 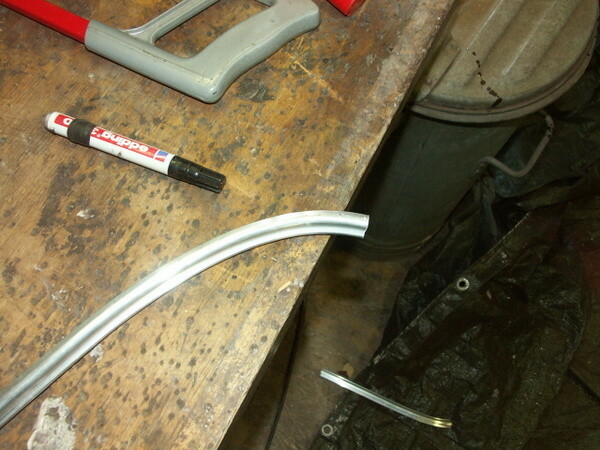 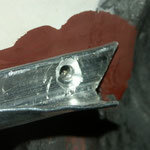 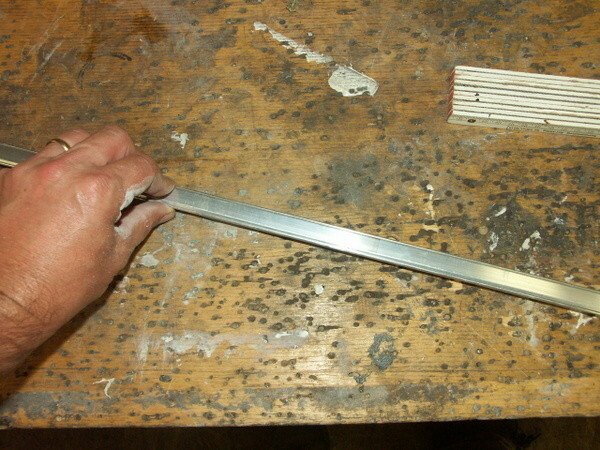 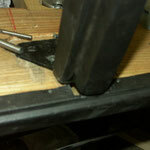 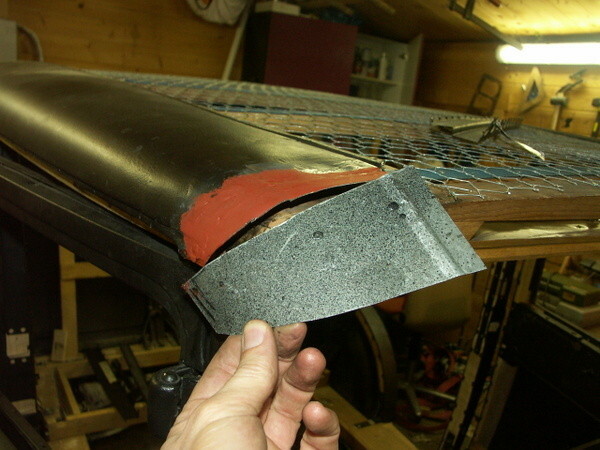 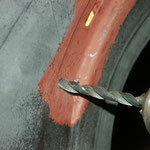 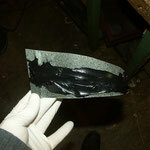 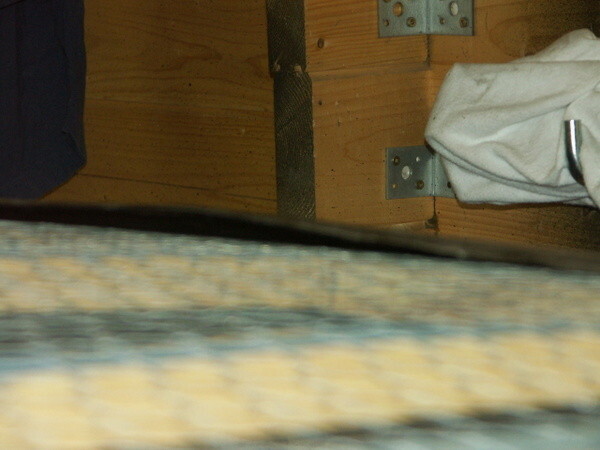 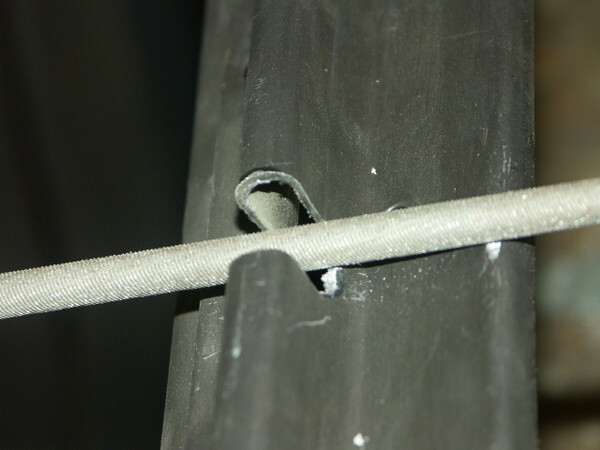 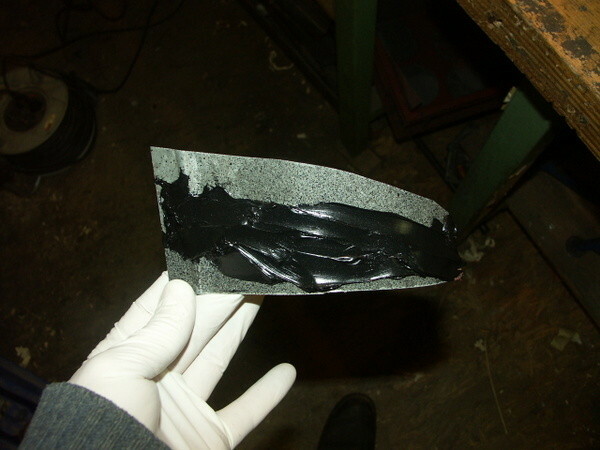 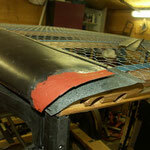 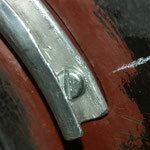 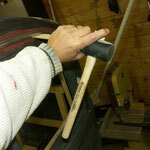 That comes probaly from a distorted cowl section respective bent cowl posts: The cowl posts are approcimately a half inch or 1,5 cm out of line to each other. 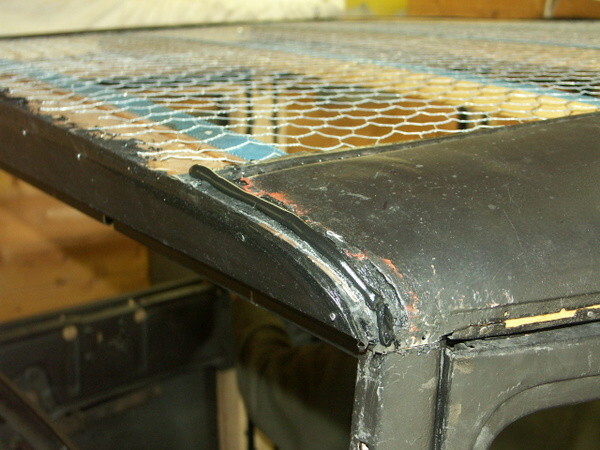 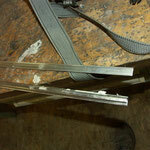 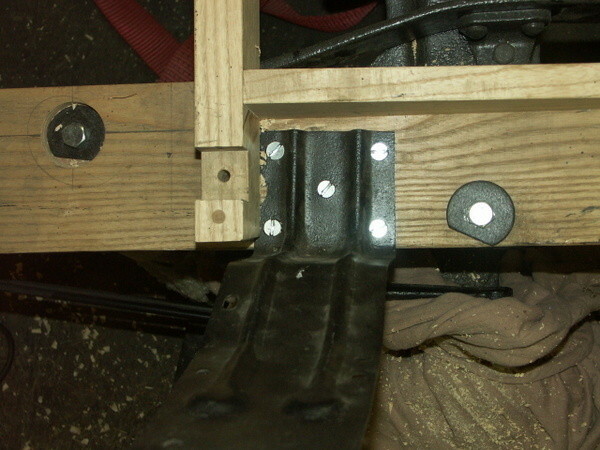 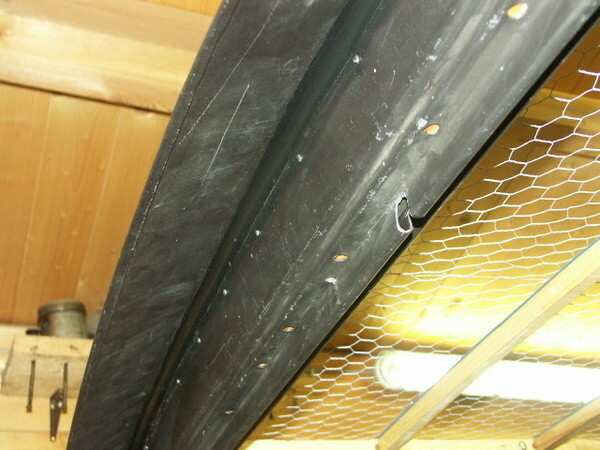 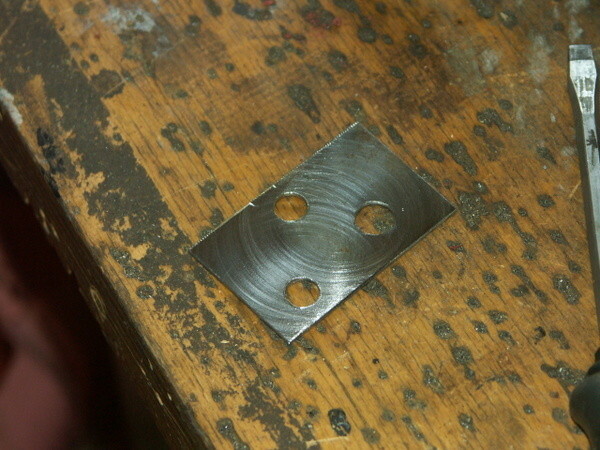 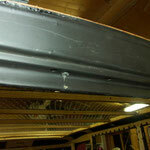 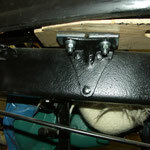 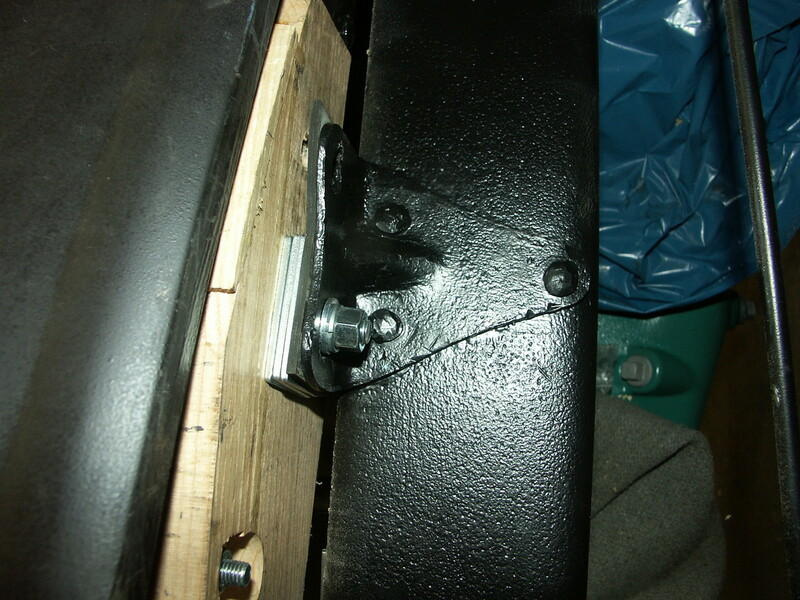 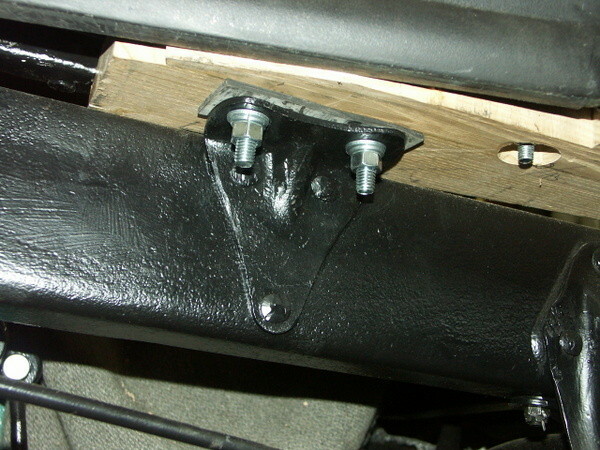 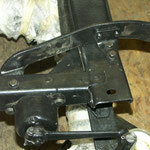 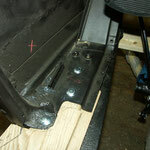 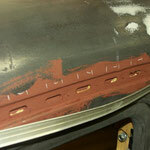 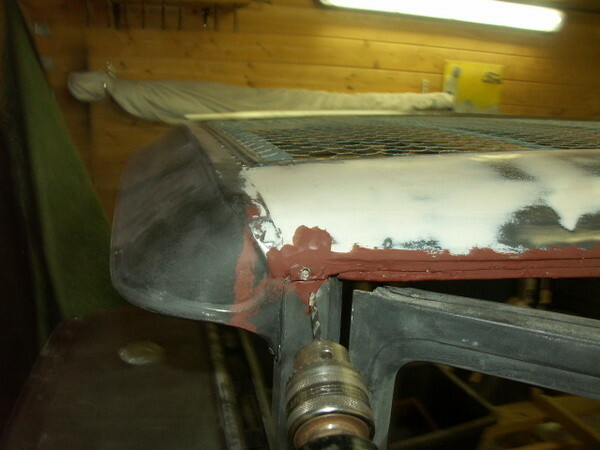 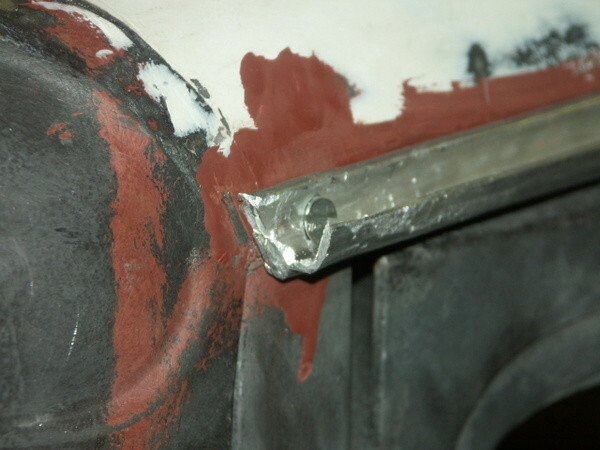 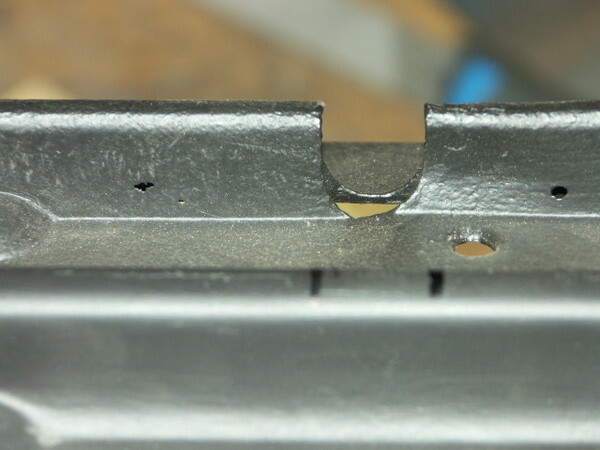 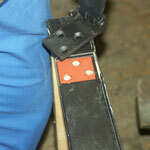 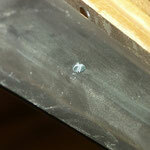 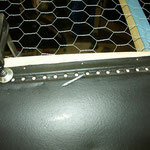 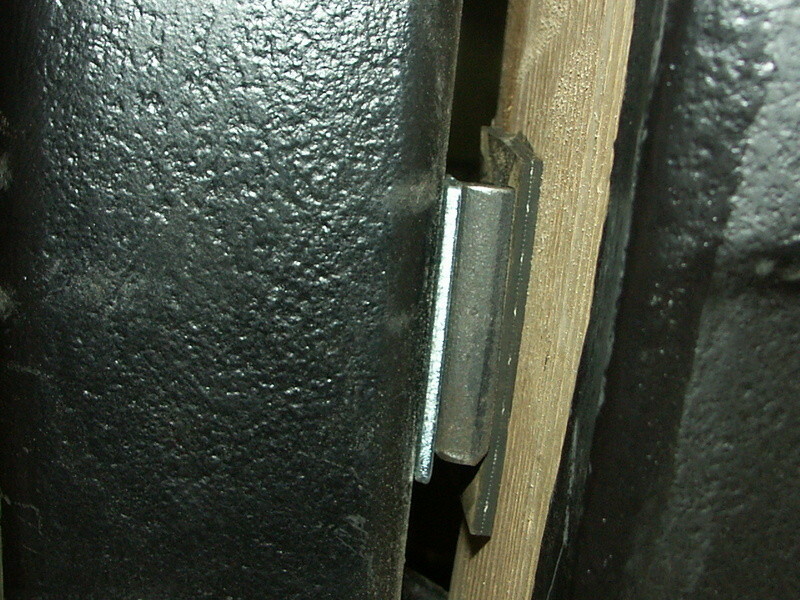 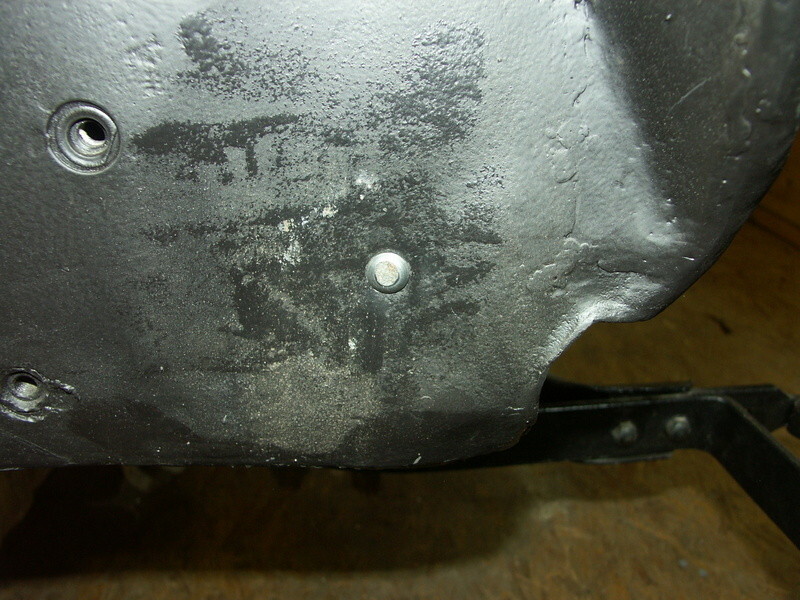 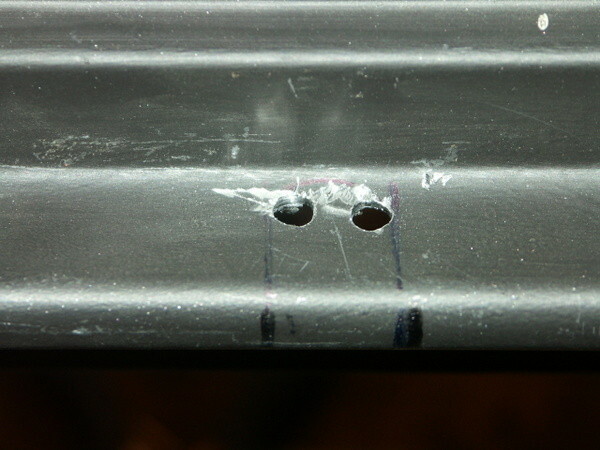 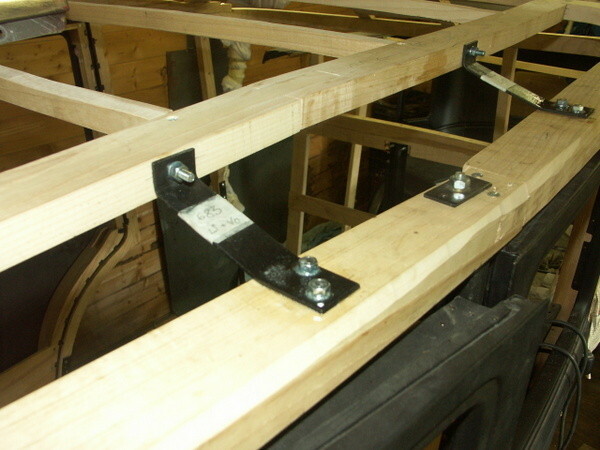 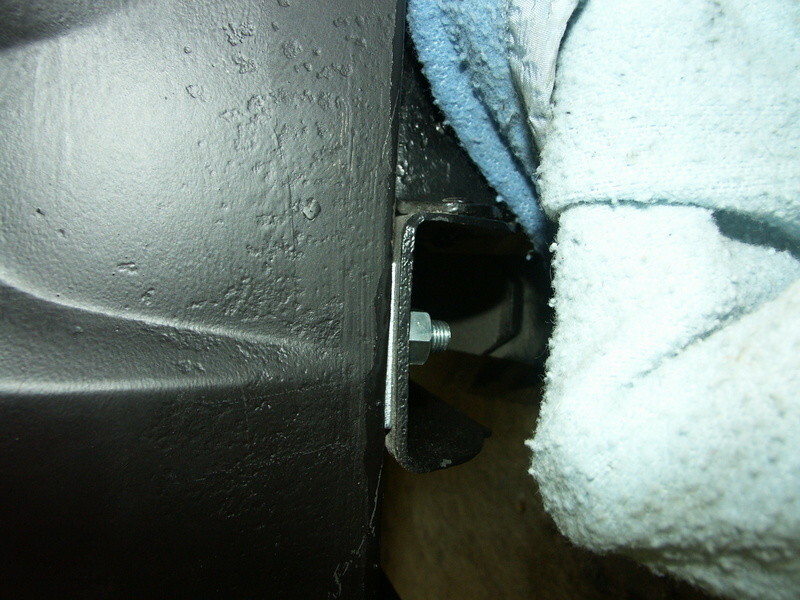 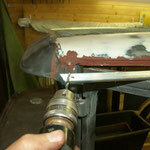 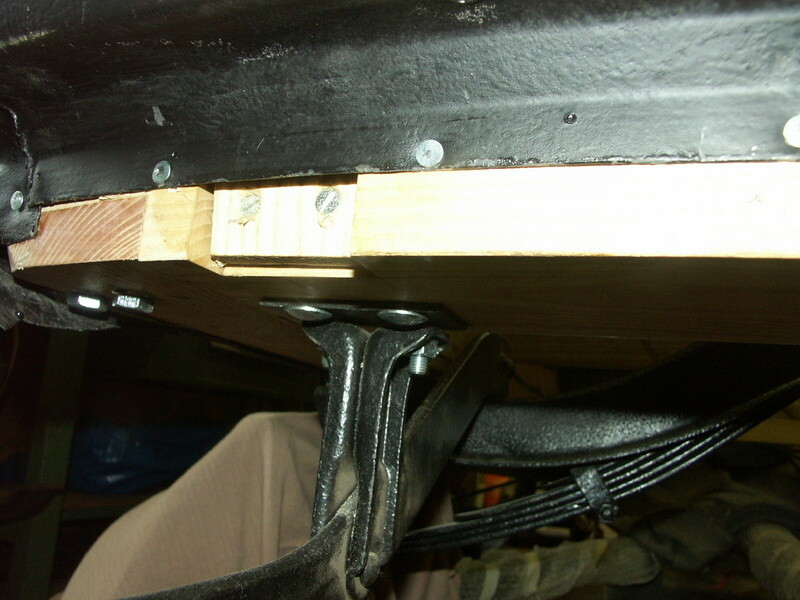 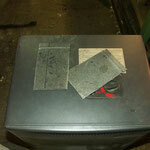 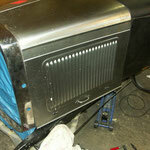 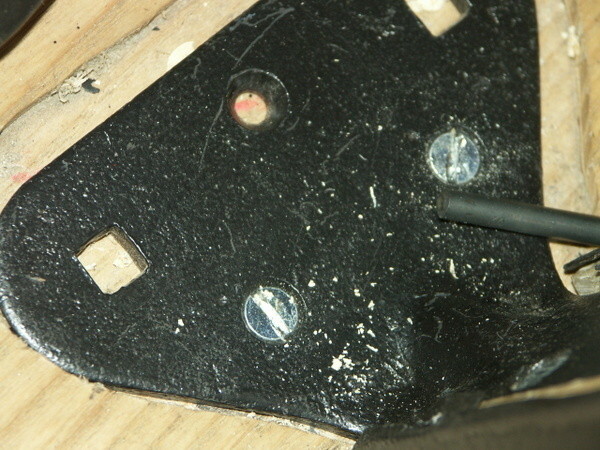 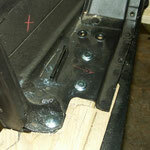 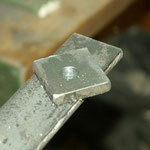 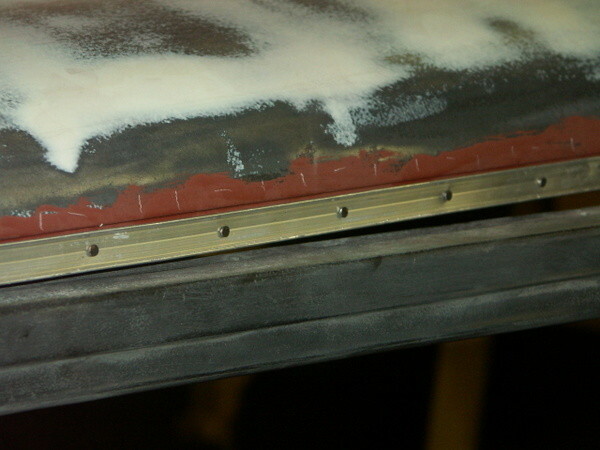 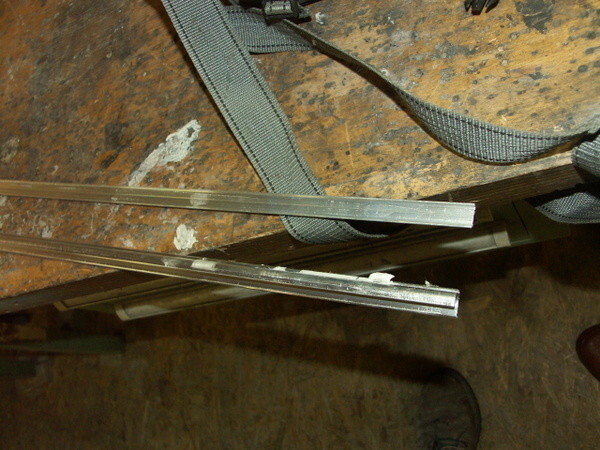 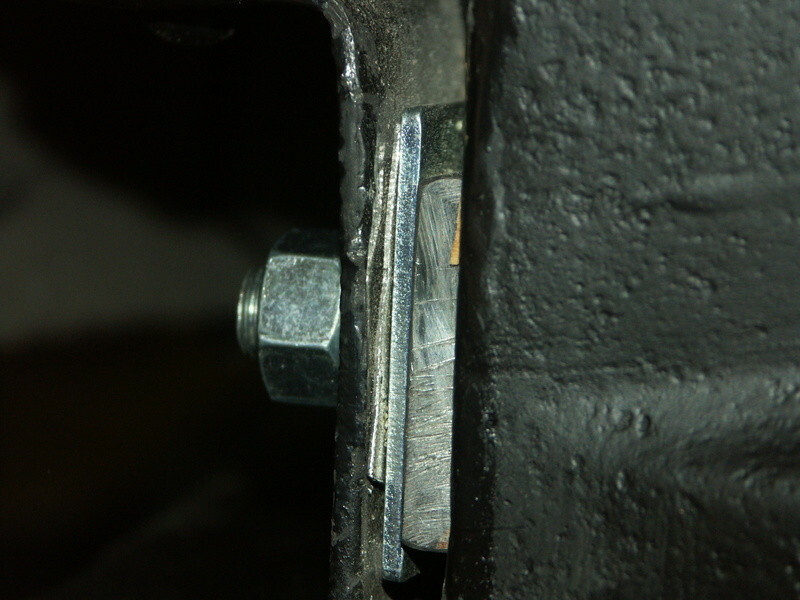 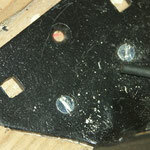 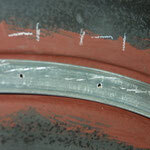 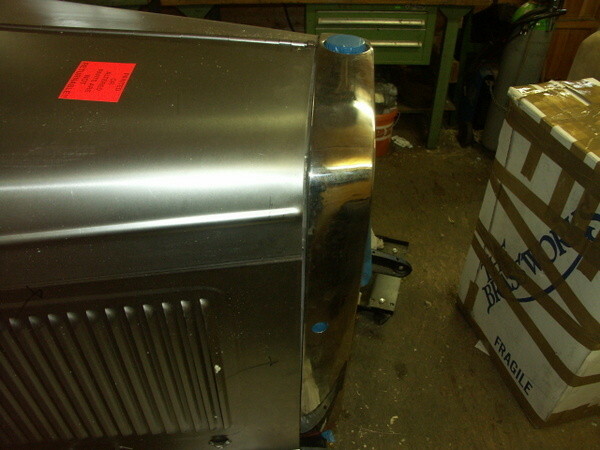 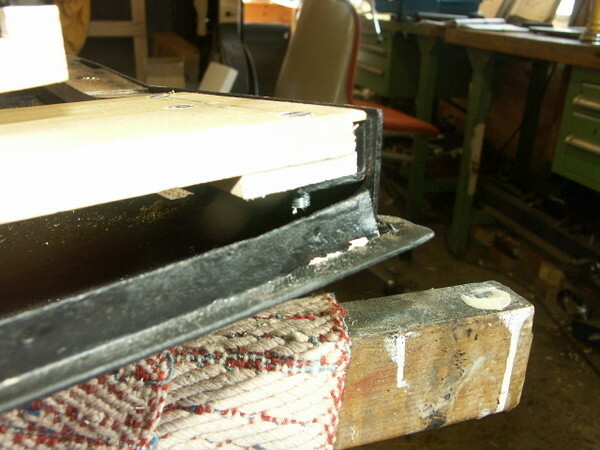 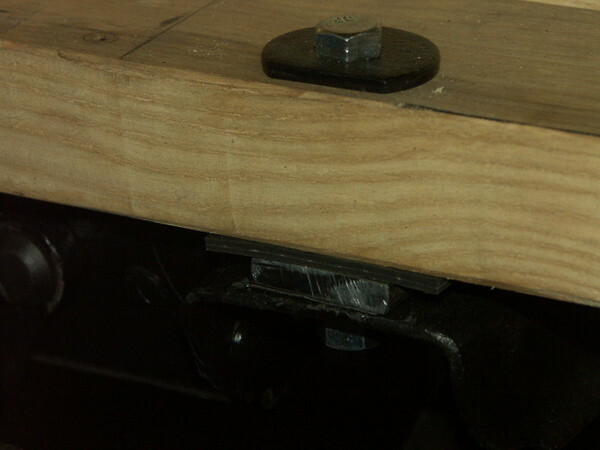 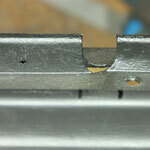 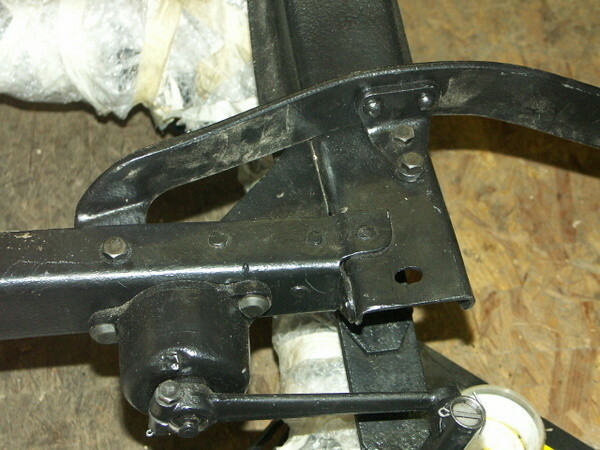 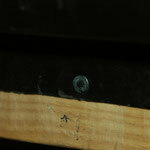 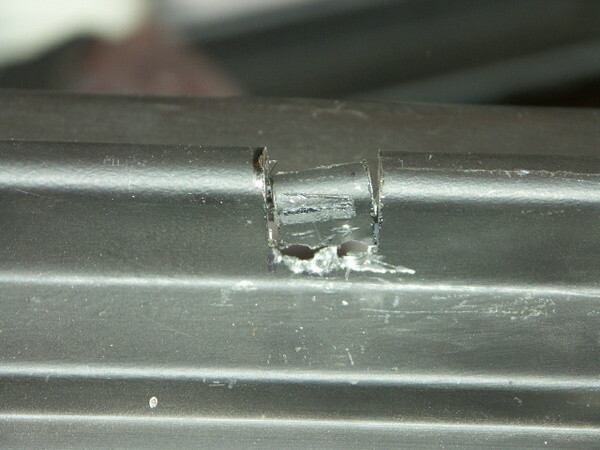 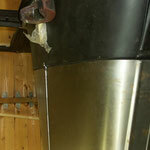 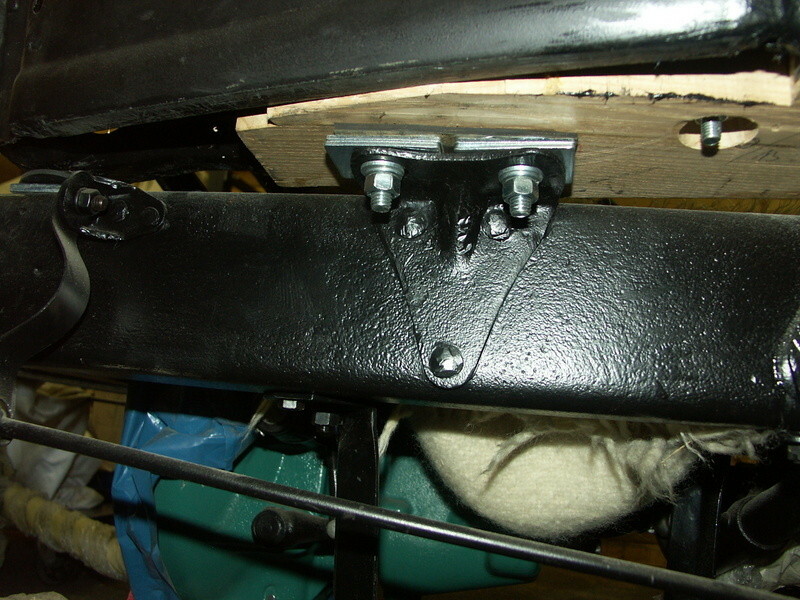 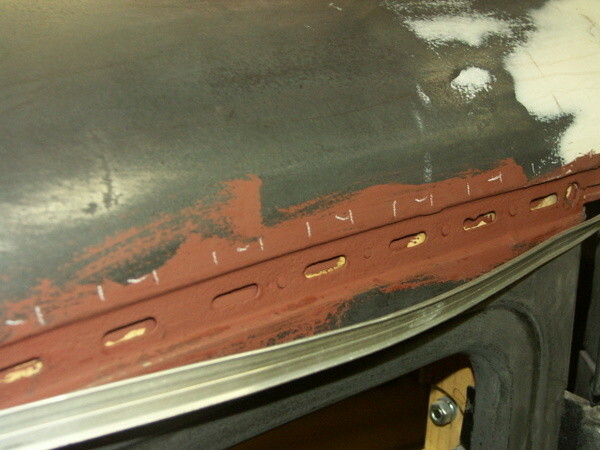 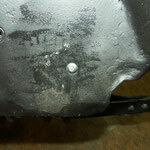 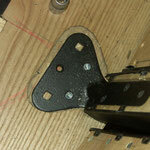 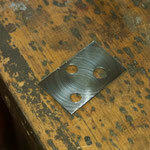 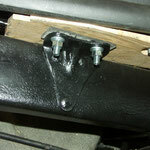 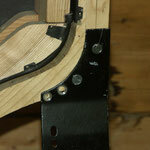 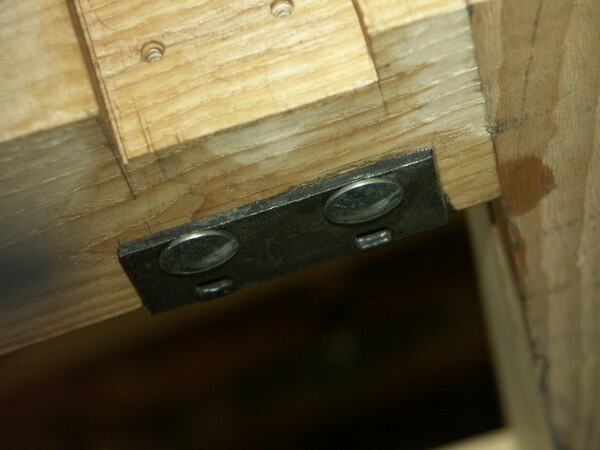 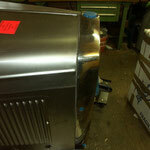 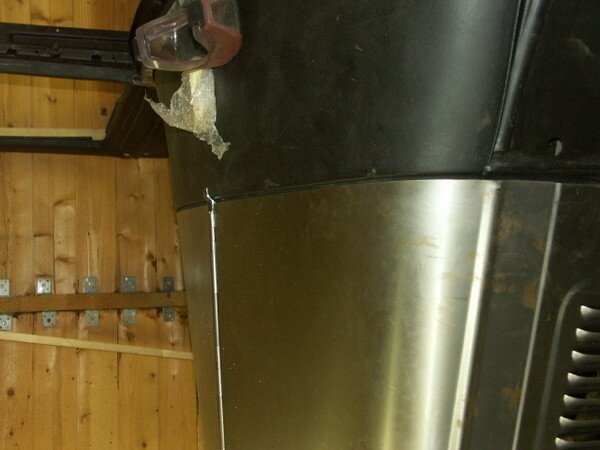 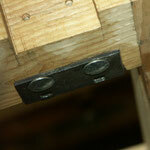 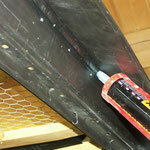 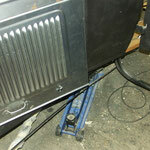 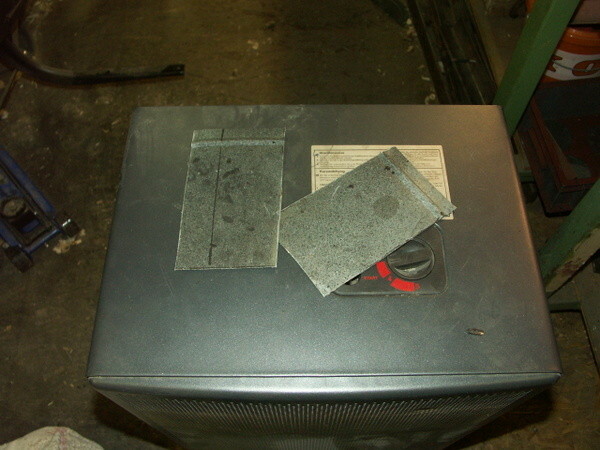 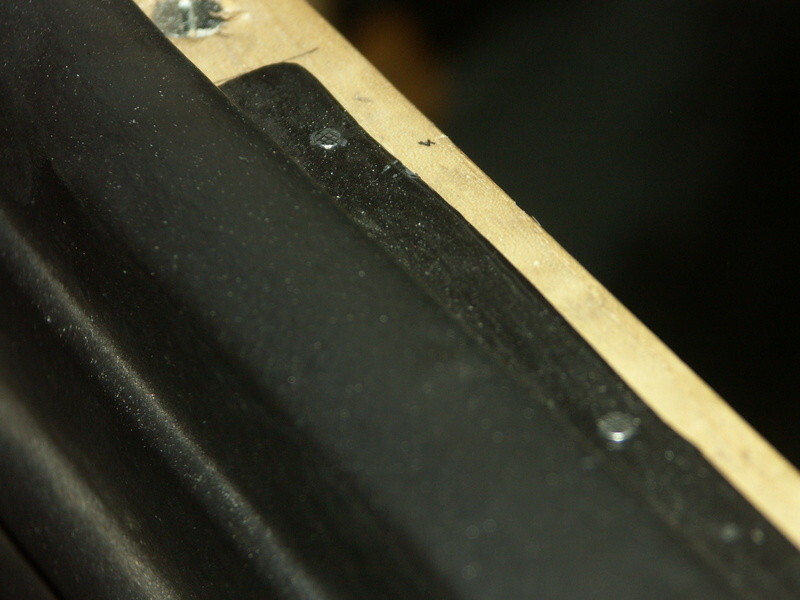 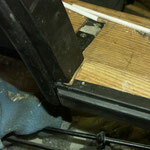 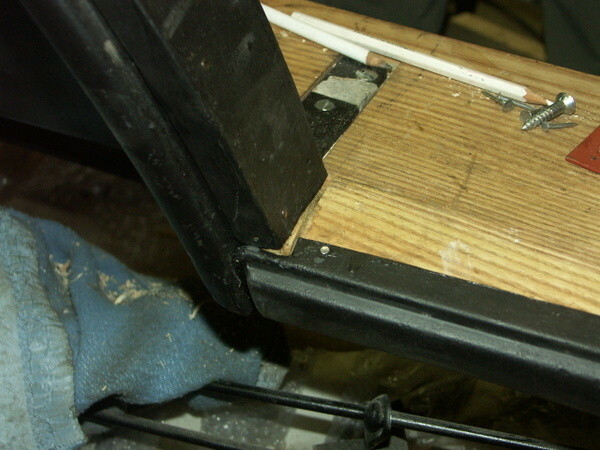 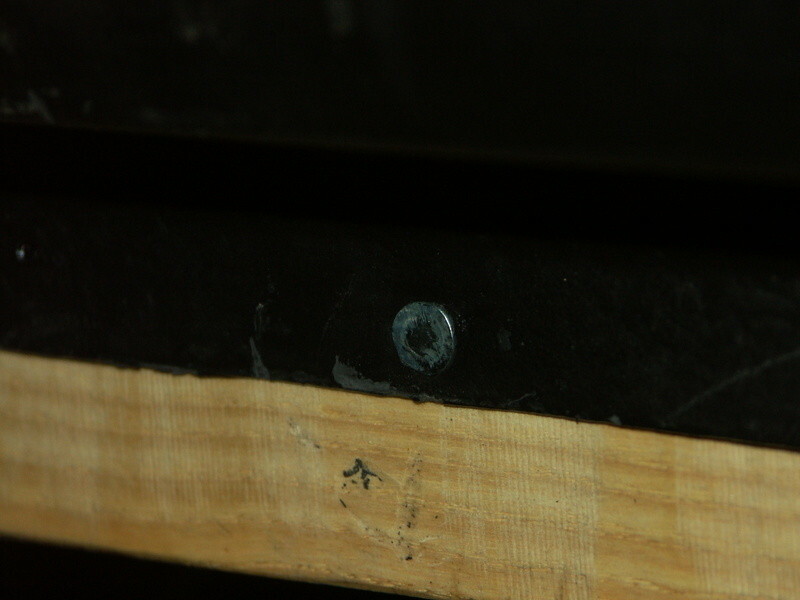 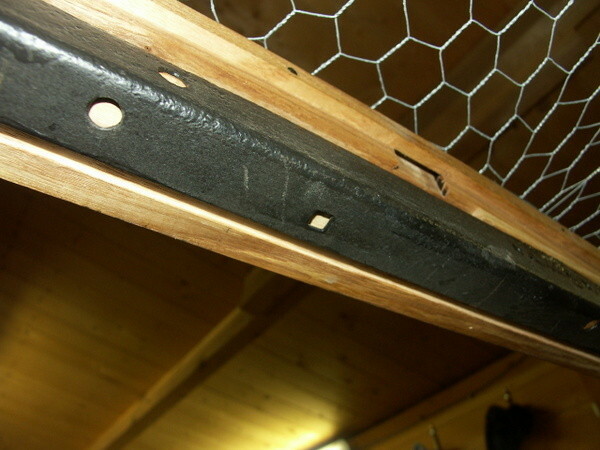 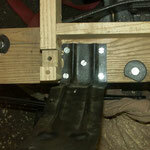 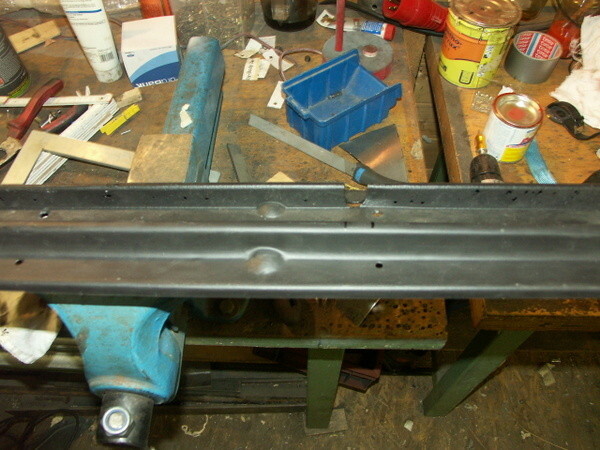 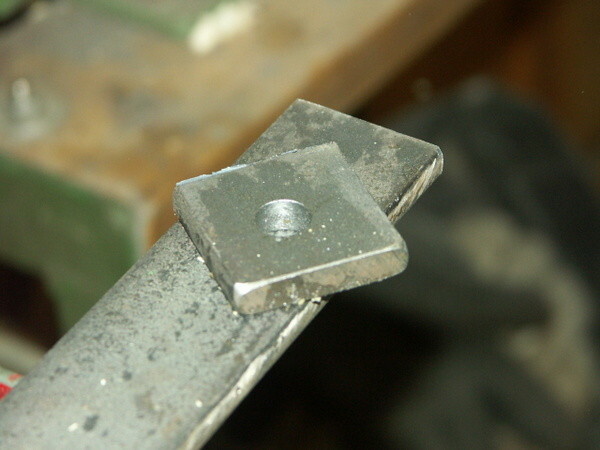 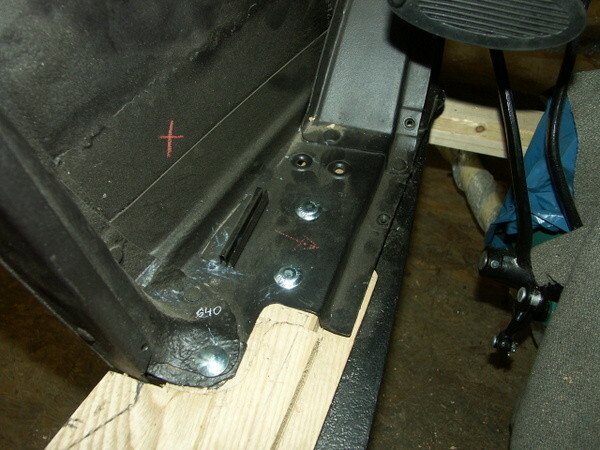 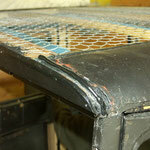 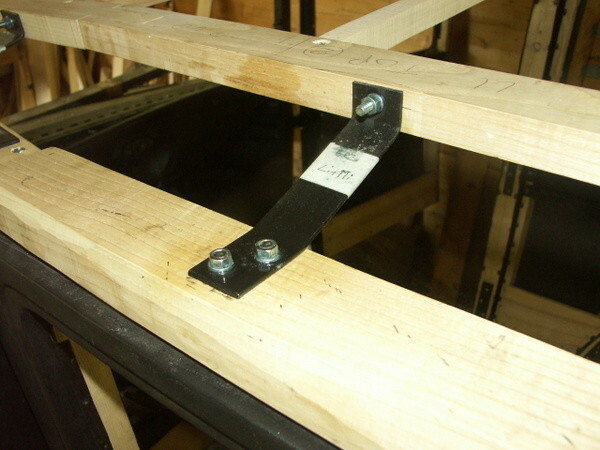 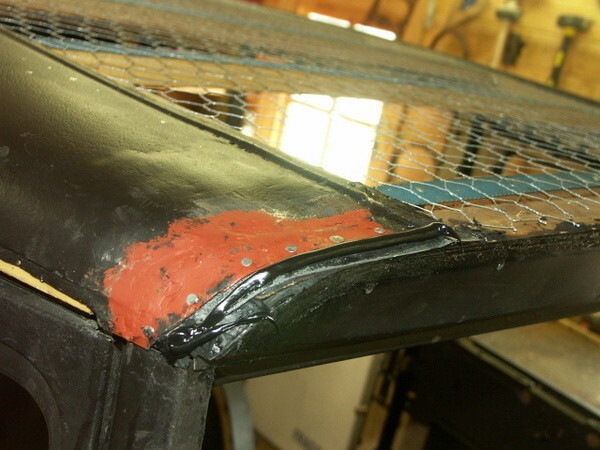 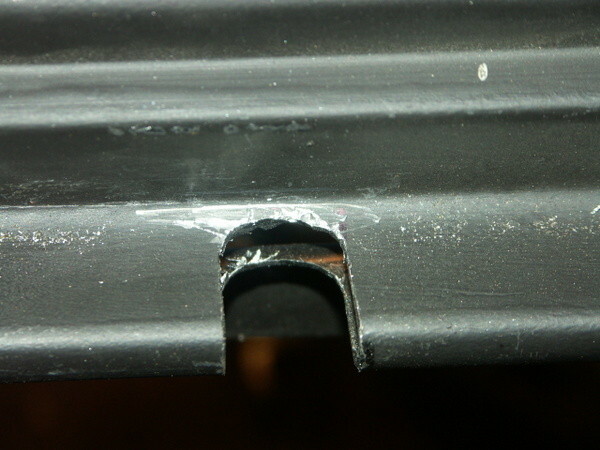 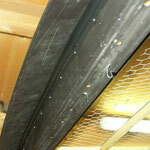 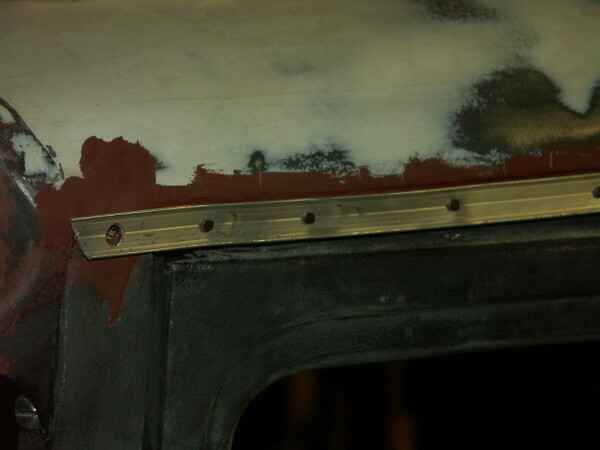 We think that for that reason two sheet metal pieces were welded on top of the corners to cover the bad fit. 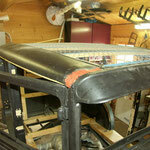 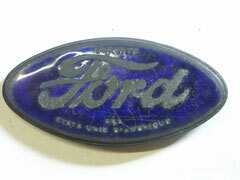 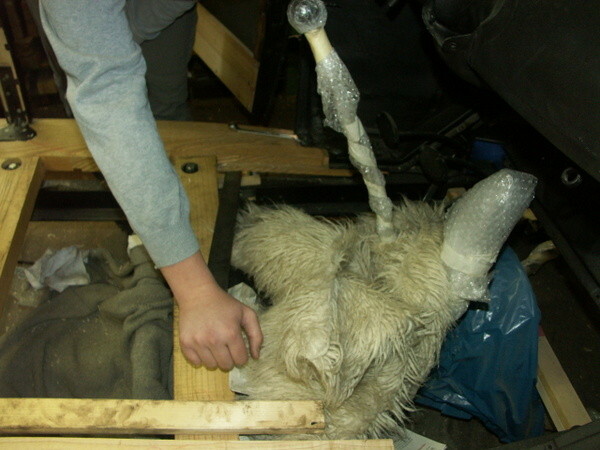 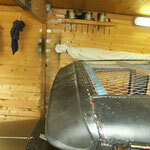 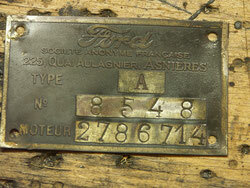 But the header and the cornes were among the worst conserved parts of the car (see Top). 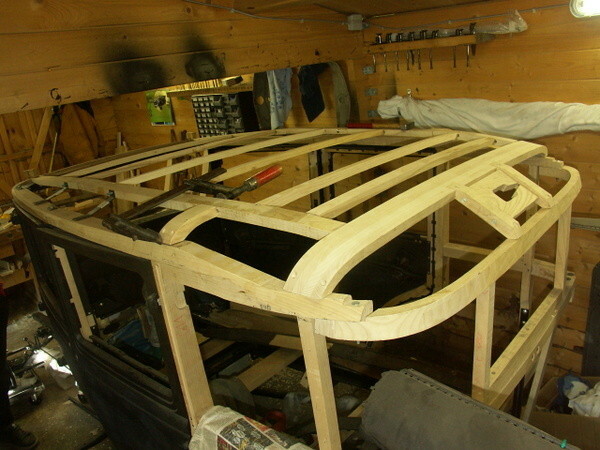 After long discussions and trial and error we decided to make the wood in a manner that it fits the cowl, and not to bend the cowl, as we feared the consequences for the fit of the hood. 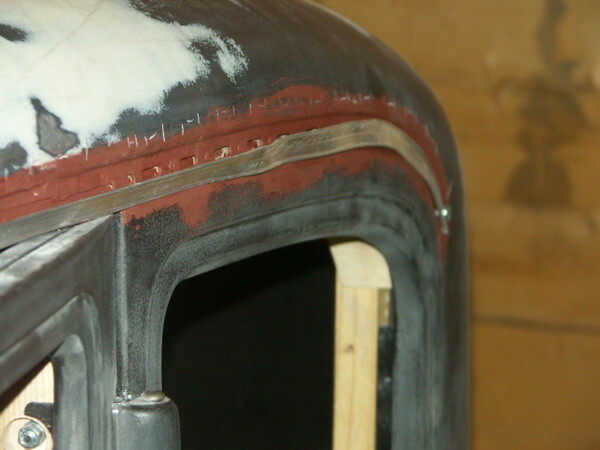 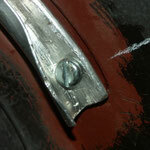 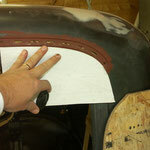 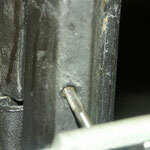 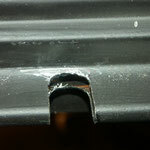 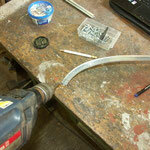 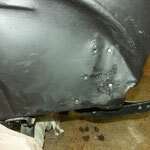 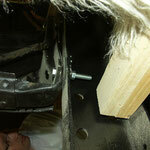 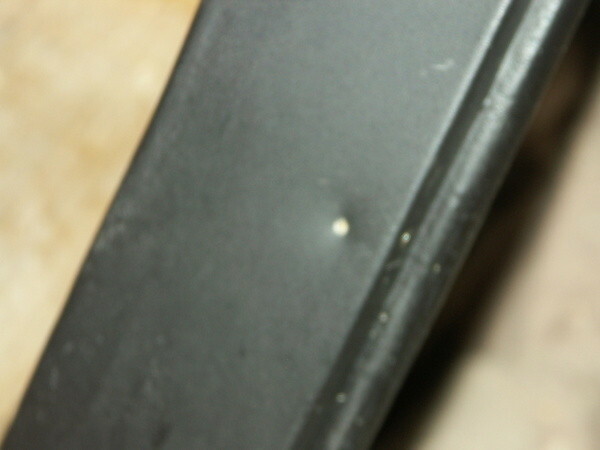 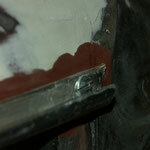 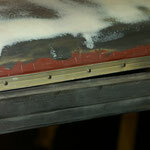 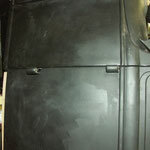 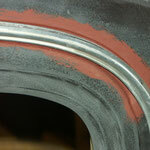 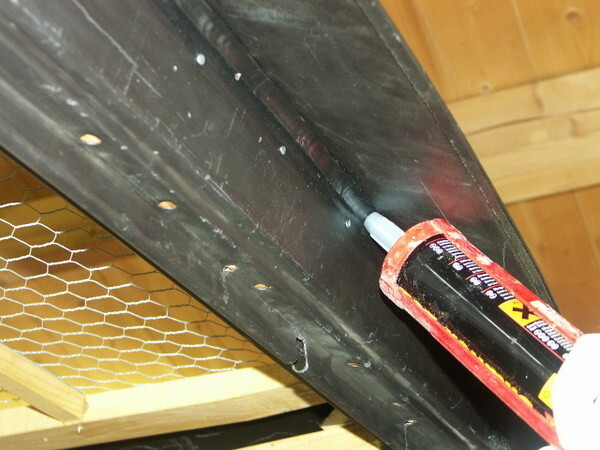 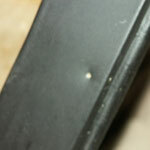 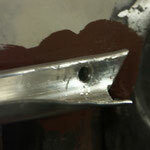 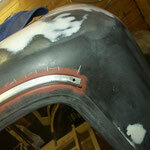 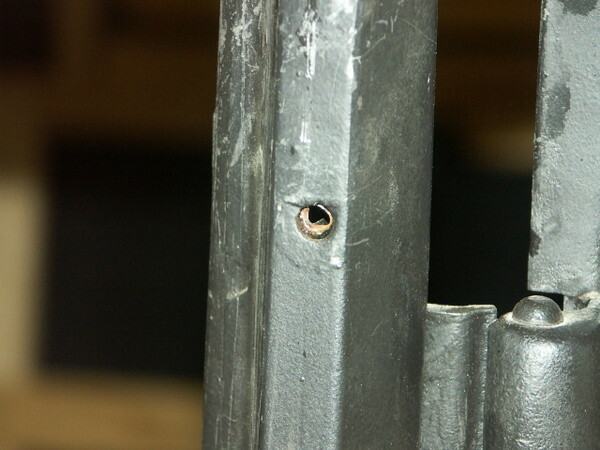 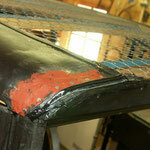 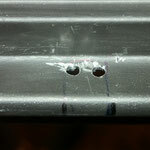 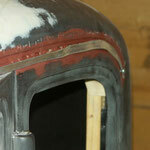 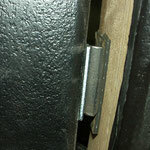 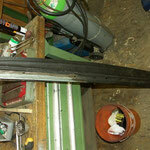 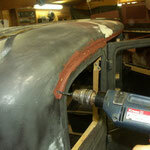 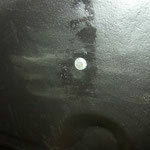 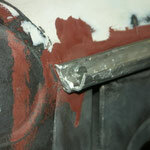 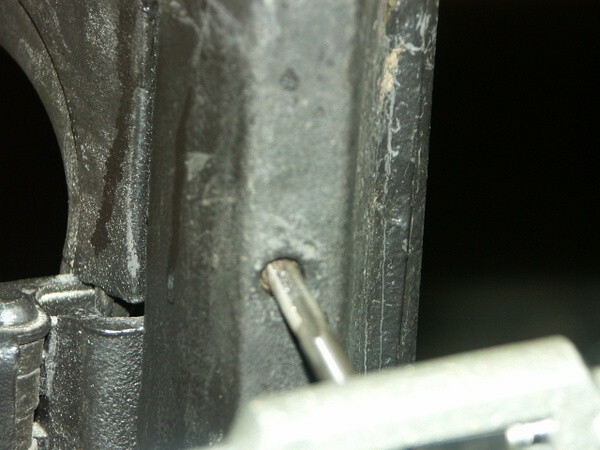 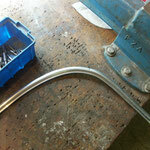 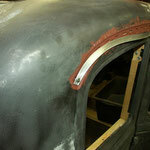 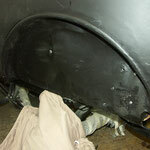 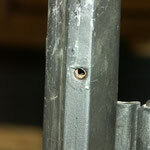 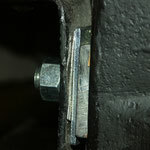 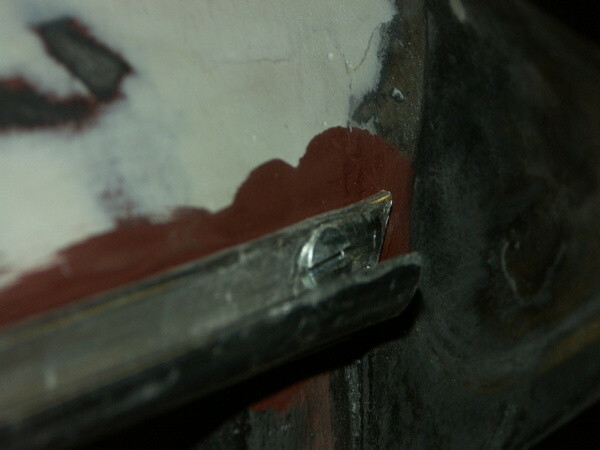 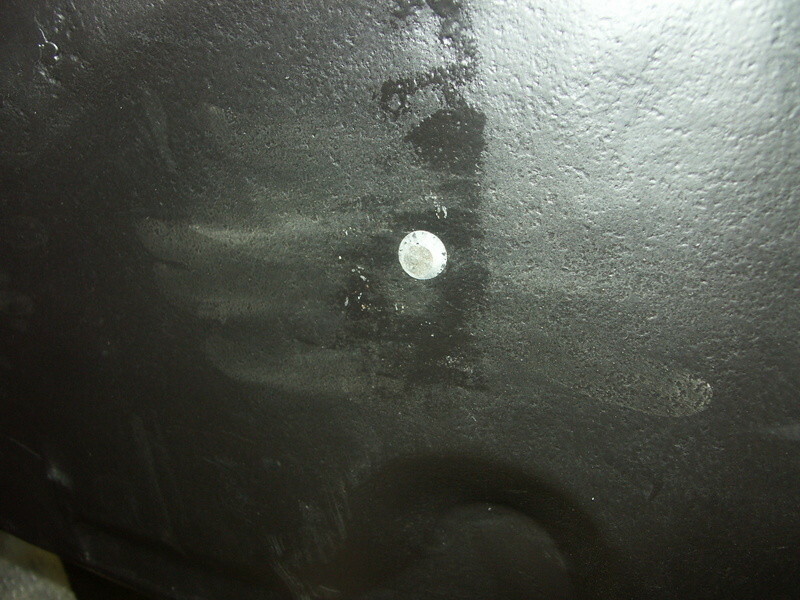 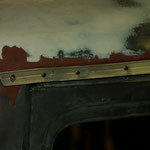 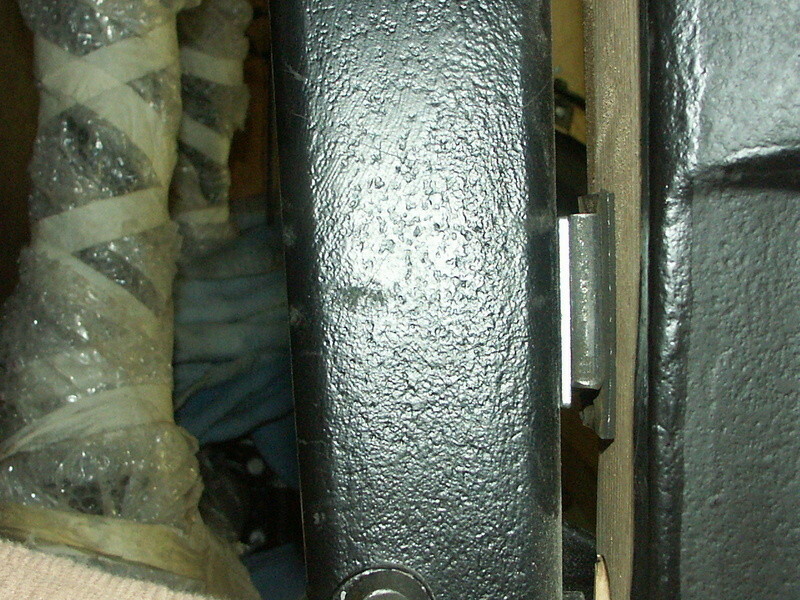 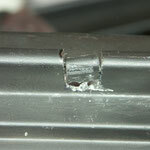 That means we had to weld a little piece of metal to the panel above the passenger front door. 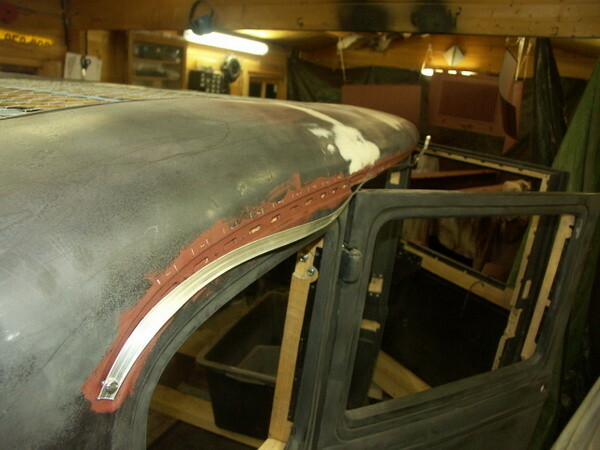 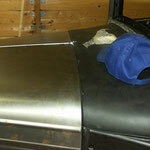 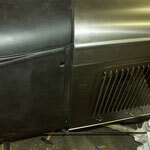 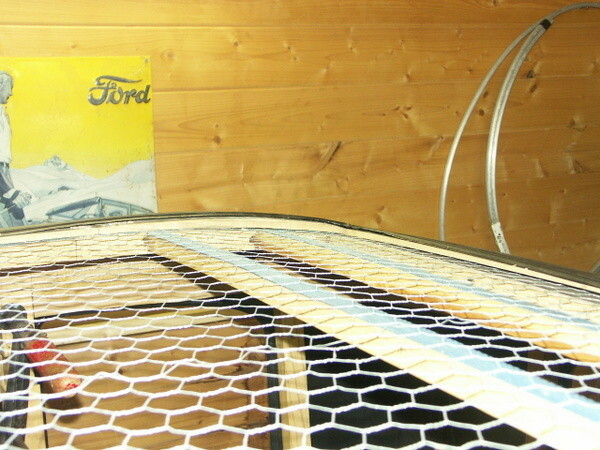 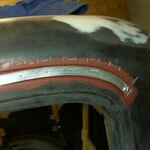 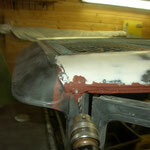 In the front corners we used to additional metal panels glued to the body panel and the sunvisor to achieve water-tightness. 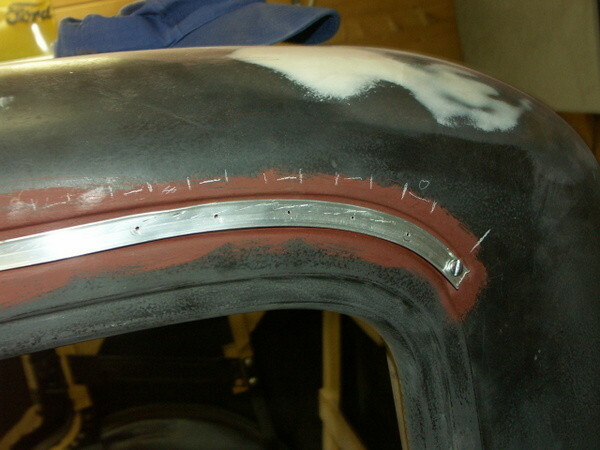 Firts make sure that the hood fits. 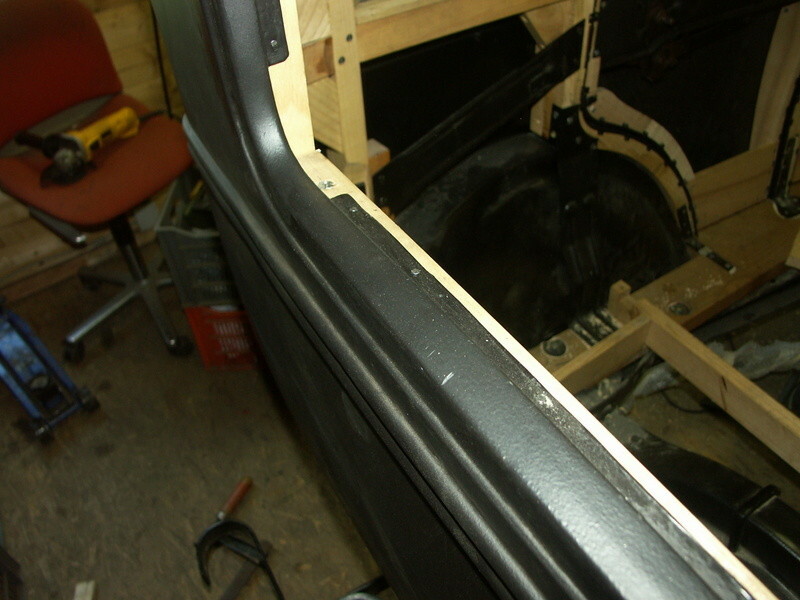 Then we adjusted the doors for a proper fit and uniform clearance. 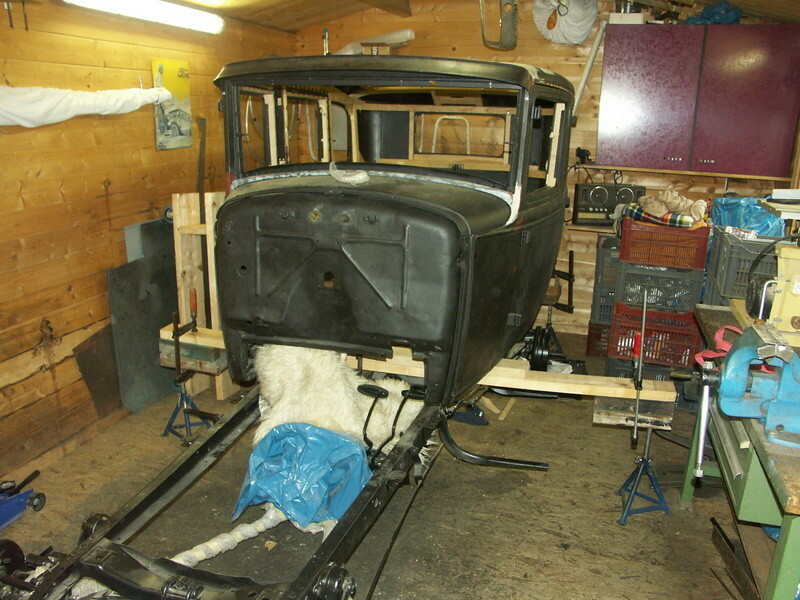 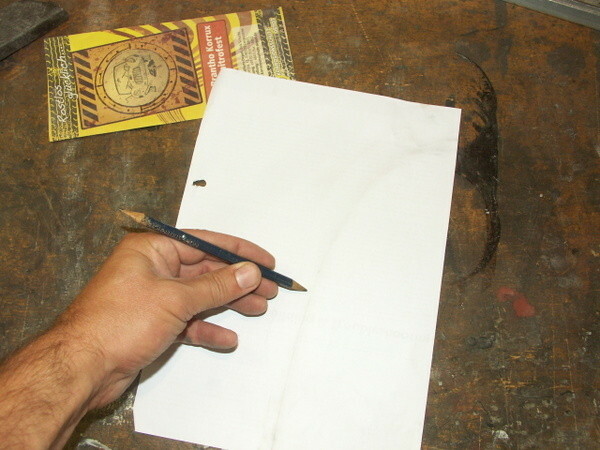 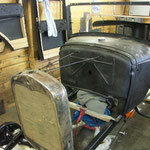 The idea is then to remove the body for filling and painting and bring it then back on the frame which exactly the same adjustments. 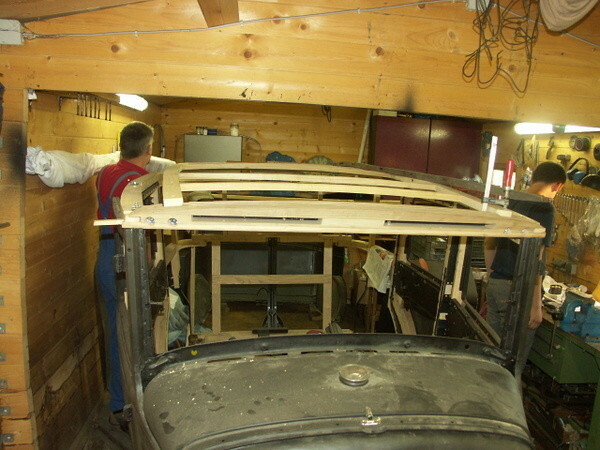 The hood aligment could be achieved by lifting the drivers side of the car for aprox. 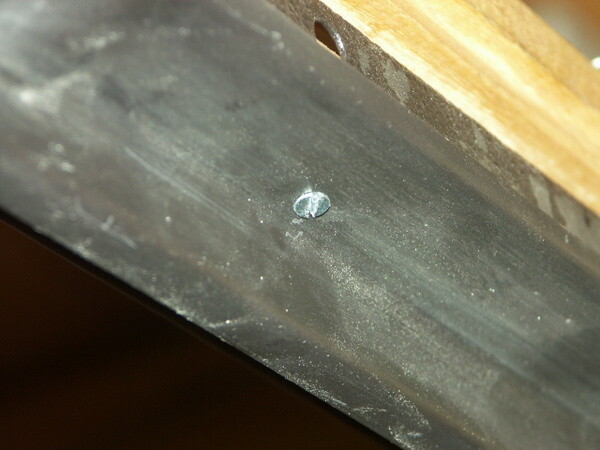 3/16 inch (5mm). 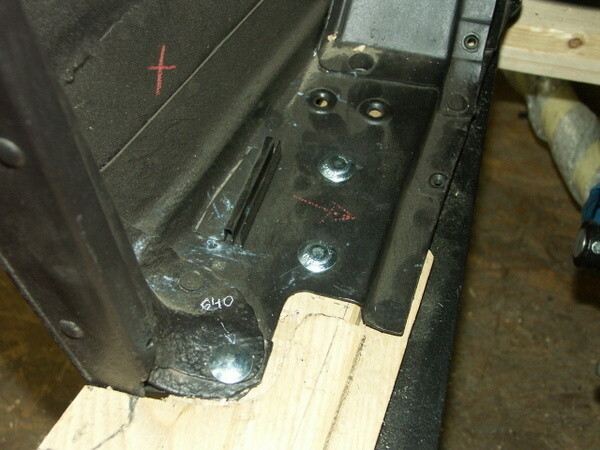 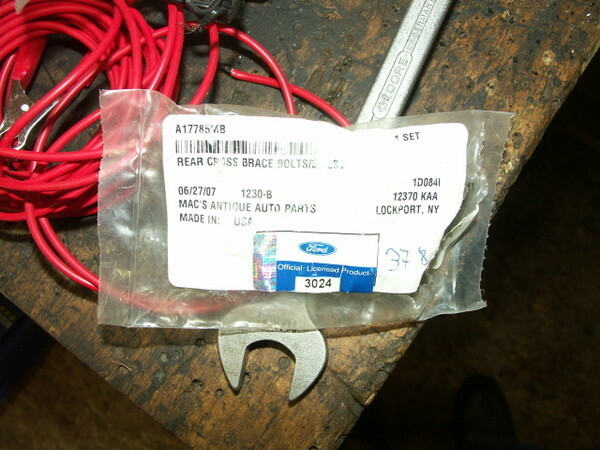 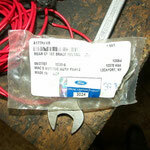 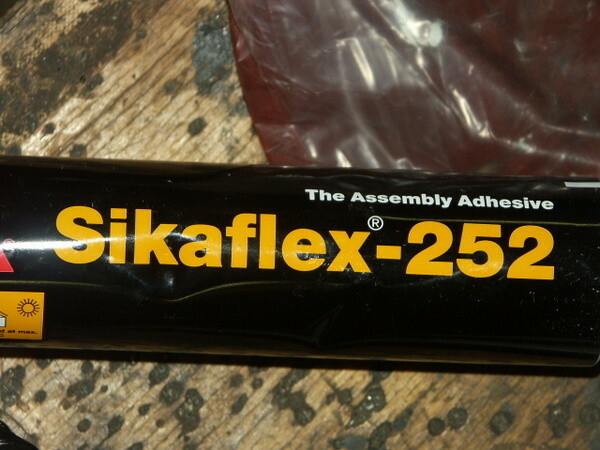 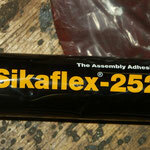 We used for that reason shims bought at Macs, two under each body bolt. 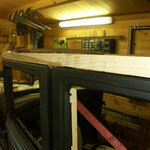 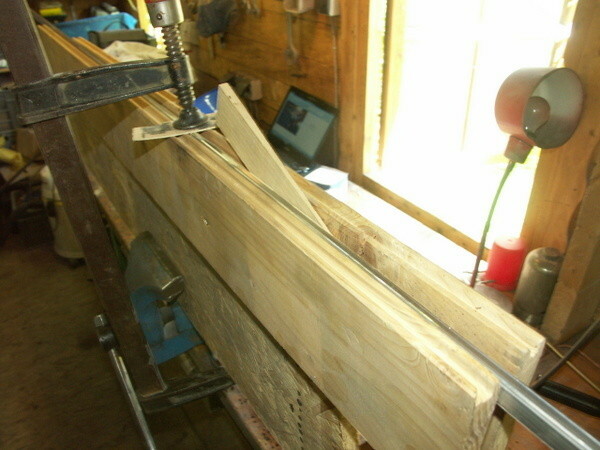 Last pieces of wood finished, around quarter windows.